Hello friends! 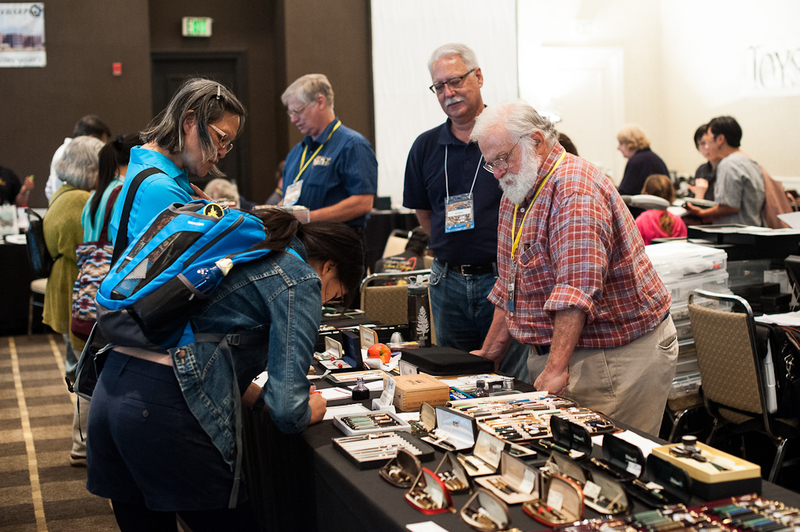 It has been almost two weeks since the 2016 SF Pen Show was held at the Sofitel SF Bay Hotel in Redwood City, California on August 26, 27, and 28, 2016. Oh what a great experience that was and I already miss it and cannot wait for next year. 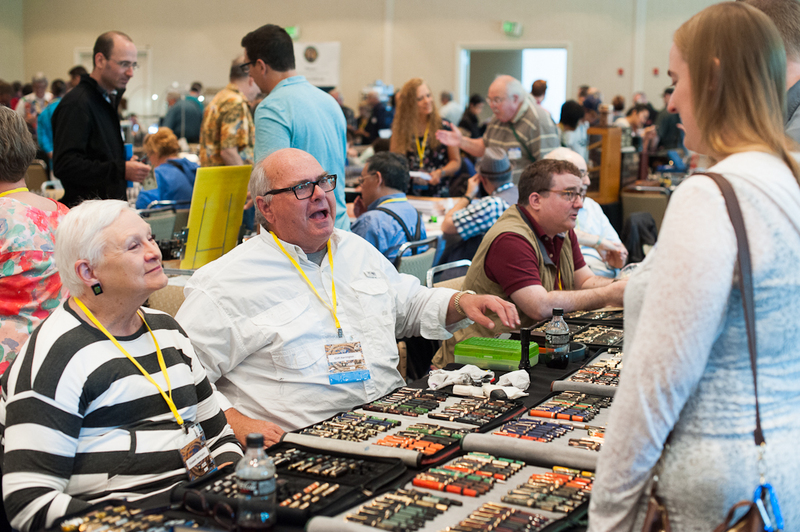 I have never done any pen show recap/reports ever since I’ve been attending pen shows in 2014. So it took me a while to decide if I would do one this year, and if so, how would I present it? I was nudged by a couple friends to do so (y’all know who you are). And as suggested by a friend, present it in a chronological order. A fair warning though, I’m a photo-oriented person so this report will have a LOT of pictures and quite a long read. So I suggest you grab some popcorn or something. Haha! 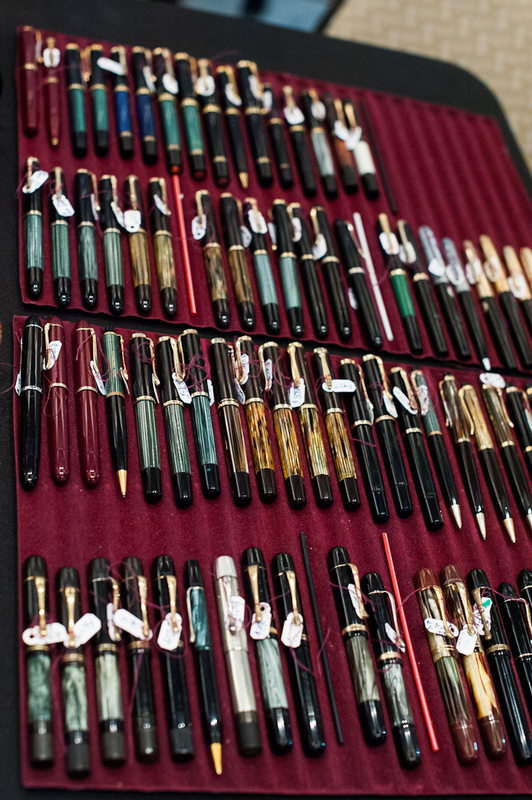 This is the third year that the current show organizers have held the SF Pen Show. And each year, it has gotten better and better. I did have a unique multi-perspective of this show. I purchased a table to be a vendor, I am part of the SF Pen Posse, the local pen group who had a big part of volunteering to make this show a success, and the principal show organizers asked or “volun-told” me to assist with the coordinating of the paid classes, and free seminars. 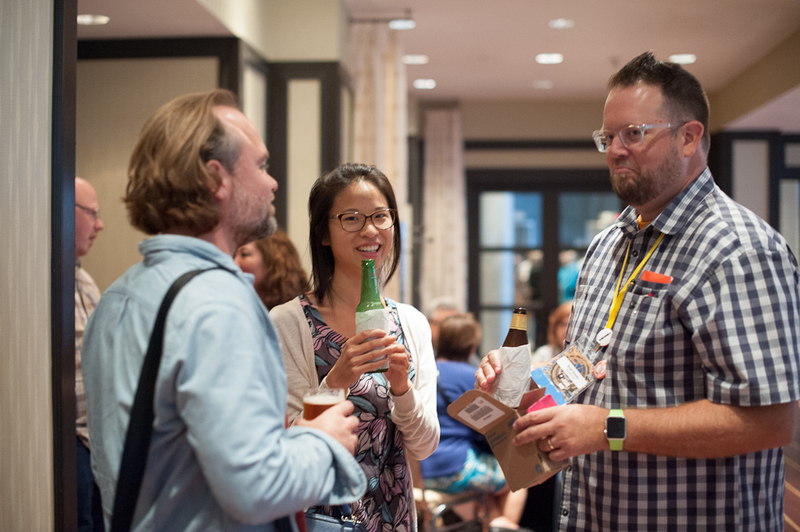 I’ve come to treat pen shows more as a social event focusing on seeing old friends, and creating new friends. 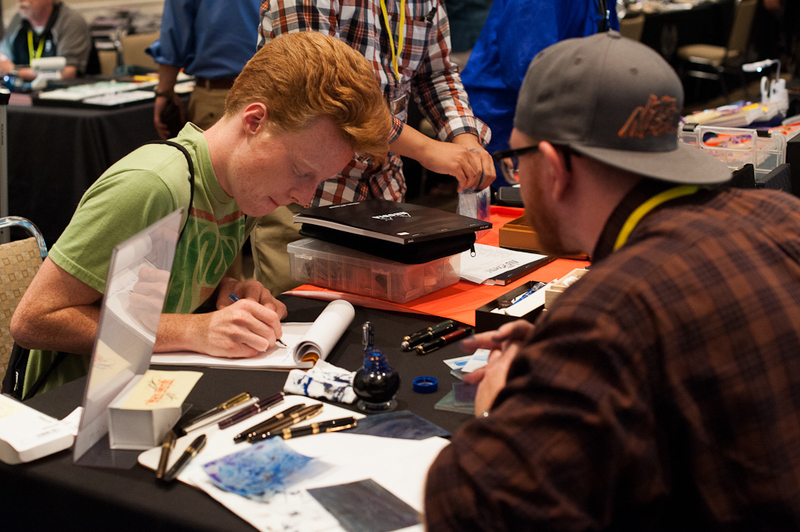 And yes, as an attendee, seeing lots and lots of fountain pens is something I look forward to as well. 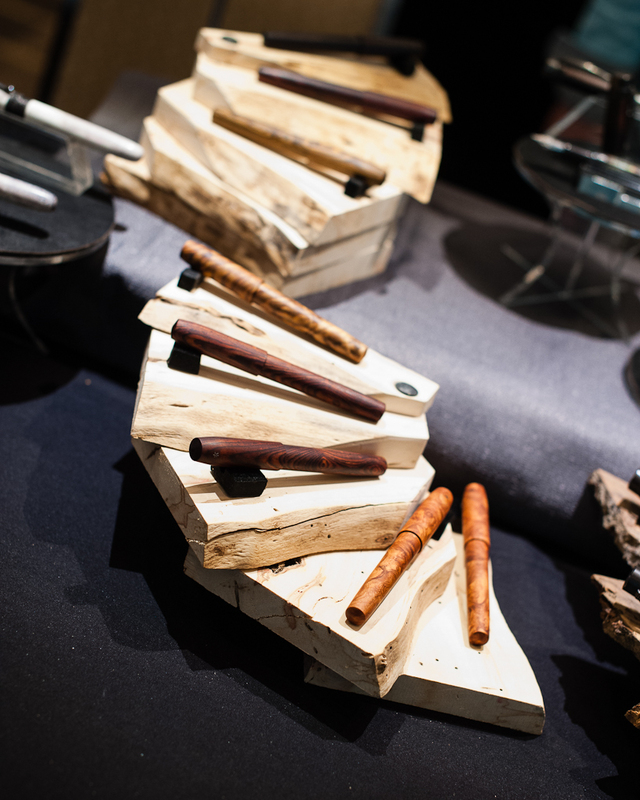 The SF Pen show organizers opens up the show ballroom the evening before to allow vendors to set up their table displays or just to let them know where their table will be. I arrived at the hotel around 6:30pm and saw the empty tables with just a few pen posse members hanging out. 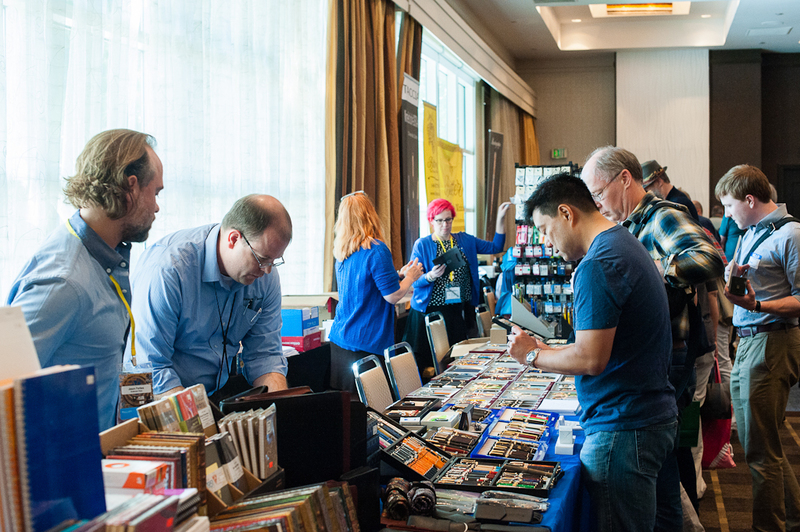 The show sold a lot of vendor tables this year. And I actually witnessed the hotel staff adding the very last table that was bought at the last minute. 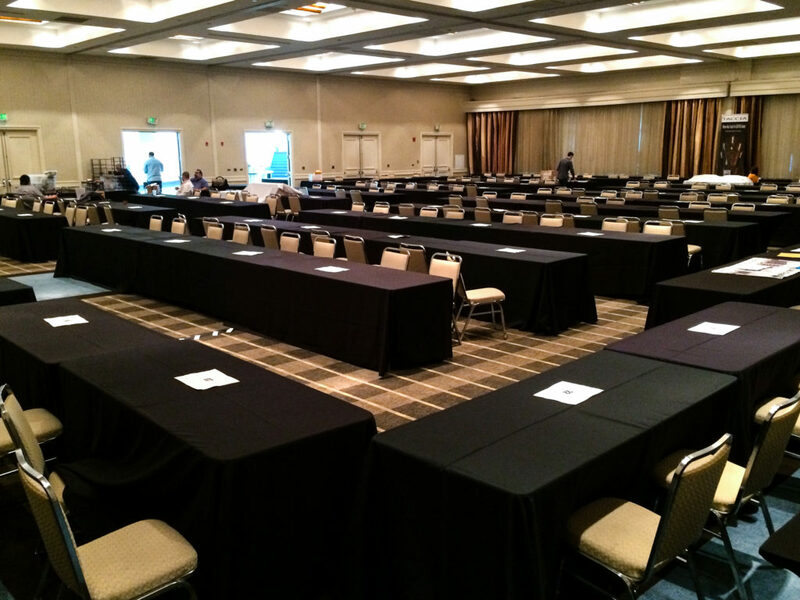 The SF Pen Show ballroom empty the night before. 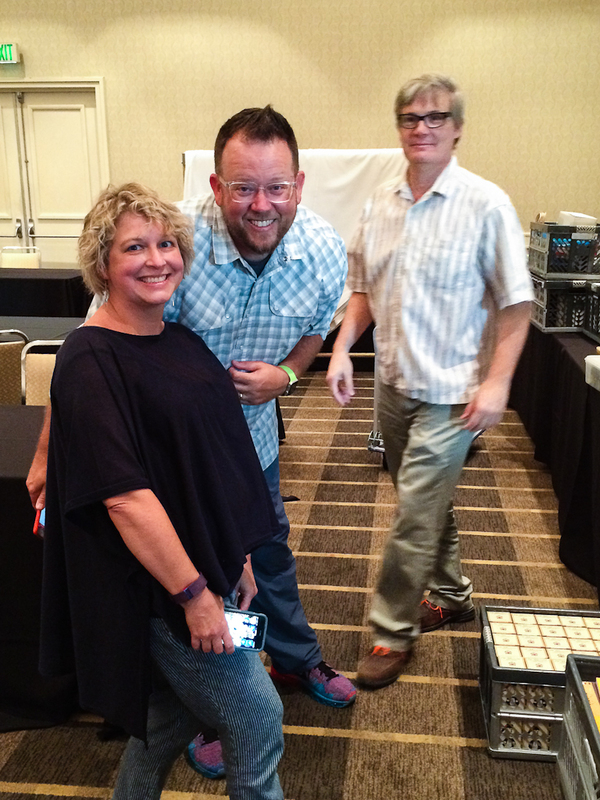 Lisa Vanness, Brad Dowdy, and Mike Vanness paused for a quick photo as they set up their table. 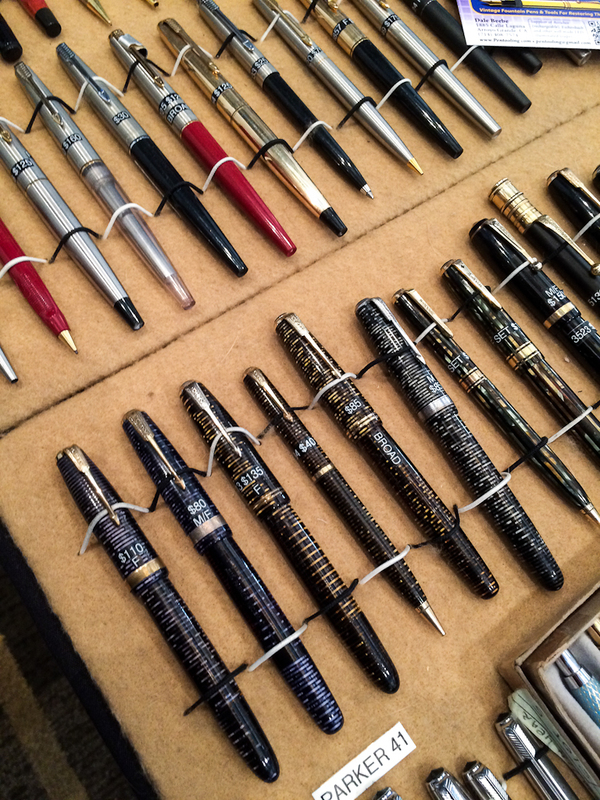 It’s wonderful to see them back at the SF pen show. 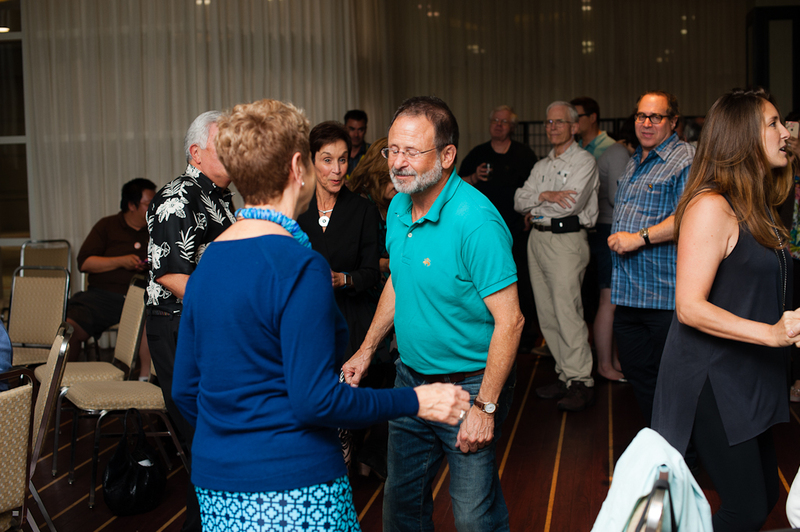 The show organizers also held a reception/mixer for dealers, and special friends that evening. 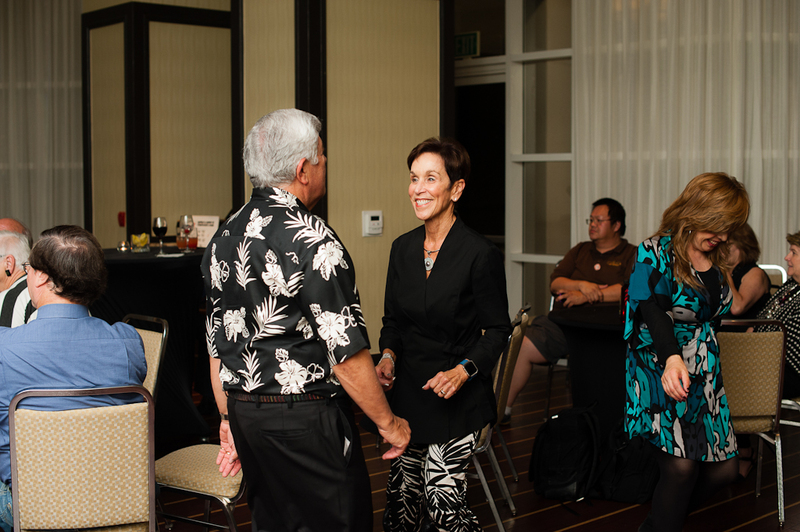 It was great to mingle and meet up with old friends. 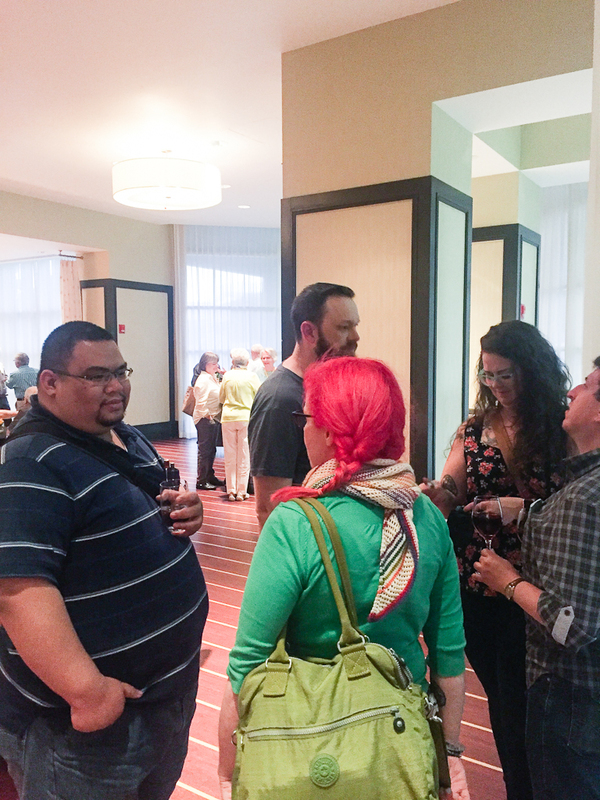 After the reception, a few friends from Southern California and myself just hung out at the hotel bar. 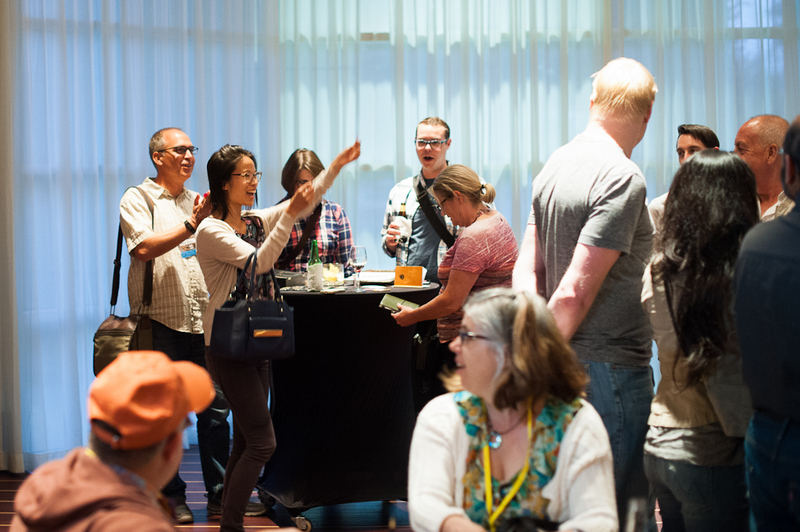 At the reception, I got to meet Ana Reinert of Well-Appointed Desk blog, Paul from Karas Kustoms, Amanda McKay (who taught the Snail Mail class), and Daniel T. from the Los Angeles area. Photo by Ricky Chau. 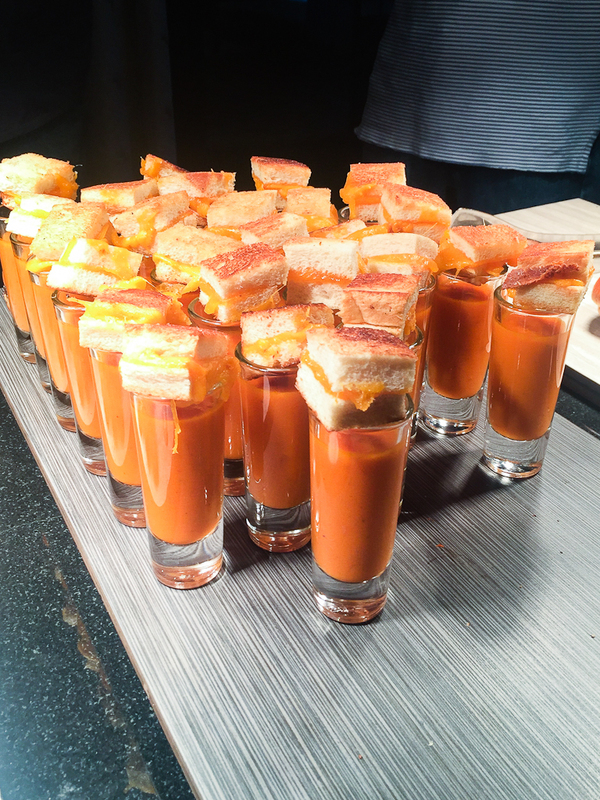 Grilled cheese and tomato soup. One of the delicious food items prepared for the reception. Photo by Ricky Chau. The big day has arrived! 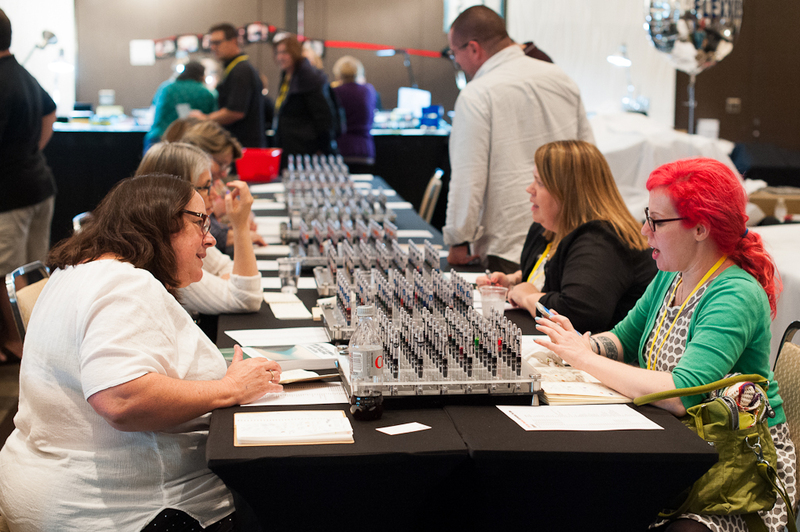 The San Francisco Pen Show opened for Dealers and All-Access Pass holders at 7:00am. The general public was let in later that day at 1:00pm. 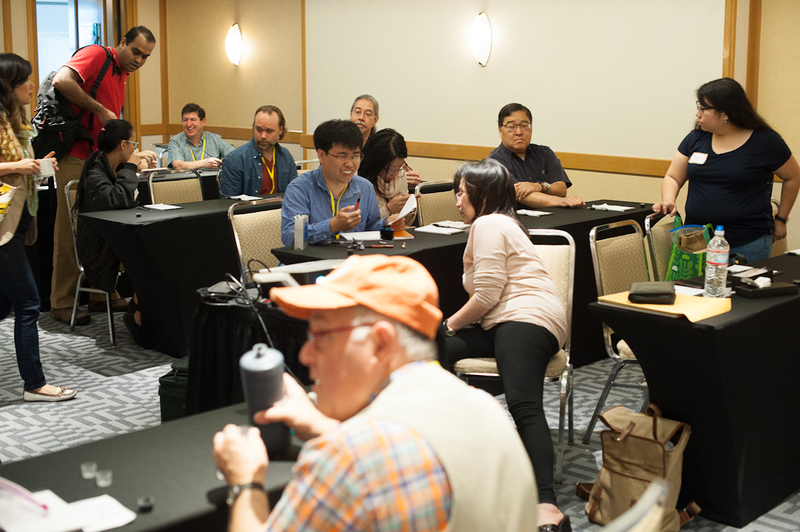 I arrived at the hotel around 7:30am and the ballroom already had a good number of attendees. 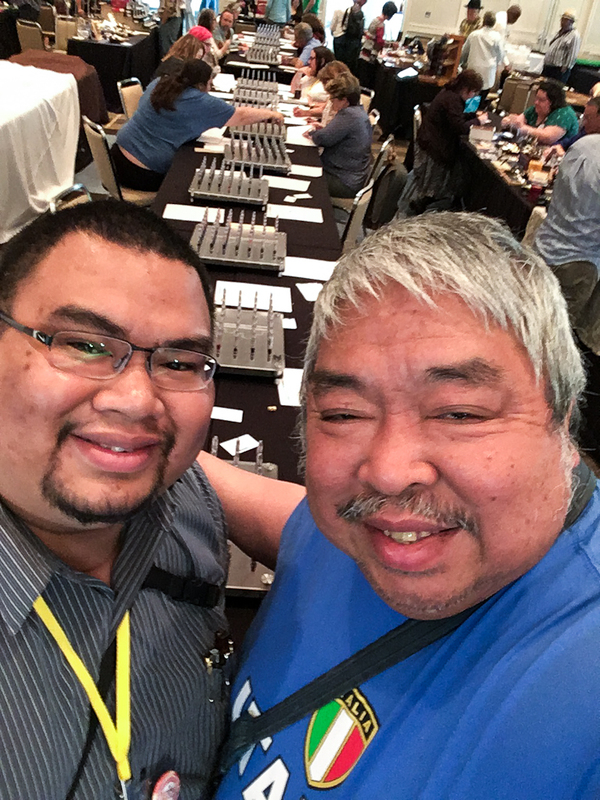 After doing some of my registration desk/seminar coordinator responsibilities, I immediately went to Mike Masuyama’s table where he was already helping people with their nibs. I got to say hello and speak with Mike and his wife Emiko for a bit and got a number to be in line for nib work. I was number 19 and this was only at 8:00am. More on my nib-work with Mike later on the day. 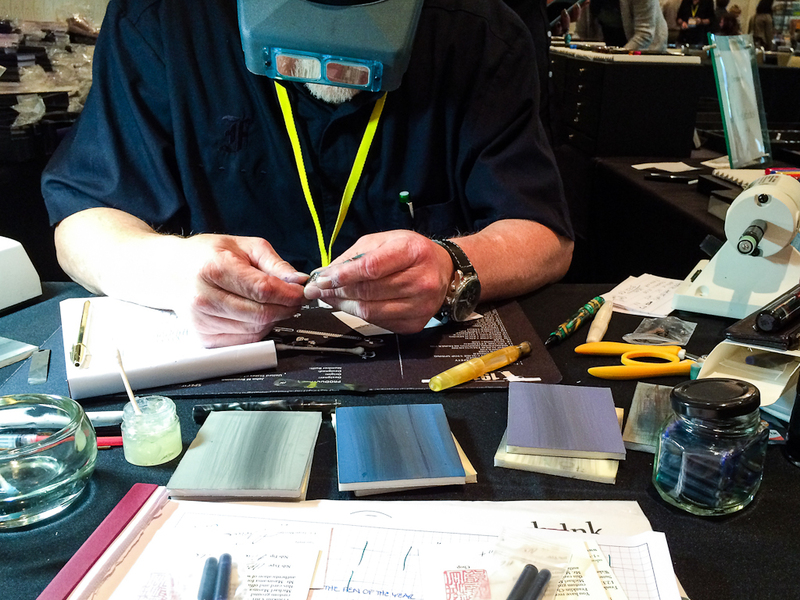 Next stop for me was at Franklin-Christoph’s table. 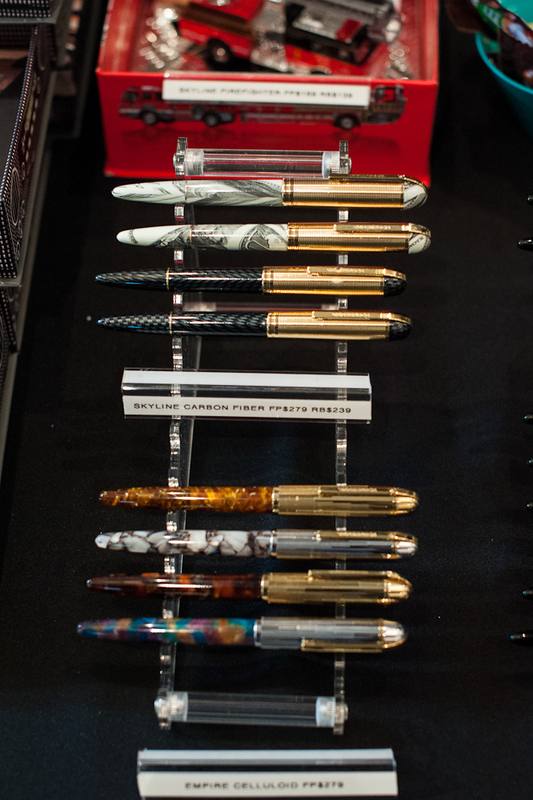 I was curious to see what prototype pens they brought to the show and also I was asked by a friend from Nevada to purchase a specific pen from them. Guess who I found at the F-C table? It’s Katherine! She was already being helped by Jim Rouse with her nib choice. She was at the hotel right before the show opened. Some of the Franklin-Christoph prototype pens. Jim Rouse hard at work to make sure customers love how their new pens write. 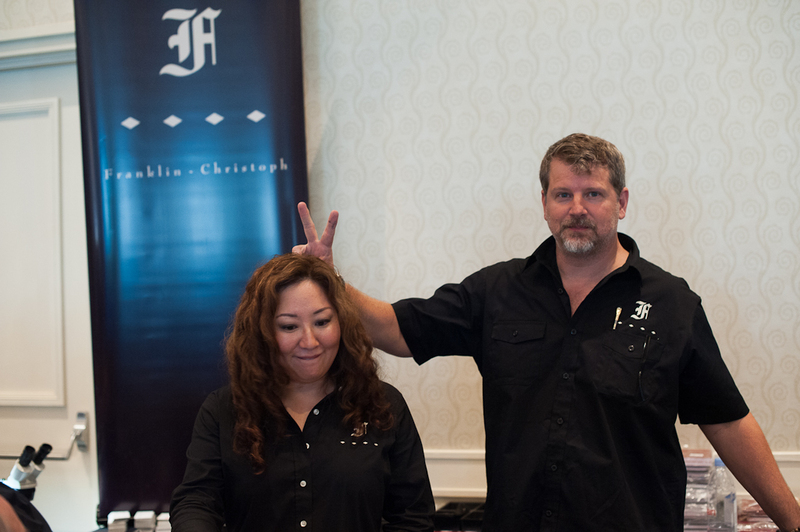 It was Tania’s first time to work at the Franklin-Christoph table and I think Scott approves! 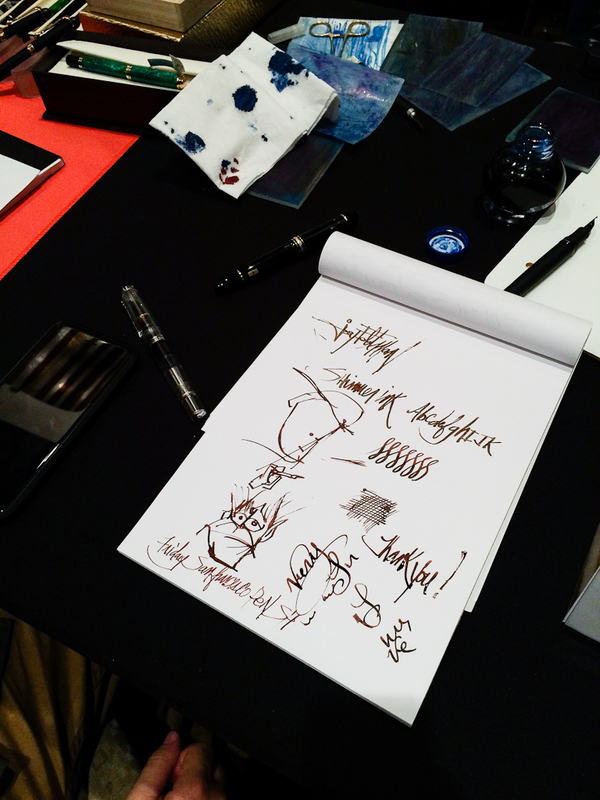 My friend Mike H. testing out the different nibs that F-C had to offer. Haven’t seen him since last year’s show. My first pen purchase was a Franklin-Christoph Pocket 66. And it wasn’t mine. Haha! 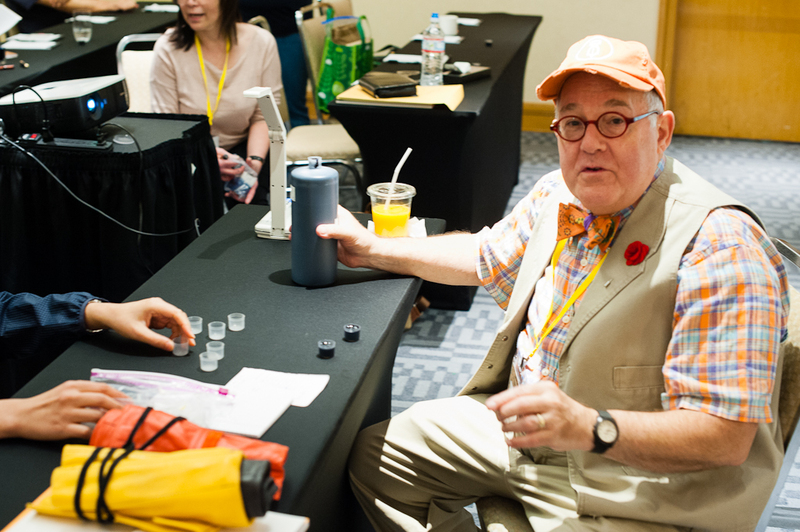 #penshowmule. 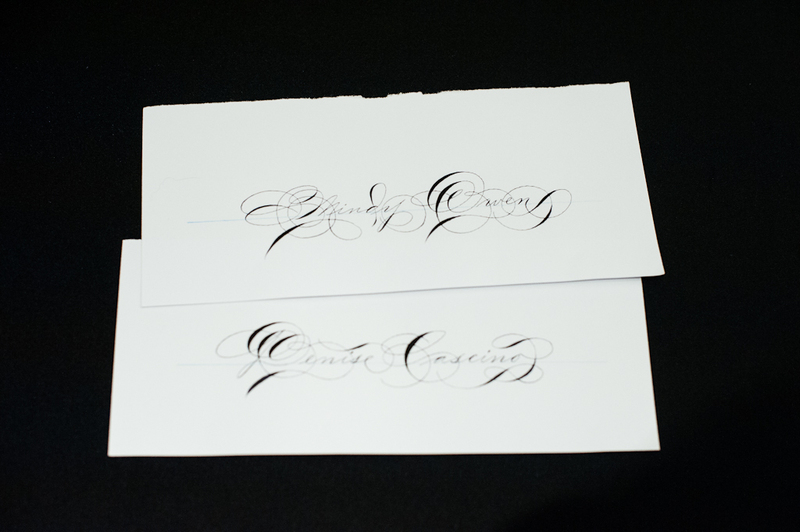 It was fun sitting with Jim and chatting while he worked on that Fine cursive italic nib. Afterwards, I needed to go back to the registration desk since Master Penman Michael Sull’s Basic Spencerian class was about to start. 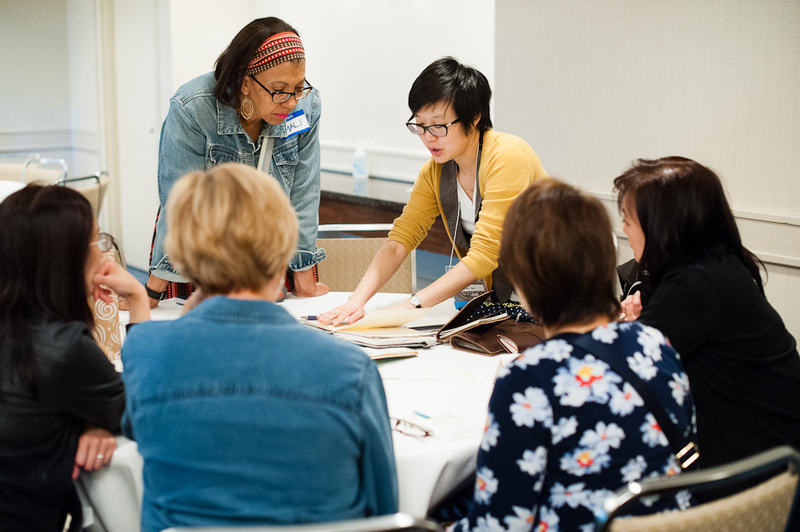 This class was sold out a couple weeks before the show with a few people on a wait-list. Mr. Sull had another class later in the afternoon called Advanced Spencerian and that was well attended too. 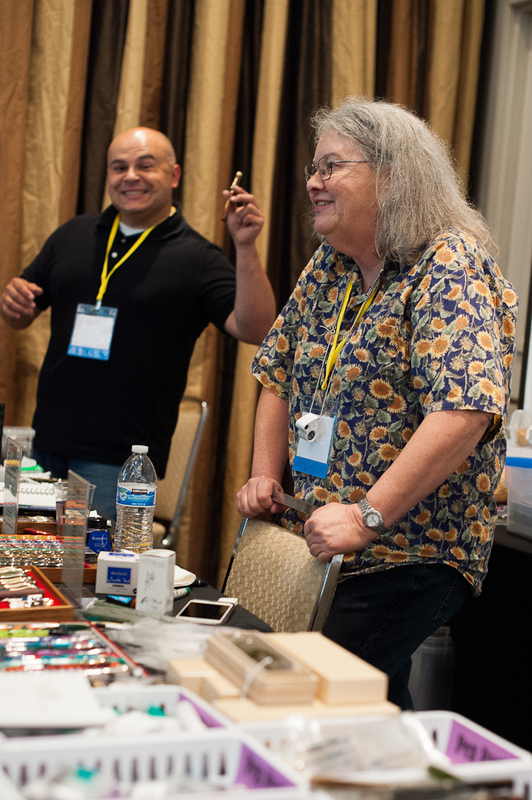 Pen repair classes were also held by brother and sister, Joel Hamilton and Sherrell Tyree. 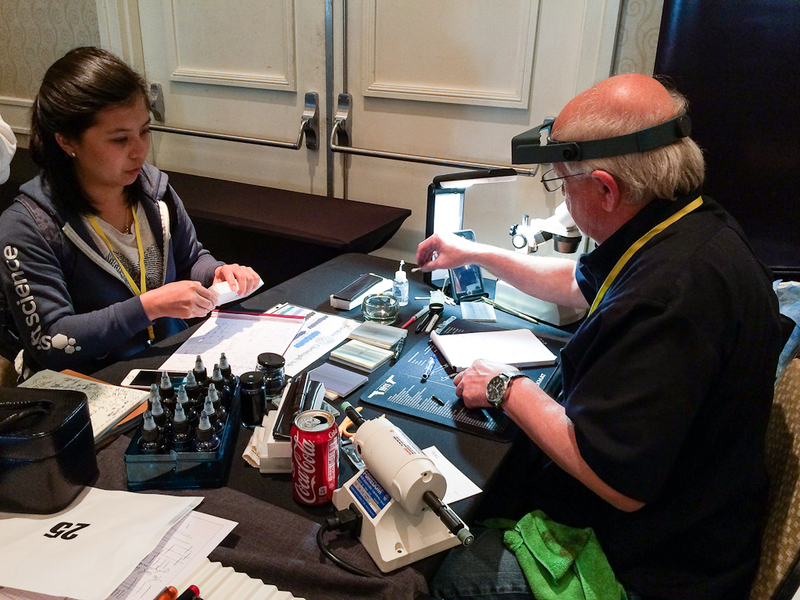 There were three sessions: Basic pen repair, Vacumatic, and Snorkel/Touchdown. 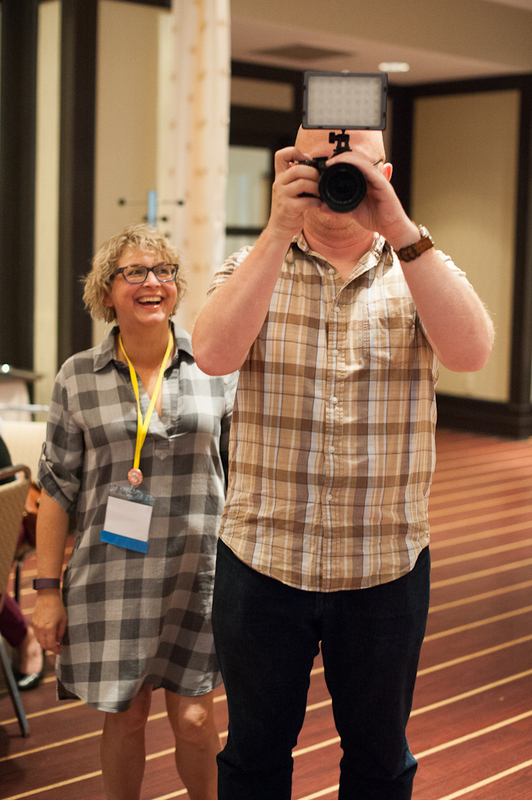 One of the first couple people I said hello to were Matt Armstrong of The Pen Habit blog, Brad Dowdy of The Pen Addict blog, and Lisa Vanness of Vanness 1938. Matt and Brad were there to help Lisa and Mike out at their table. 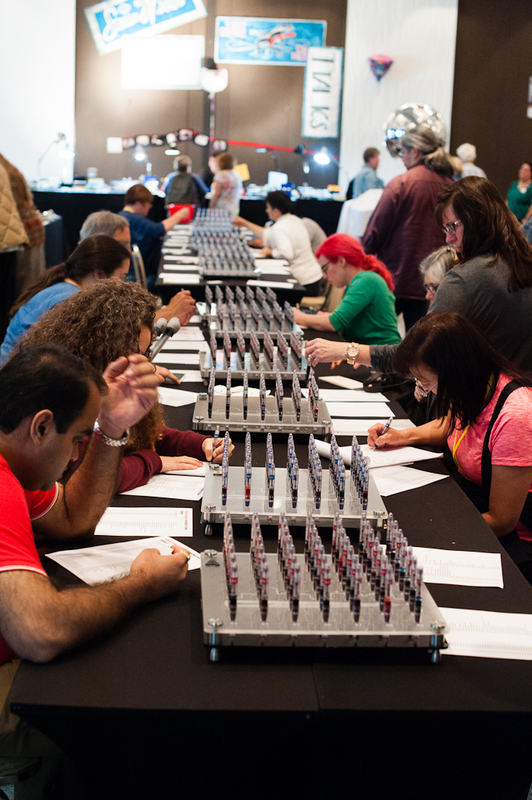 In the middle of the ballroom were the tables for the 14 Ink Testing Stations that contained 686 pens with 686 different fountain pen inks free for people to write with and see how the color looks. 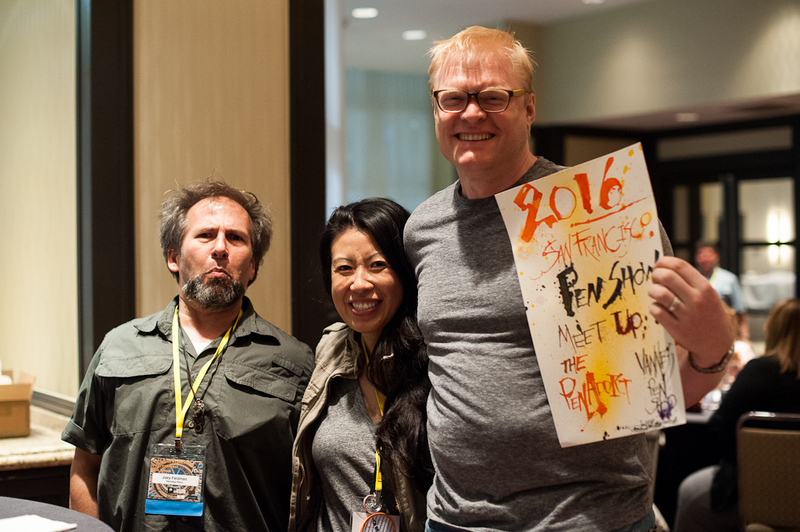 The SF Pen Posse donated ink samples and volunteers inked up each station before the show. Each station has 49 fountain pens. The ink testing stations weren’t crowded yet. 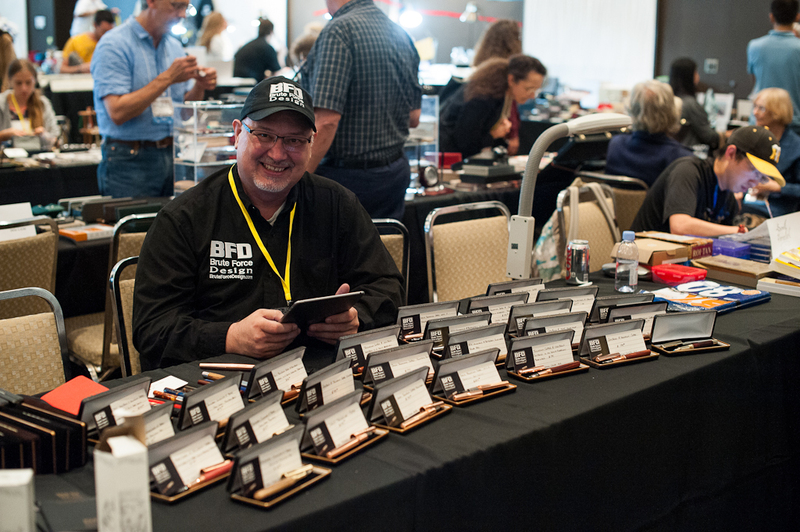 First time pen show vendor, Troy Clark of Brute Force Design was there with all smiles. He drove all the way from Seattle and was one of the people I got to chat with last night as well. He gave me a nice pocket notebook. What a nice gesture. Thanks Troy! Troy Clark of Brute Force Design. He had a nice array of pens for sale. 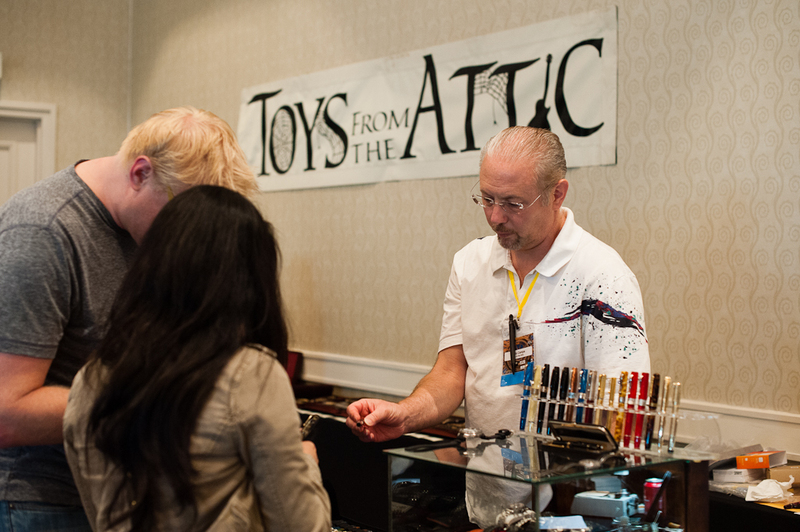 Toys From The Attic returned to the SF Pen Show and they were right beside Franklin-Christoph. 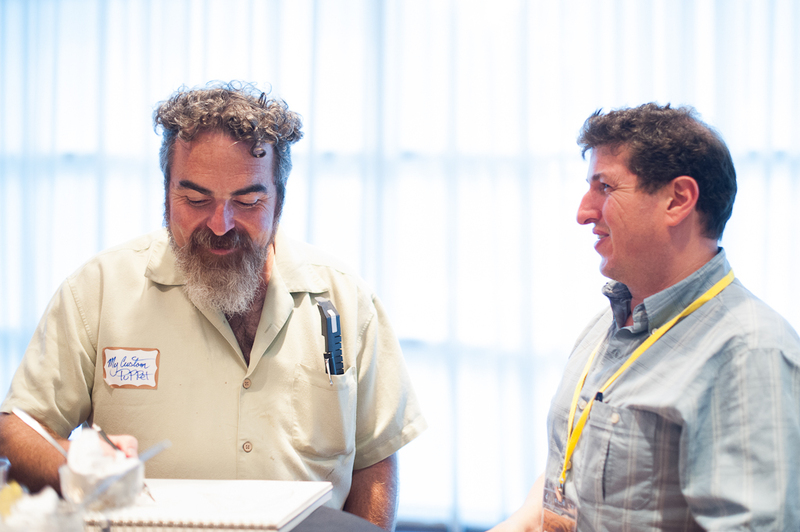 I first met Mario at the 2014 LA pen show and I look forward to seeing him at shows. He’s brought some beautiful pens with him. 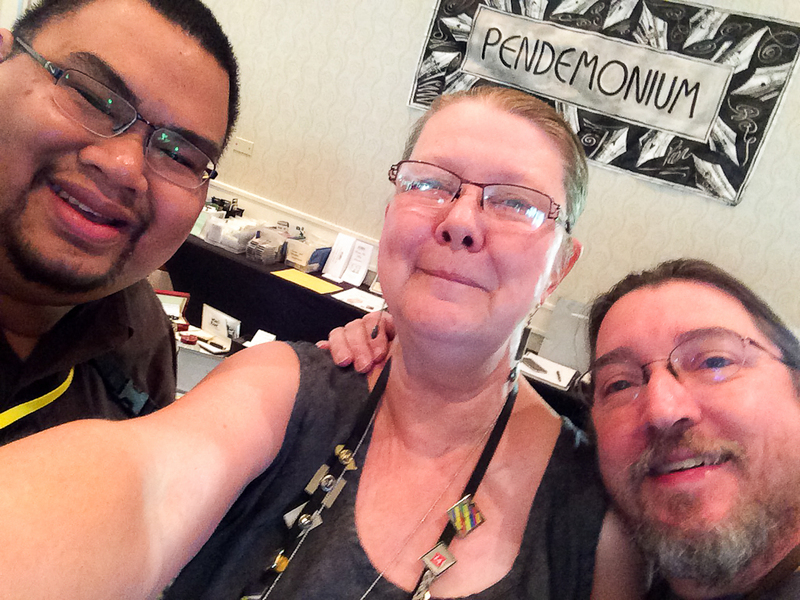 It’s my pen show buddies and Pen Posse peeps, Christina and Brian! I moseyed on over to the back wall where the Wahl-Eversharp table was and said hello to Syd Saperstein and his wife Judi. 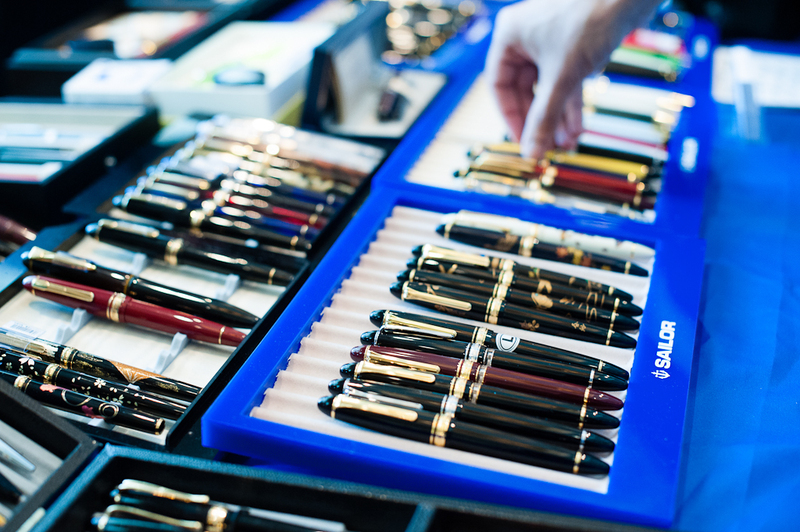 It’s always a pleasure to see them at pen shows. 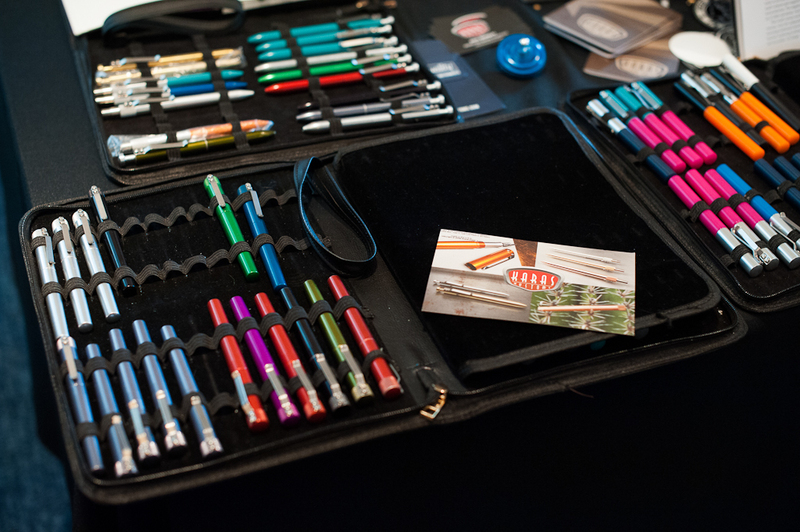 The Wahl-Eversharp pen company is the show’s principal sponsor and Syd is one of the three show organizers. 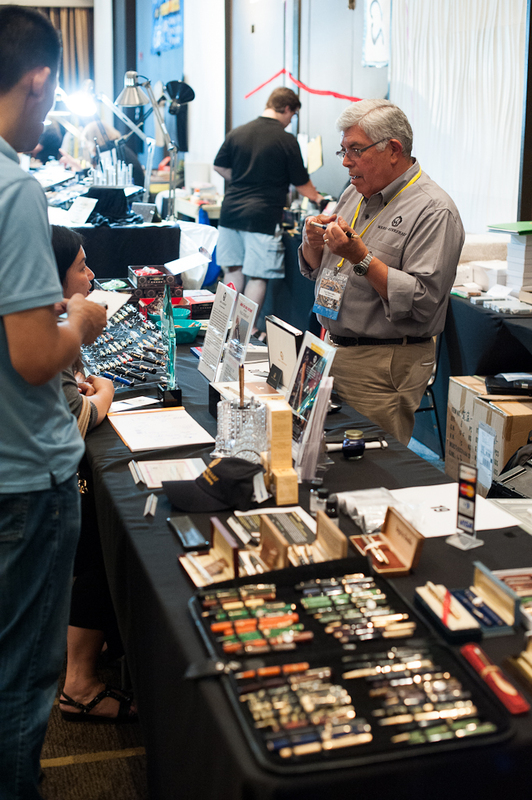 Since I was focusing on vintage pens this year, I got a chance to ask him about the vintage Wahl-Eversharp Gold Seal, and Doric pens. I learned a lot from him even if it was just for a quick moment. A customer walked up and asked him questions as well. 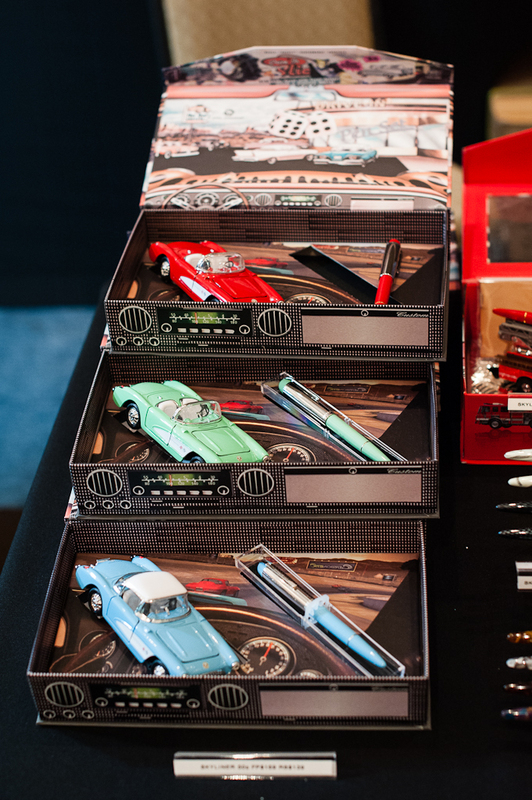 Beautiful modern Skyliner 50’s pens with color-matched 1957 toy Corvette. 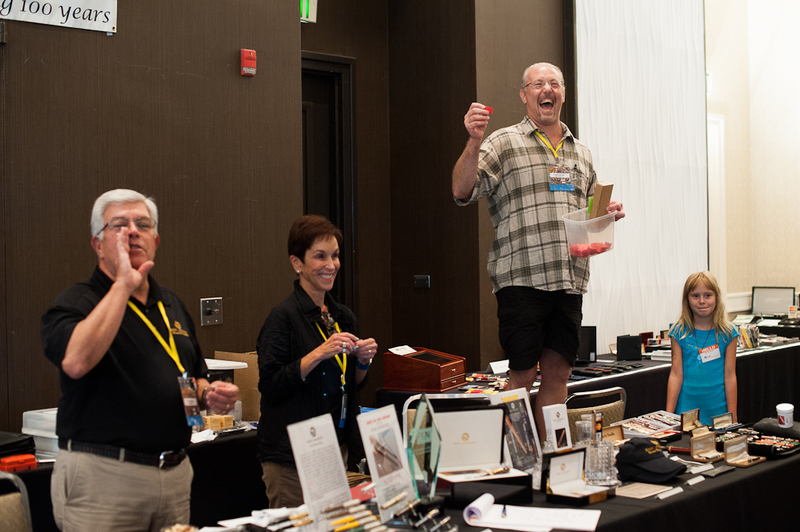 Right beside the Wahl-Eversharp table was another pen show trademark. It was Susan Wirth’s table. 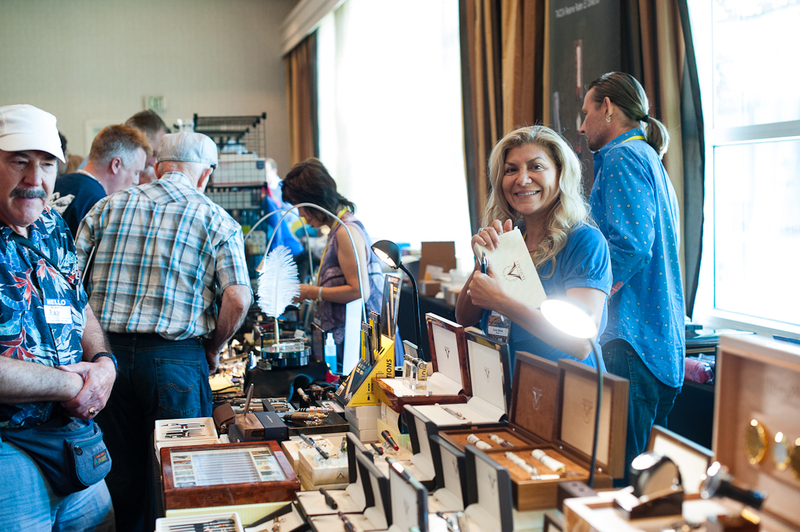 Susan and her team travels to almost every pen show in the United States. She loves writing with an italic nib (like myself), and almost all her pens for sale are inked up for everyone to try before they buy. 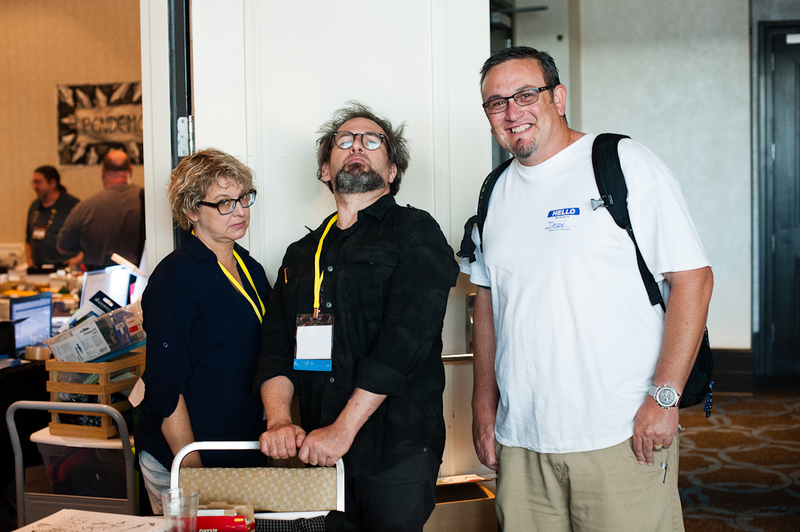 Calligrapher Deborah Basel, Susan Wirth, and John Martinson having a fun moment at the show. 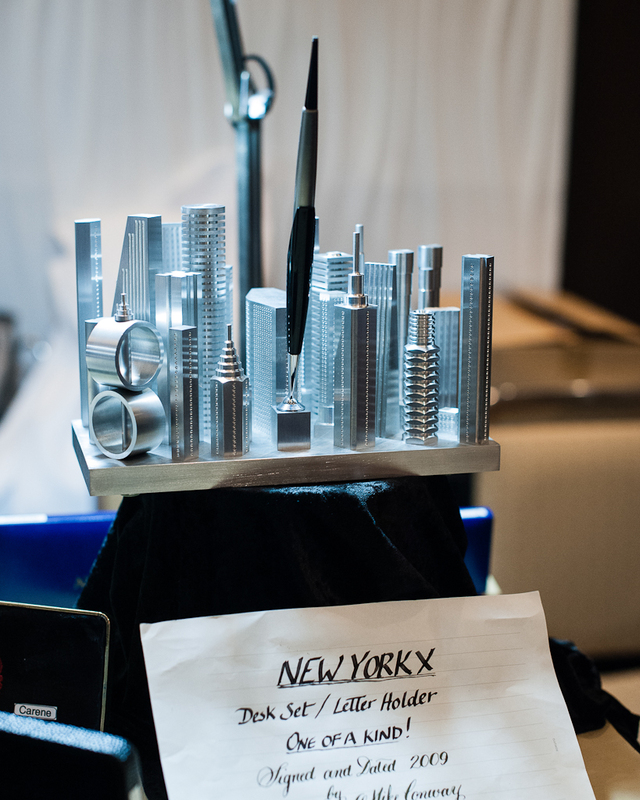 An interesting desk set and letter holder by Mr. Mike Conway found at Susan Wirth’s table. I wonder if there was a San Francisco Edition. 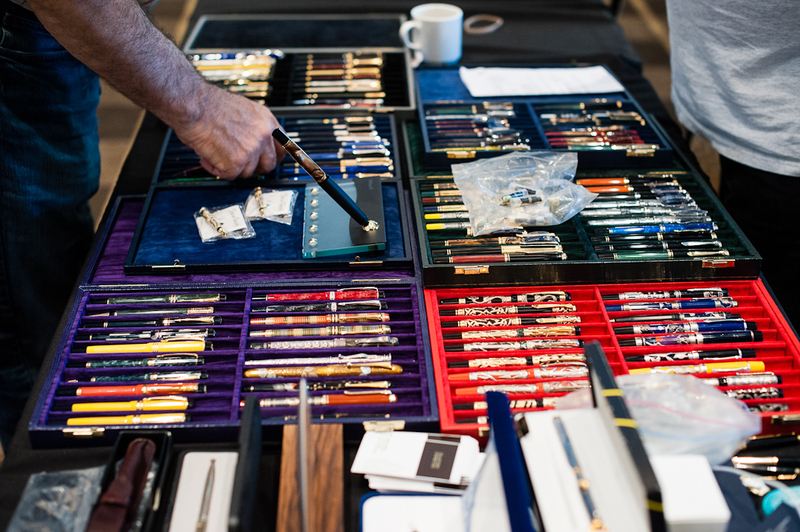 Wandering around more in the ballroom and I found Bill Weakley’s table full of beautiful Namiki, Parker, Paul Rossi, and Pelikan pens. 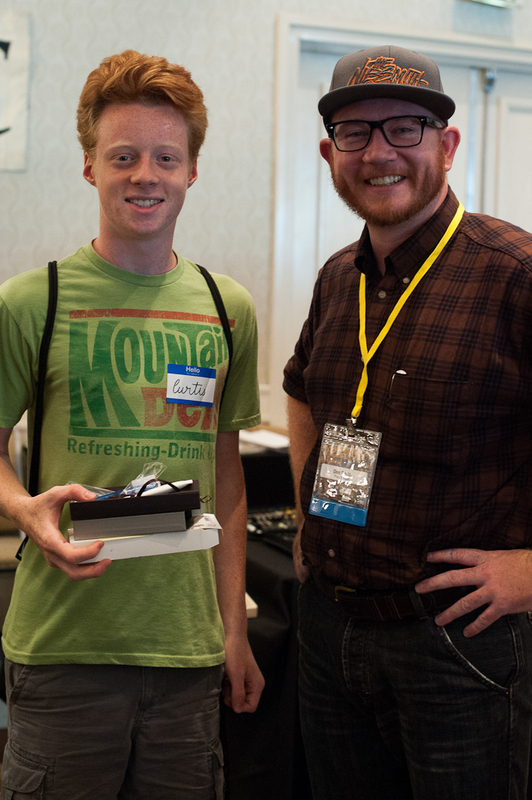 I first met him at the 2015 LA Pen Show. I’m so glad he attended this year’s SF Show. He had a lot of pens that I wanted but were definitely over my budget. Haha! 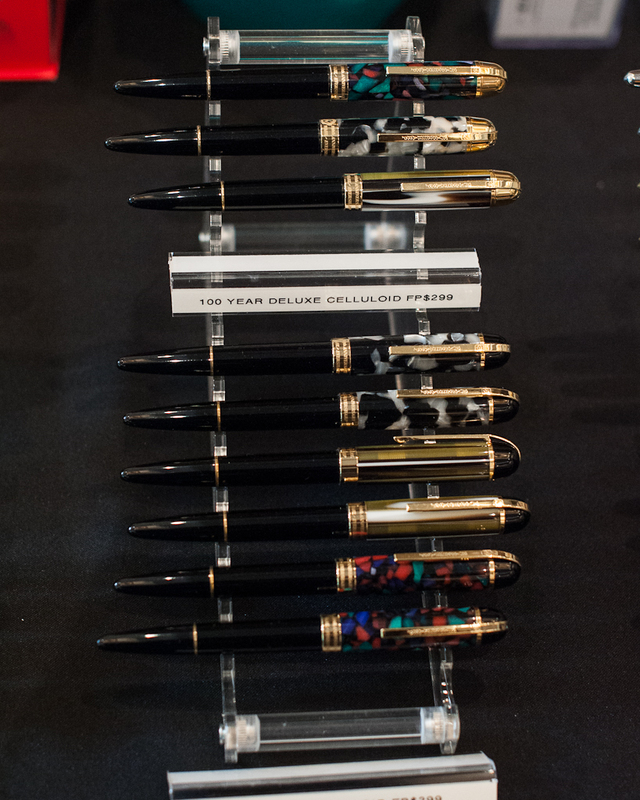 Pens at Bill Weakley’s table. 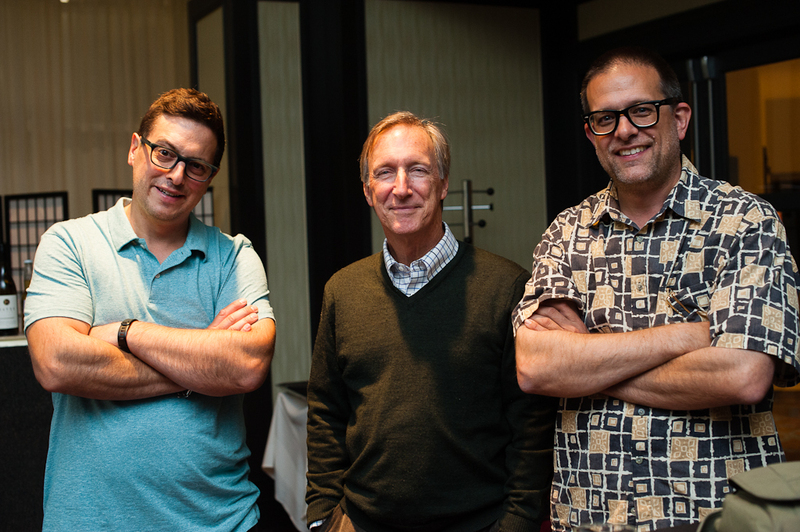 Then I saw Stuart Hawkinson and Jim Leonard whom I met at last year’s show. 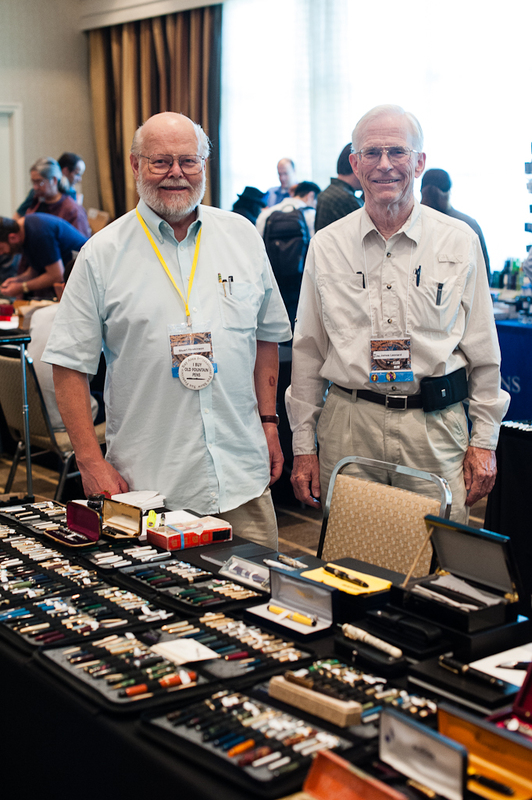 These are two guys who love restoring pens and like to share their experience. Stuart and Jim pose for a quick photo. 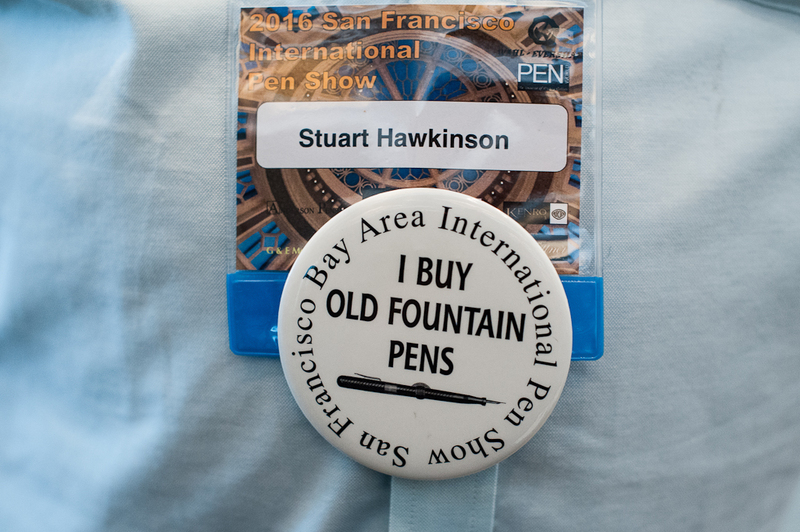 Stuart had a button from the old San Francisco pen show. I wonder where I could get one of those. 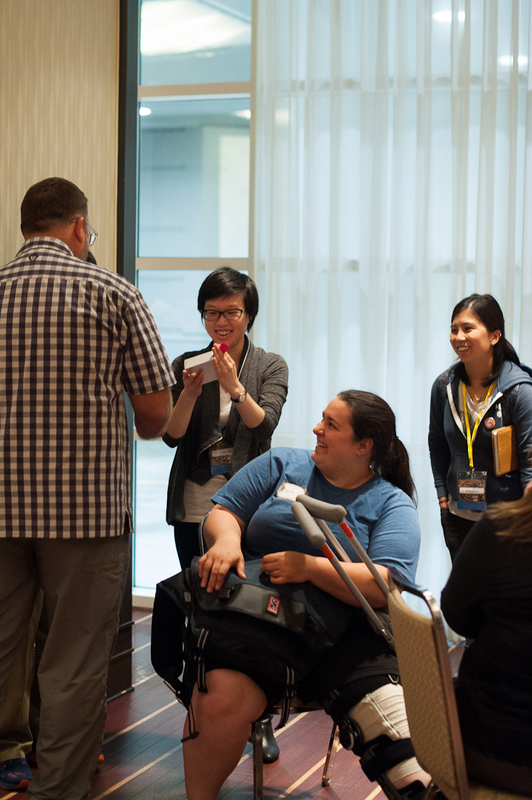 John Corwin of Flexinibs’ table can be identified with a “Flexxies” balloon. Headed over to Ryan Krusac’s table and admired his new line of Legend L-14. Also his limited Dangers of the Deep pens were quite tempting. 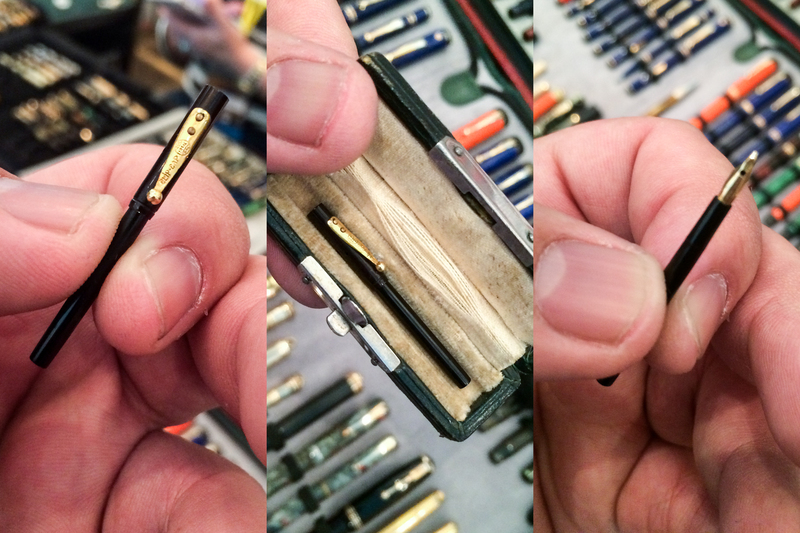 I’m glad he got to attend the SF pen show this year and he brought along his wife, Julia. 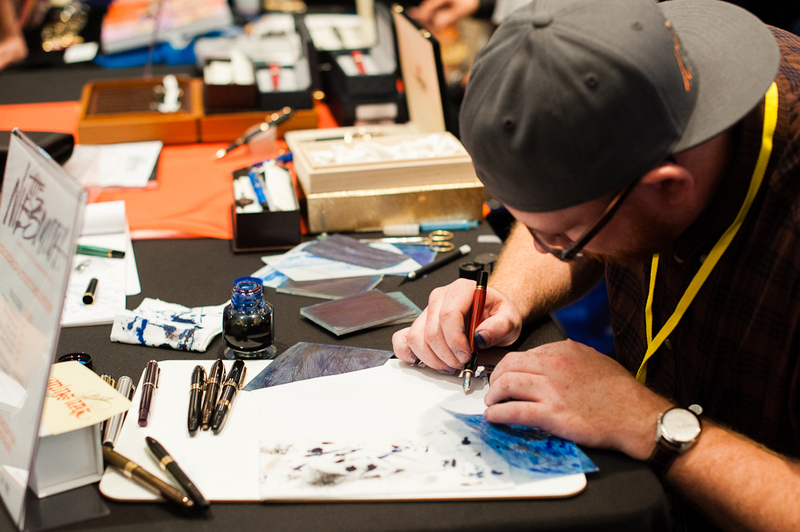 He was at the 2014 SF pen show but was unable to attend last year. Love this detail on the cap! I wish I bought one of these. Revisited the ink testing stations and now it’s getting busy. Almost all seats were taken at the ink testing stations. A quick hello from the other side. Katherine, Pam, and Nikola Pang. Pen Posse peeps! Dan Smith arrived later in the afternoon from Iowa and he had an online signup sheet. One of his first customers was Joey Feldman from Los Angeles. It was a treat to see these guys at the show. Dan Smith, The Nibsmith arrived and immediately went to work. 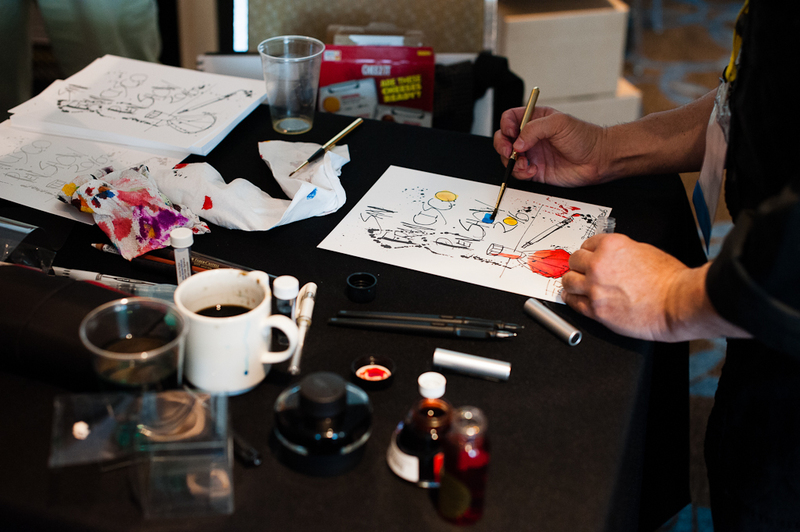 Joey Feldman getting nib work by Dan Smith, The Nibsmith. Joey’s nib-work doodles can be a beautiful work of art as well. My Dad, Bert, visited the show in the afternoon and just wanted to see what was going on at pen shows. Surprised to see my Dad walking towards me. I was caught admiring Tania’s Sailor pen. And Pam was in the background getting her F-C nib tuned by Jim. Gave the pen back to Tania before I end up not handing it back. 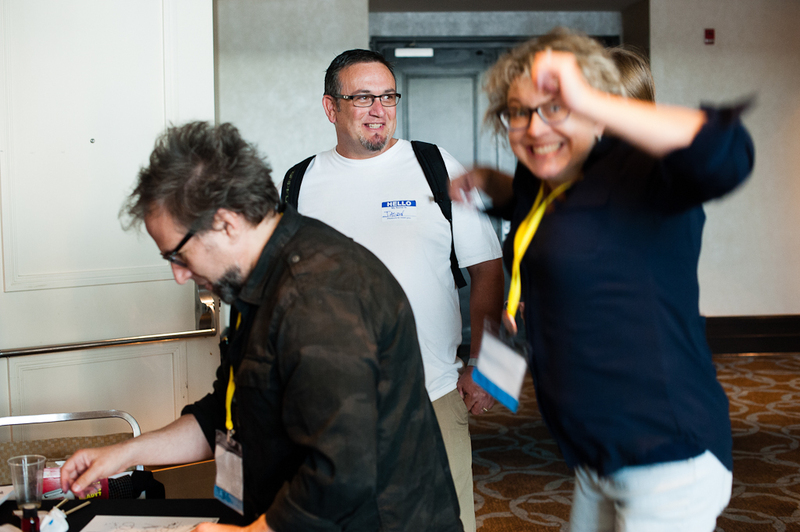 While you’re at the Ink Testing Stations, it’s also a perfect opportunity to start conversations and make new friends. 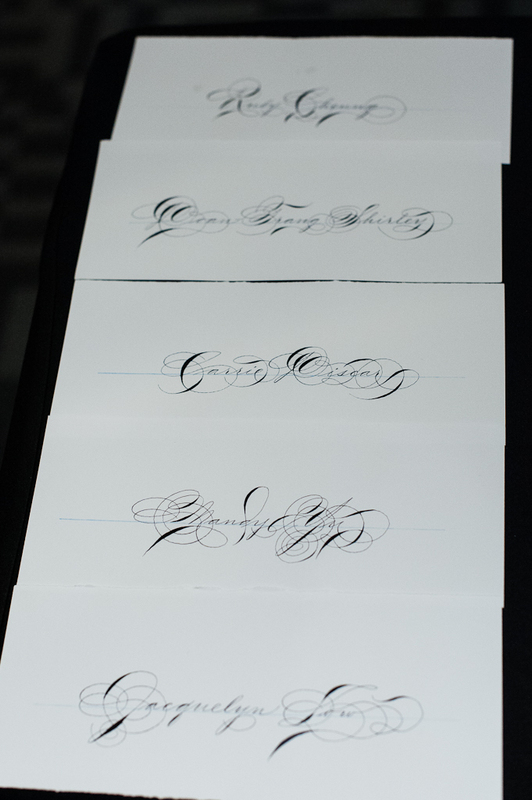 This was a brainchild of Ricky Chau, and the Ink Master, Loren S. since the 2015 SF Pen Show. Ladies: Lore, Julia, Holly, and Ana. Ink master Loren had his back turned beside Holly. As it was getting close to the end of the first day, I was finally called for my turn at Masuyama-san’s table. I had my vintage Skyline’s medium nib ground into a smooth cursive italic. I also had my Pelikan M800 double broad (BB) nib tuned as it was skippy and had the baby’s bottom issue. I’ve had my nibs tuned and ground by this man for the past 3 years and he knows exactly how I want my nibs. I rarely give the pen back after he’s done with it the first round. 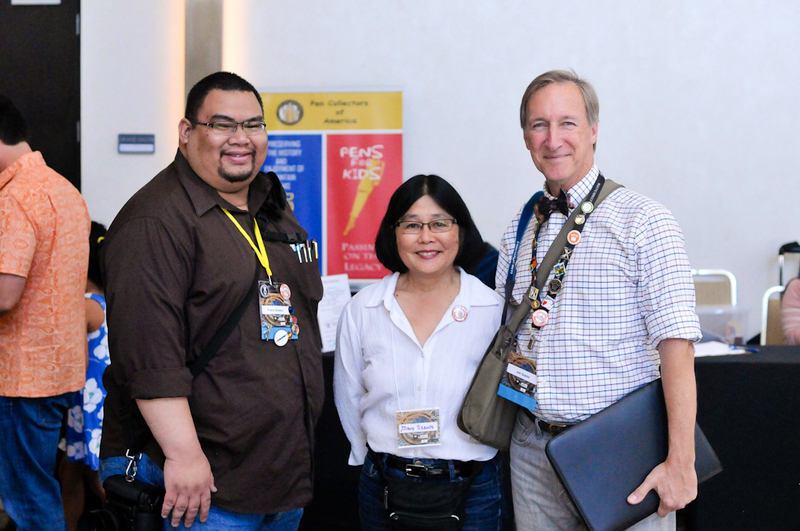 It’s also always a delight chatting with Mike and his wife, Emiko. Talked about their trips to Japan and other pen shows. Close-ups of Masuyama-san working on my vintage Skyline nib into a cursive italic. 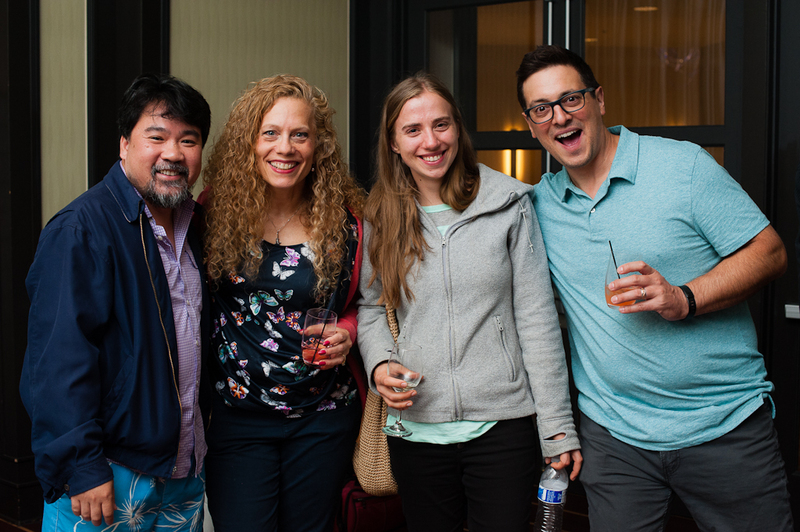 Right after the show closed at 7:00pm, there was a Pen Addict meetup event hosted by Brad Dowdy, the Pen Addict himself, and Lisa Vanness. It was an effort to get together with the people you’ve seen around the show during the day and just plainly talk pens, paper, inks, etc. 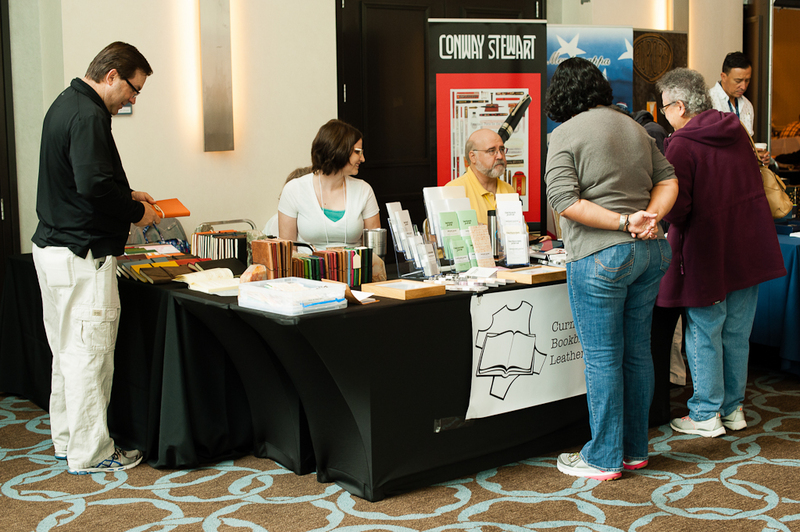 The event itself was free, and you didn’t have to attend the pen show to get in. 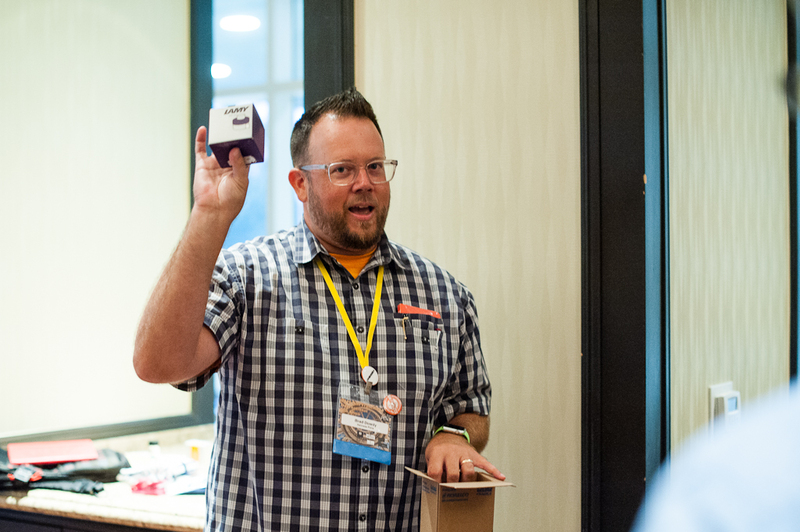 As you walk in, Brad handed out raffle tickets for some awesome giveaway prizes. They had some snacks as well. Alcohol was also served and available for purchase. 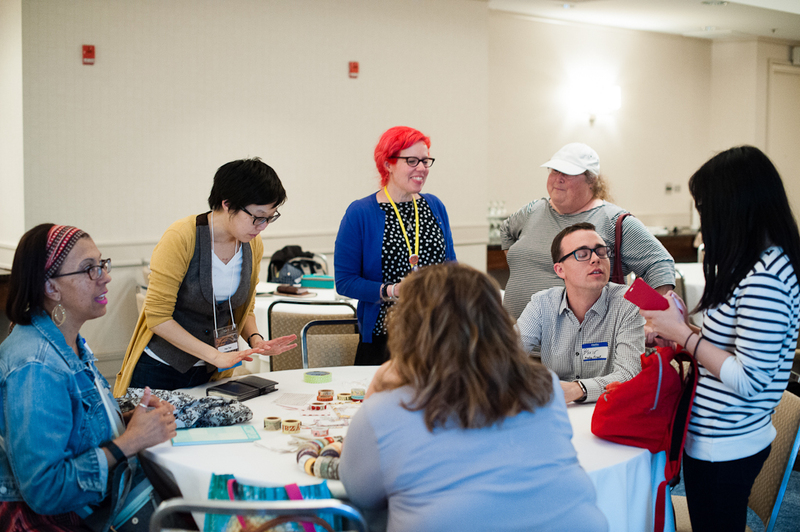 It was great to meet and chat with like-minded people. 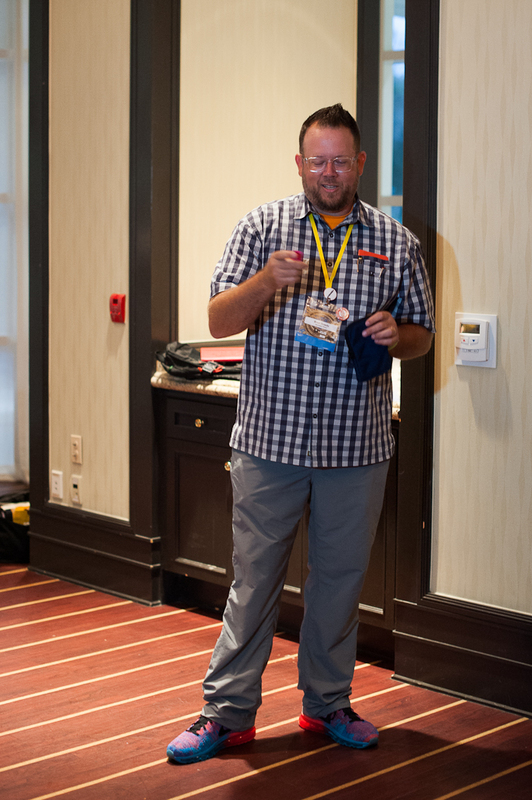 Around 8:00pm, Brad started the raffle and gave away awesome prizes. I do not recall each and every prize given away but here goes nothing: 2 Nock Co. cases, Lamy Dark Lilac ink, notebooks, empty Akkerman glass bottle, Joey Feldman poster artwork, notebook engraved with Joey Feldman’s artwork, and a one-and-only Pilot Iroshizuku ink bottle engraved with the show’s hashtag, #SFPenShow2016. @mycustompuppet and Daniel. I finally met @mycustompuppet in person! Ana, and Lisa having a funny moment. Matt, and Tania are finally off table duty for the night. Matt and I were shooting each other. He was taking a video though. haha! Lisa was laughing as it happened. Raffle time! First up was the Lamy Dark Lilac ink or as Brad called it, #unicornink. Nock Co, cases were raffled off. 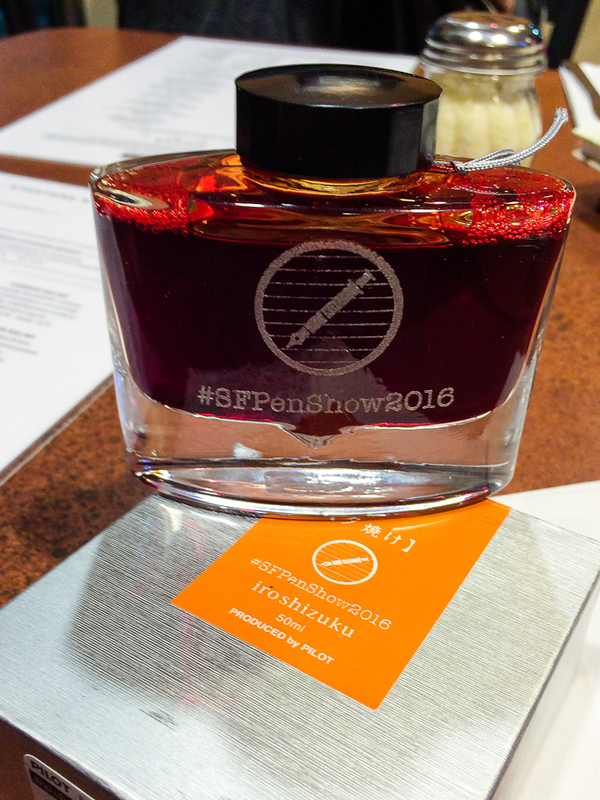 Pam won the Pilot Iroshizuku #SFPenShow 2016 engraved ink bottle. And I got Katherine in the background. Yay! Joey Feldman, Christina, and Brian. They won Joey’s poster artwork. 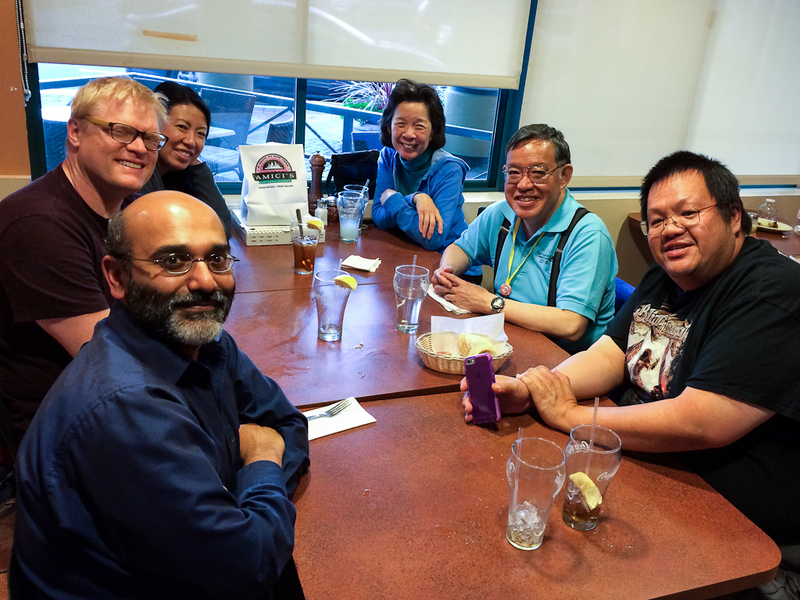 As the Pen Addict meetup ended, a few of the Pen Posse peeps left the hotel for dinner at Amici’s Pizzeria in Redwood Shores. Needless to say, we were all famished and enjoyed some salad, pizza, chicken wings, and more pen conversations. Here’s a close-up of that Iroshizuku ink bottle and box that Pam won. Even though it’s an orange ink, I was green with envy. Haha! After dinner, we went back to the hotel bar and just relaxed. What a fantastic first day of the show. I went home shortly afterwards. Another exciting pen show day! 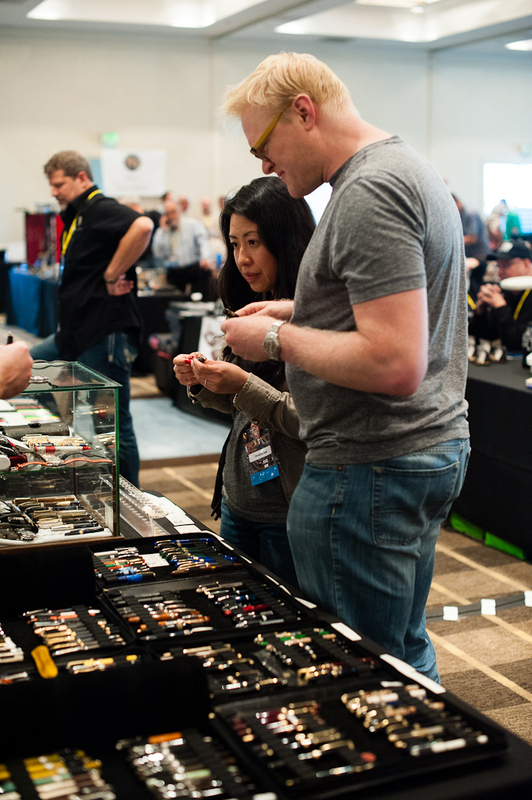 For this day, the show once again opens for dealers and All-Access pass holders at 7:00am. And the general public will be let in at 10:00am. 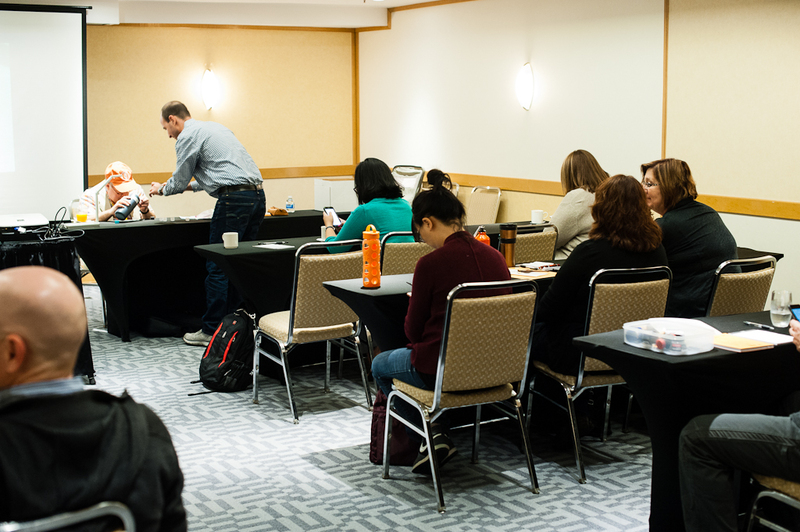 I arrived at the hotel around 8:30am so I definitely missed the breakfast provided for the dealers and All-Access pass holders. But no matter, I had a breakfast sandwich and Cold Brew coffee right before heading to the hotel. 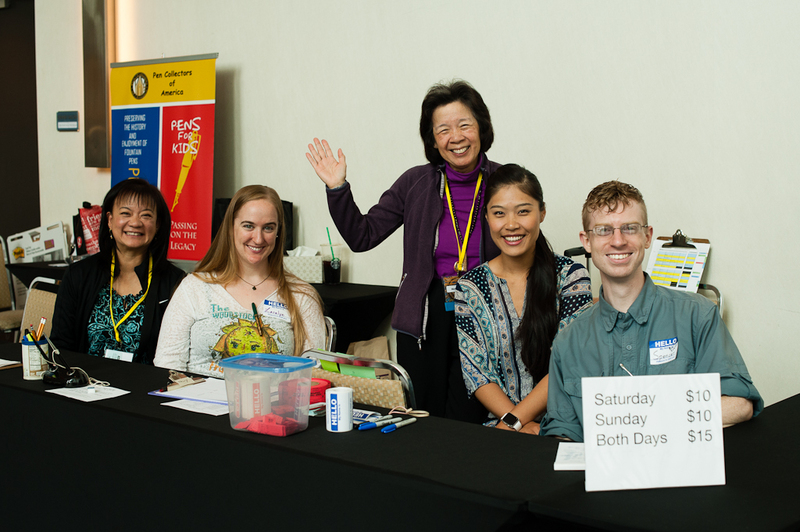 I have to highlight the SF Pen Posse volunteers who signed up to man the registration and seminar desk from Friday all through Sunday. Without their generosity of time and effort, I’m not sure how the show would’ve turned out. Across the registration desk in the foyer was Steve Curnow’s table. 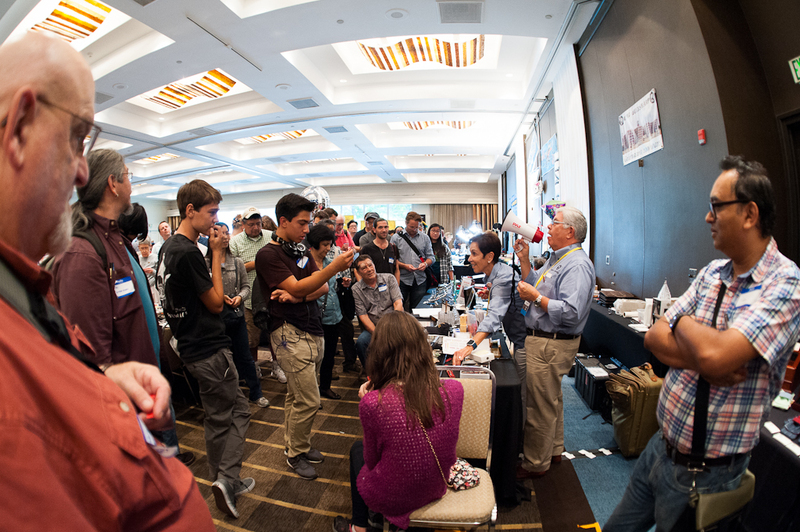 This was a popular first stop for show attendees. 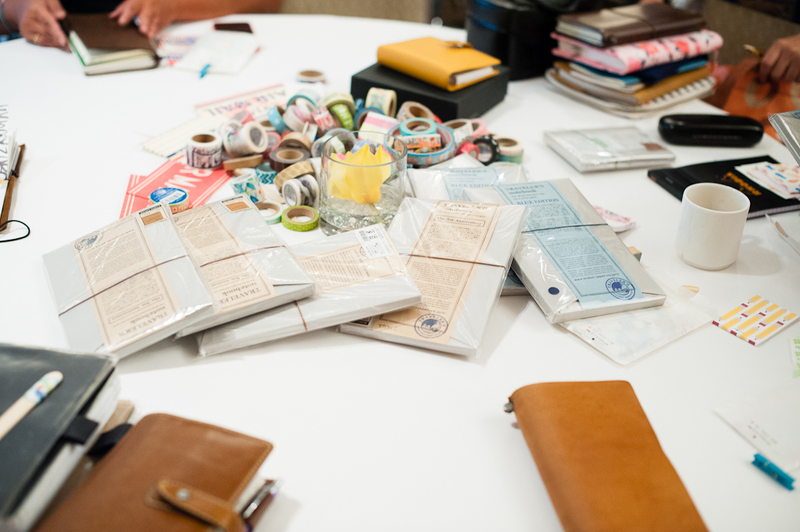 Steve had a wide selection of notebooks, journals, and pens for sale. 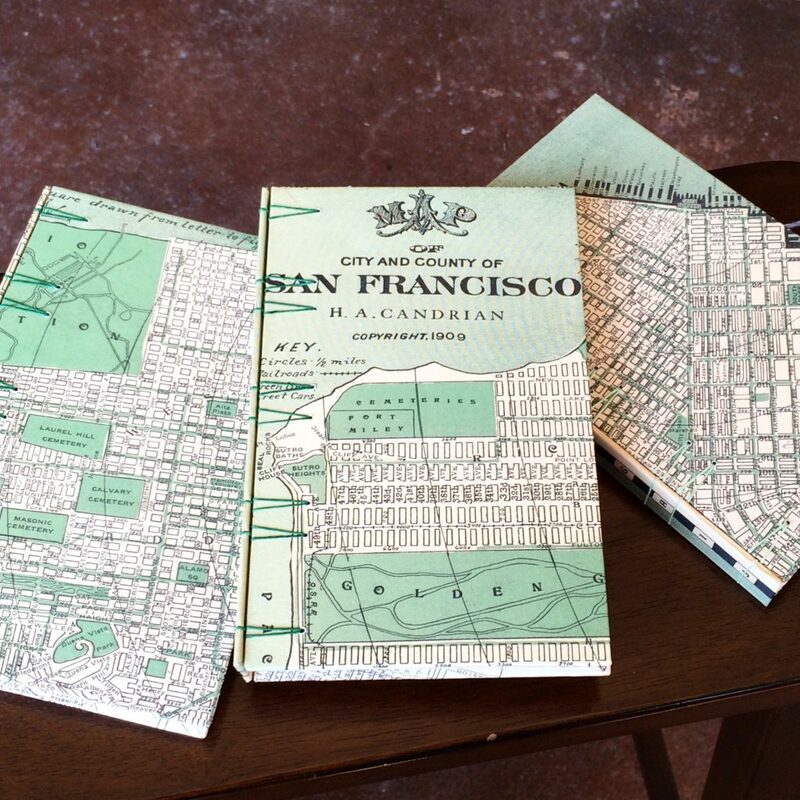 He also had a very limited edition San Francisco design journals at the show. 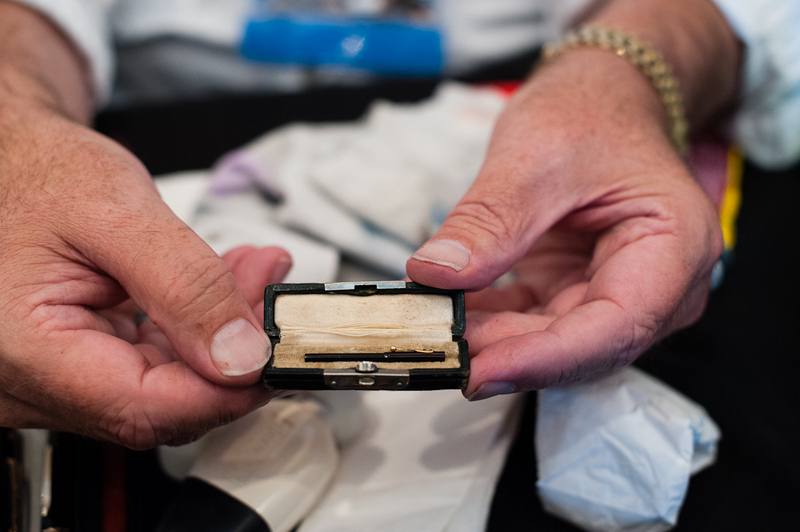 Curnow Bookbinding and Leatherwork – Steve Curnow and family were at the show everyday. 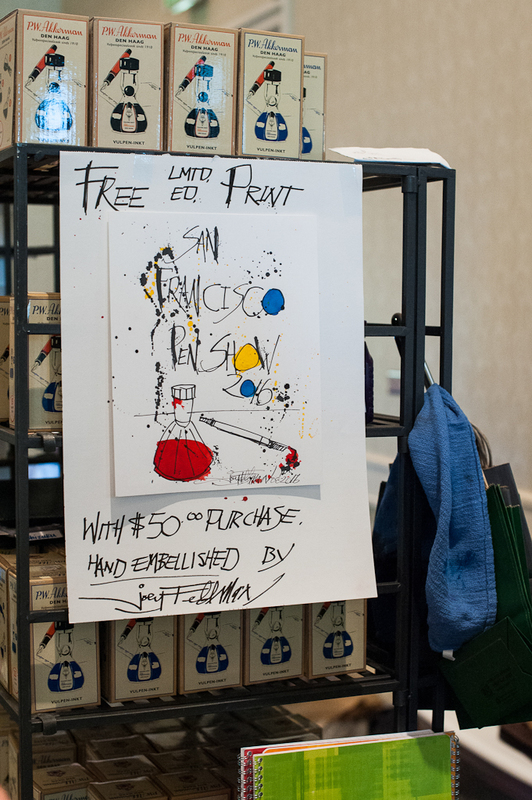 Steve Curnow’s limited edition San Francisco design journals only sold at the SF Pen Show. 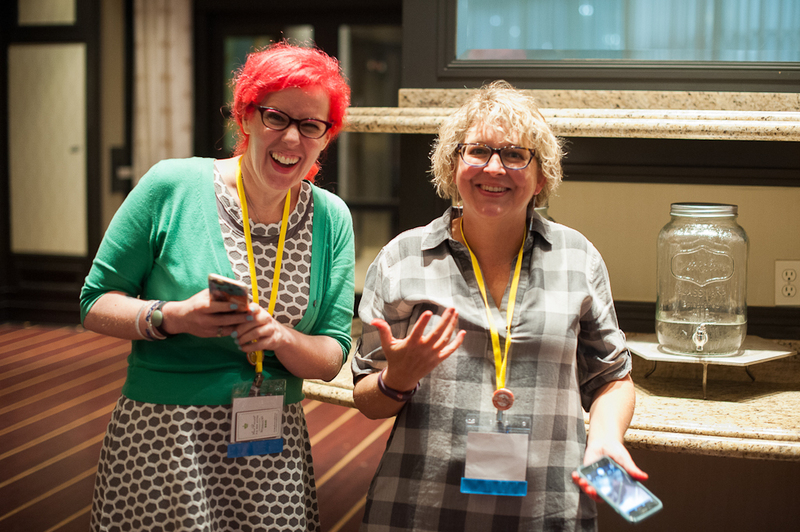 In the beginning of this report, I did mention that I was a vendor as well. Well the whole day Friday, my table was unused and empty. On Saturday, Edna, my Mom, arrived at the show and was selling some handmade earrings, and necklaces. 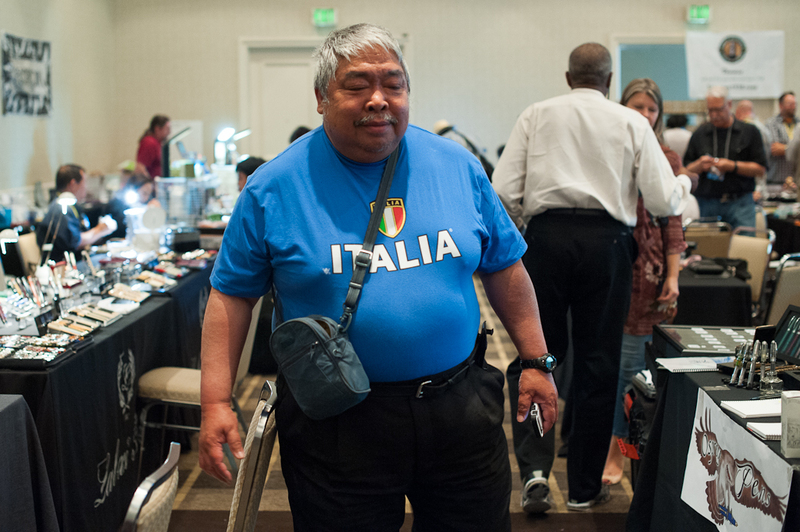 Also, I let my friend from the Pen Posse, Fred, sell his SF Pen Show shirts at my table. I intended to sell pens but I just didn’t have the time to sit at my table so I just laid out three pens in the middle with price tags. Katherine also placed her wooden pen blocks she made a few months ago for sale. 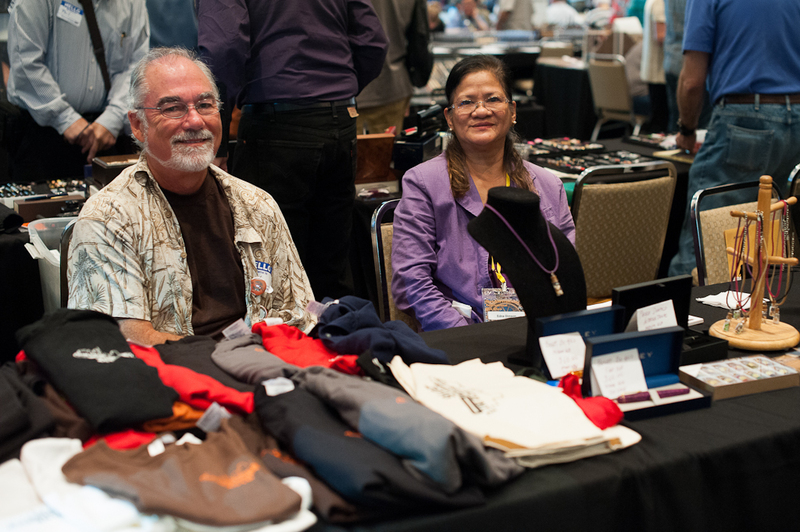 Fred had a handful of SF Pen Show shirts, and Edna with her handmade jewelry. Tania at the Franklin-Christoph table had a free moment and we took a hand-comparison selfie. We’ve known each other online for a couple years now and we’ve always joked about our hand size difference. I walked around the ballroom once again but this time, I reached the other side of the room which was dubbed, Anderson Alley. 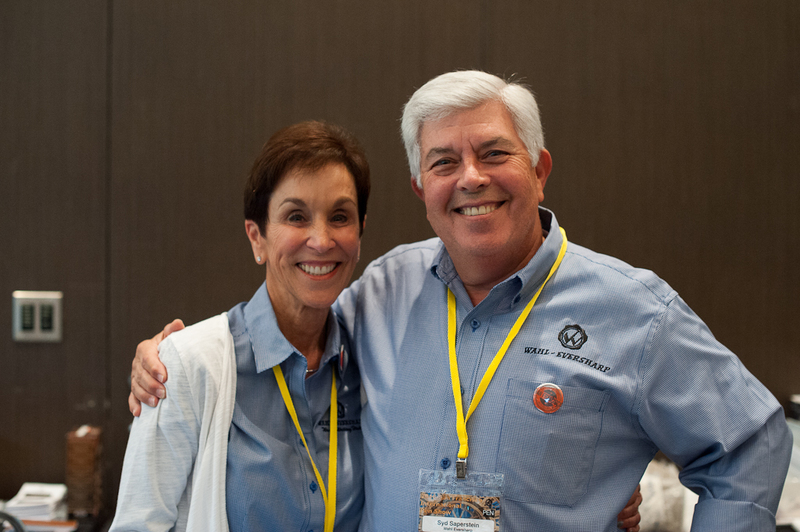 Brian and Lisa Anderson returned this year and enlisted the help of Jason, and Ana. They brought a lot of items from their store in Appleton, Wisconsin. I always find it a treat to get to chat with the Andersons during the shows. The Anderson Alley was well-lit, and well attended. 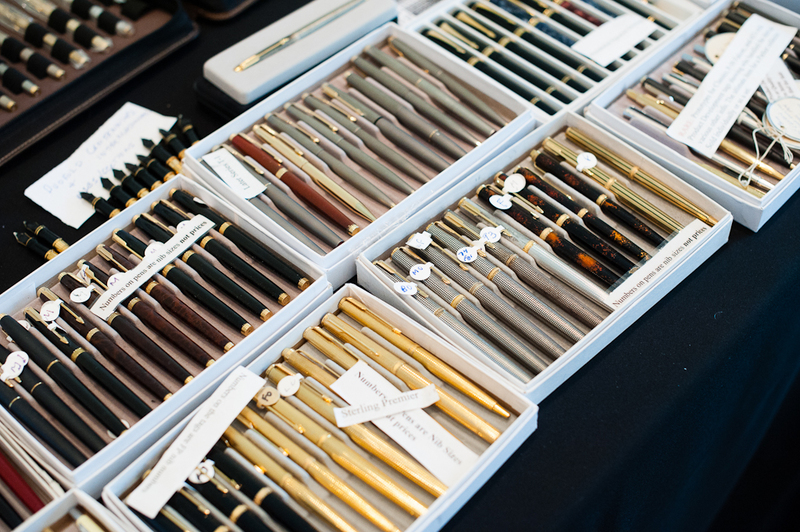 A selection of fine Sailor fountain pens. I then saw one of the most knowledgeable pen person that I know. In fact, he has written quite a few books on pens including Fountain Pens of the World, and Fountain Pens of Japan. It’s none other than Mr. Andreas “Andy” Lambrou of Lambrou Pens (formerly Classic Pens). His pen selection is quite exquisite and he collaborates with very artistic people like Mr. Paul Rossi, and Mr. Ryan Krusac, and others. 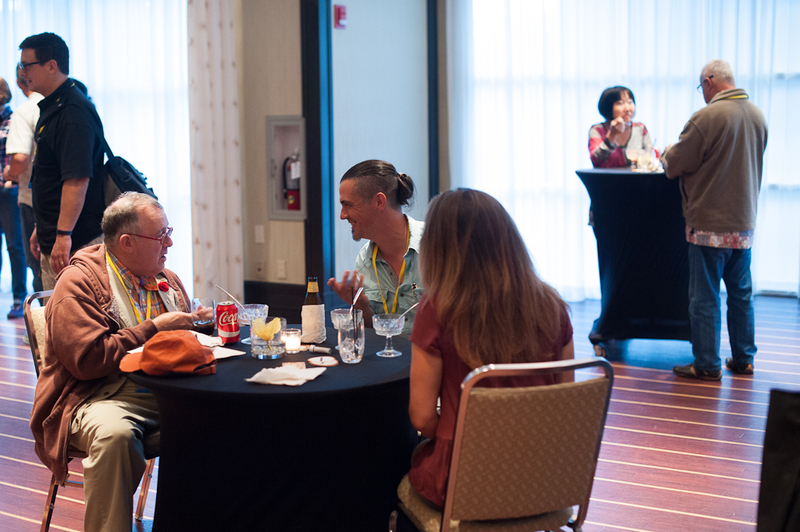 Andy Lambrou speaking with a show attendee. 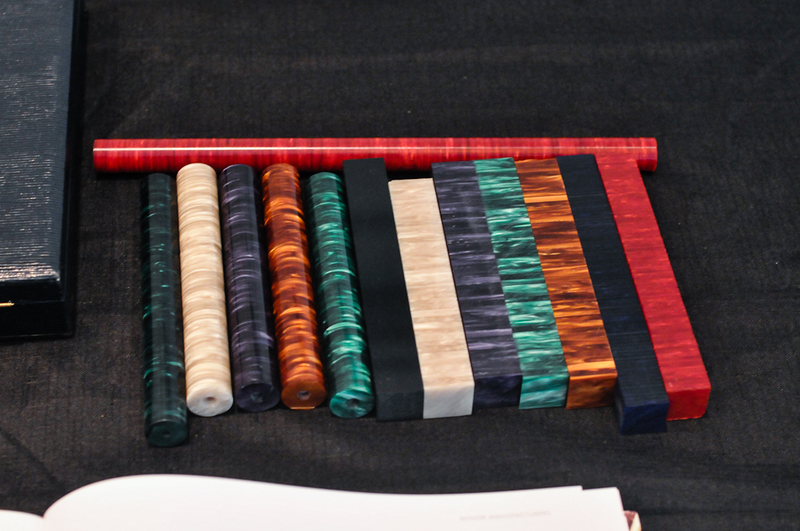 Some gorgeous acrylic blanks that Andy brought to show and explain the pen-making process. Photo by Ricky Chau. 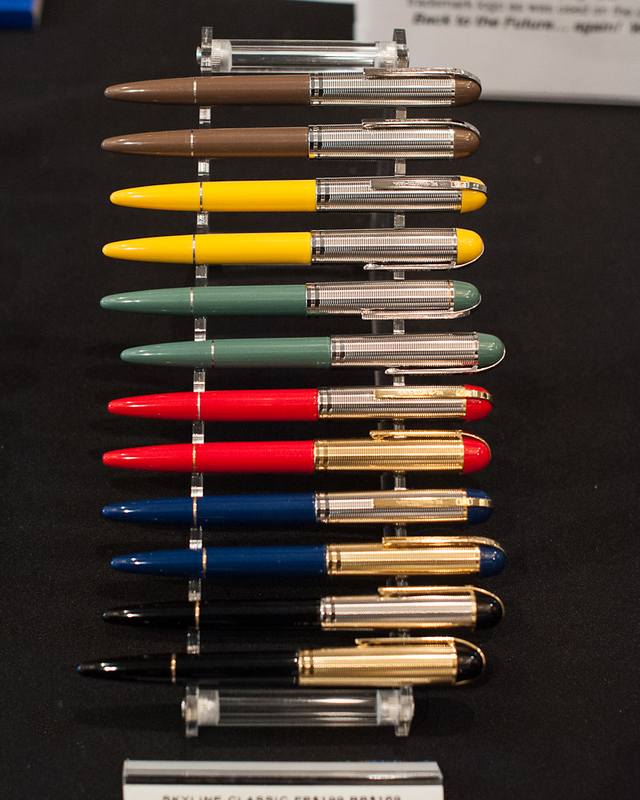 Parker 75 pens found at Lee Chait’s table. 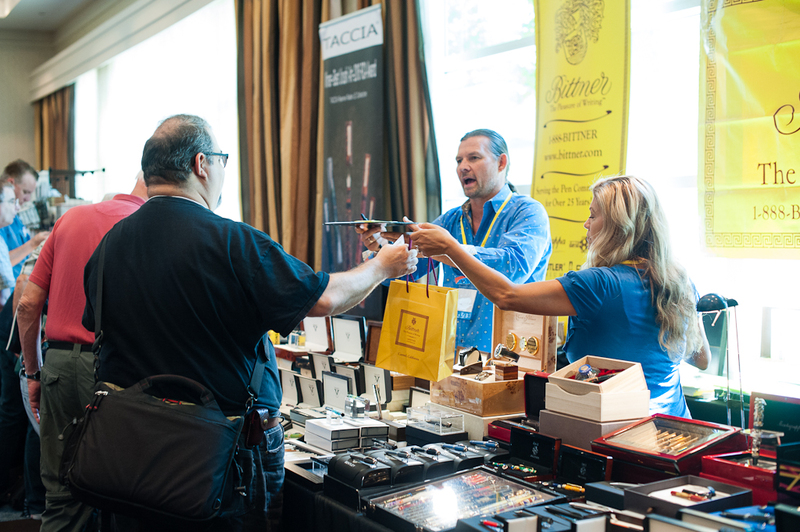 Mark speaking with Detlef Bittner of Bittner Pens. Cindy Bittner of Bittner Pens. 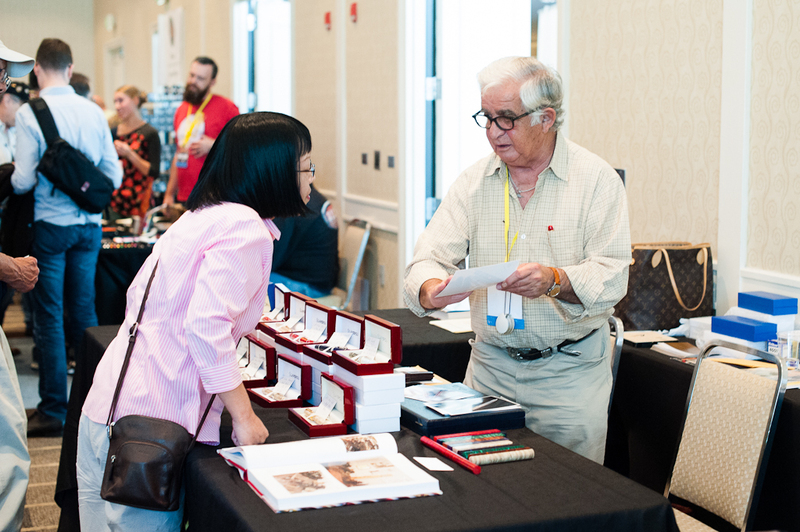 I got to speak with Cliff Harrington about vintage pens. Cliff always has very rare (and can be pricey) pens. And he also has a wealth of pen knowledge to learn from. 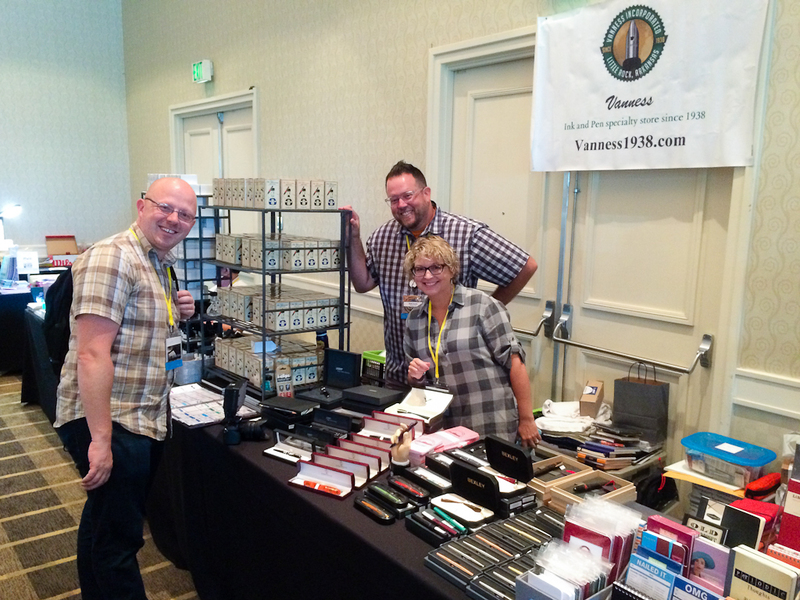 As I stopped by, I learned more about Waterman pens, Wahl-Eversharp pens, and Carters pen. He showed me a nice and rare Waterman Ideal Doll pen. 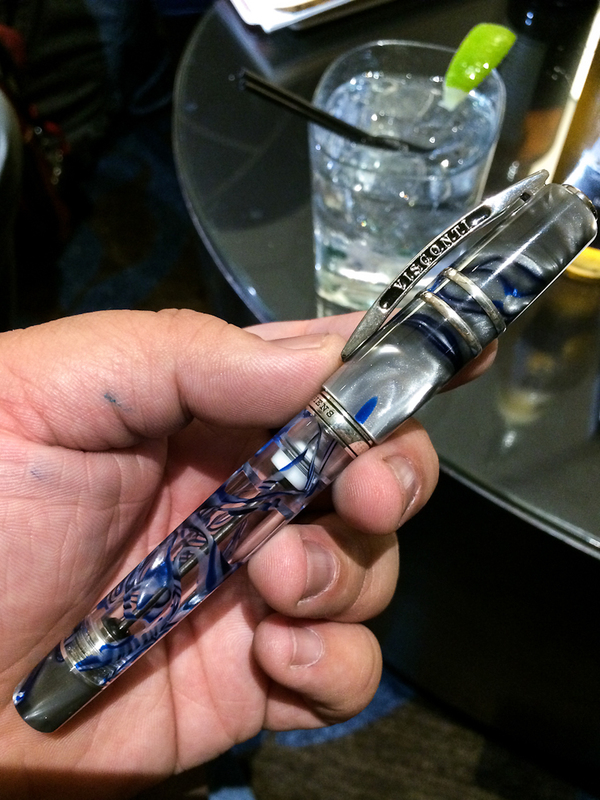 As far as I know, there were only two of these pens at the SF pen show. 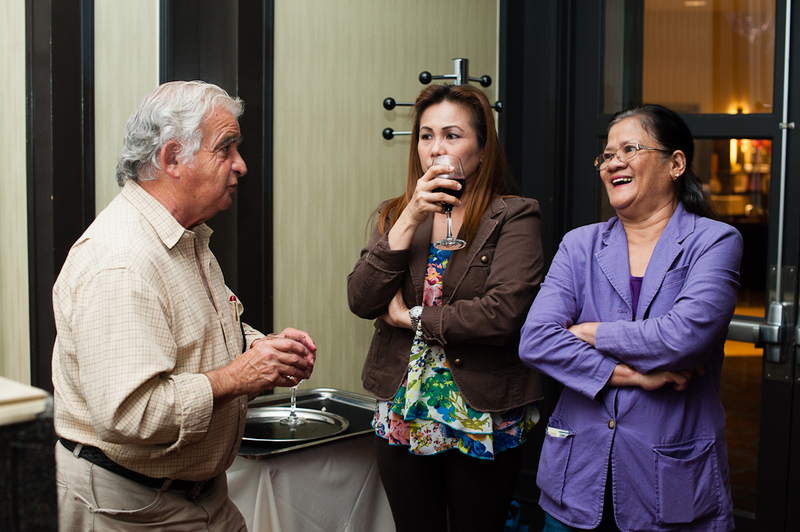 Cliff Harrington and his wife, Elizabeth speaking with Laralyn and Spenczar. The World’s smallest fountain pen. The Waterman’s Ideal Doll pen. 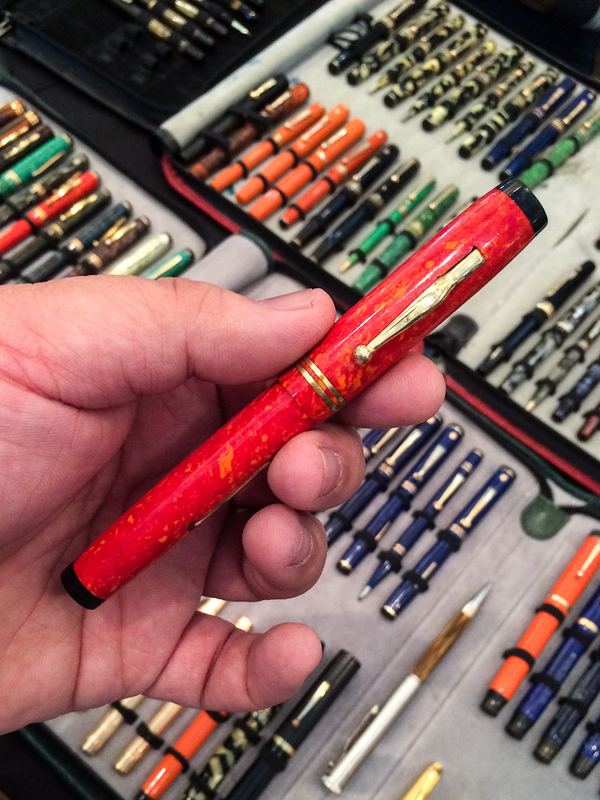 This Carter’s pen in Coral Red was in great condition. 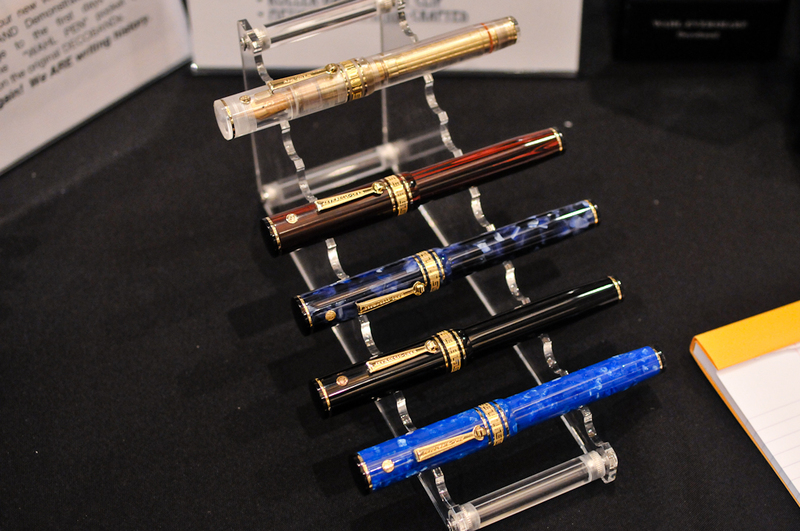 I found myself back at the Wahl-Eversharp table admiring the modern Decoband Gold Seal Oversized pens. And I had to take a photo of both Syd, and Judi. 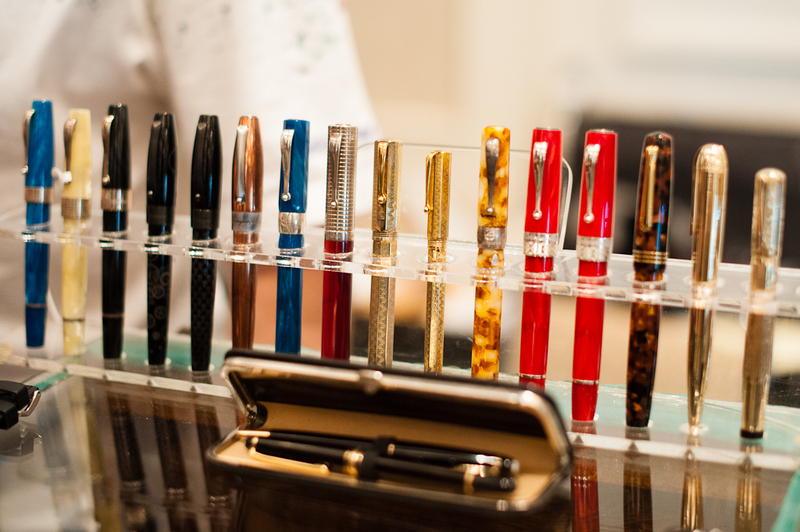 The Wahl-Eversharp Decoband Gold Seal Oversized pens arranged in all colors available. That vibrant blue in the bottom is just so nice! The NibSmith still hard at work at his table. I actually signed up for his Saturday schedule on his website but because it got busy at the registration desk, I had to give up my spot for other people to have the opportunity and time to sit with him. 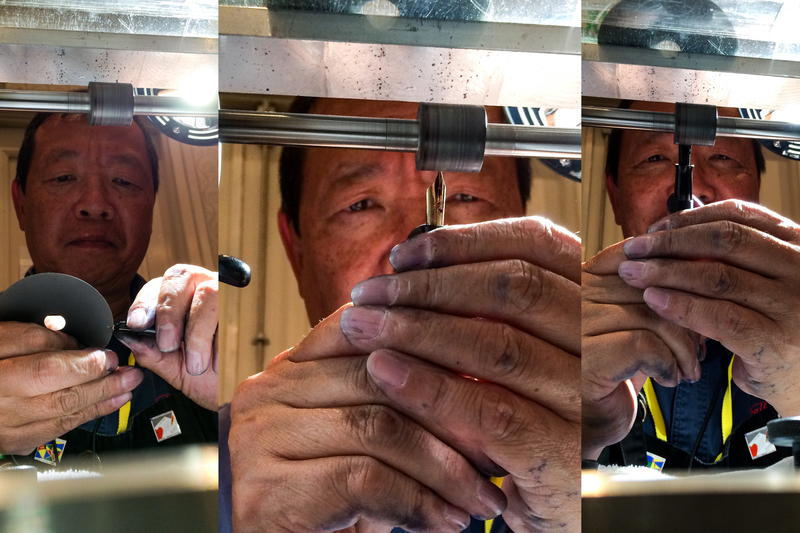 The NibSmith tuning a Pelikan pen. Show and Tell: A Waterman Lady Patrician pen and pencil set that my friend, Gale got at the show. 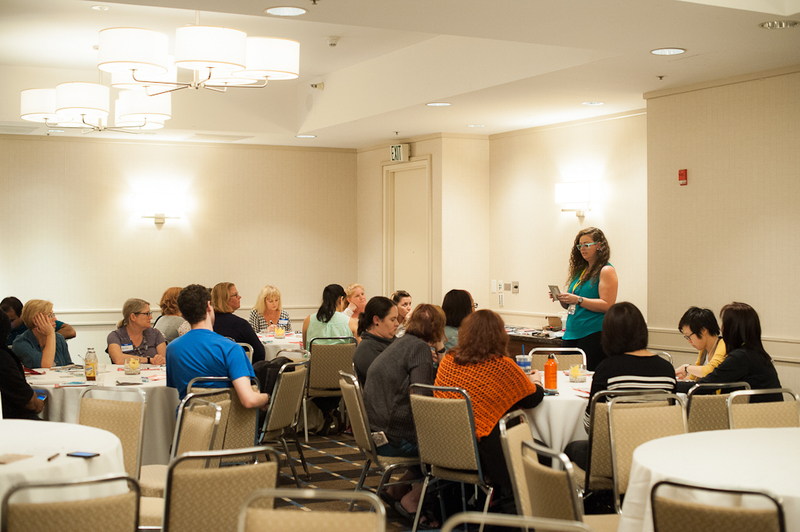 I stepped out of the ballroom to make sure all registrants got to attend Amanda McKay’s Kick A$$ Snail Mail class, www.letterletter.com. This class was the most attended and it was full with 30 people in the class. I’m one of the people that just sticks a stamp on an envelope, address it, and send it out. So I found this class quite helpful when I had a chance to sit in a little bit and learn from Amanda. 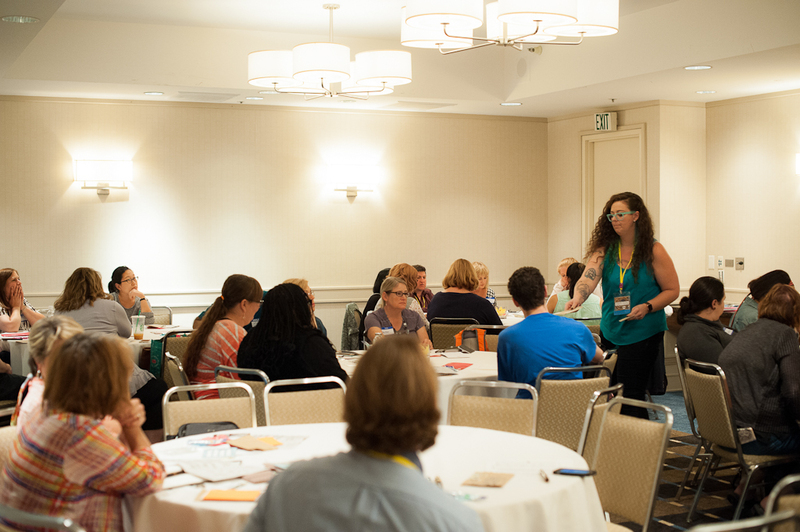 There were a lot of questions asked with regards to Amanda experience on how the US Postal Service handled her well-designed envelopes. 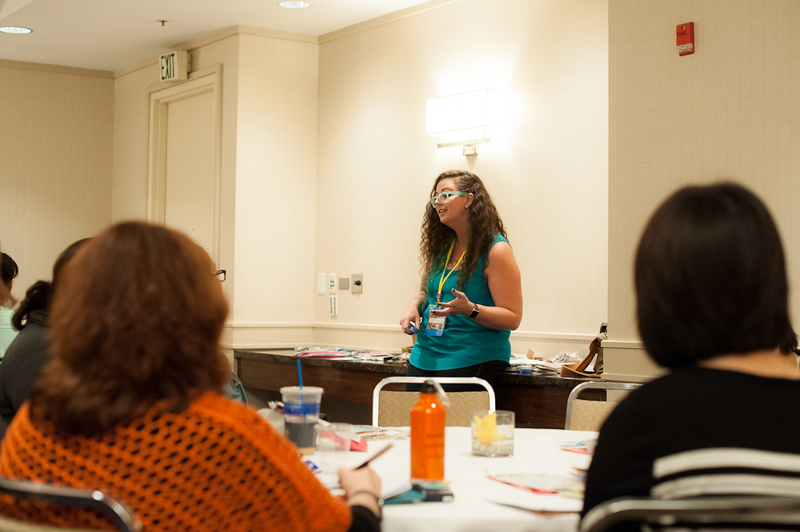 Right after Amanda’s Snail Mail class was the planner meetup hosted by a few SF Pen Posse members. 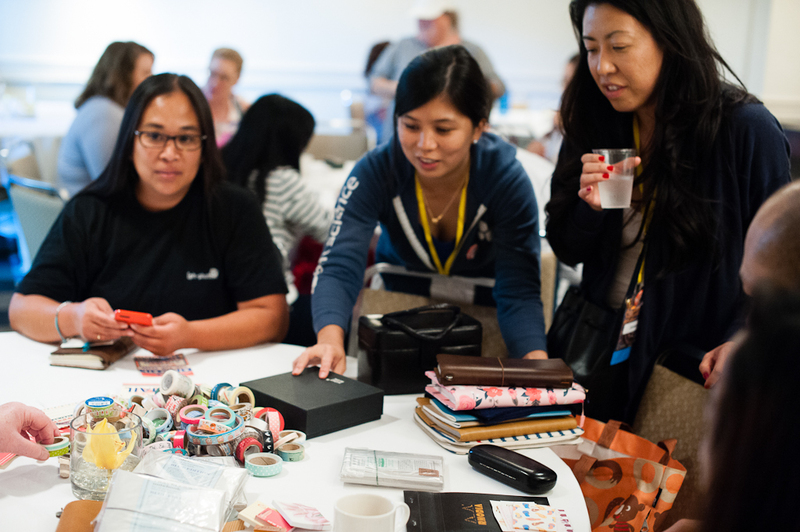 This is something new for the SF pen show and it was intended to be an informal hangout for people to learn about the different planner notebooks, strategies on how to use planners effectively (or ineffectively), and also to share stickers, stamps, and washi tape. This meetup was well attended. Three tables were occupied and lots of conversation happened. 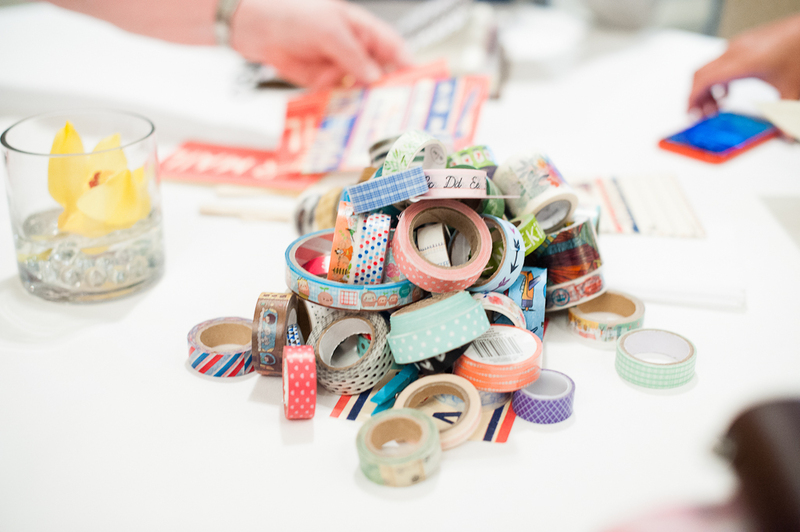 Tiffany from the Pen Posse gave me a roll of washi tape with a fountain pen design. Thanks Tiffany! 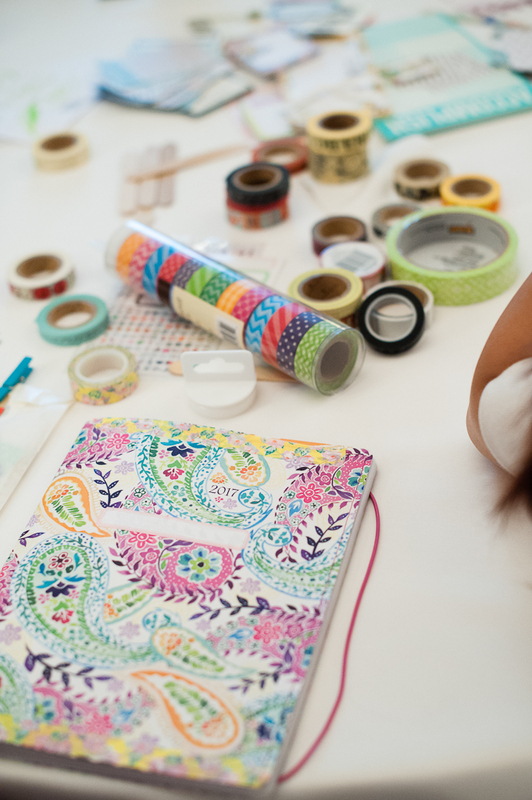 Planners and washi tape go together. Pam was showing her organized planner. 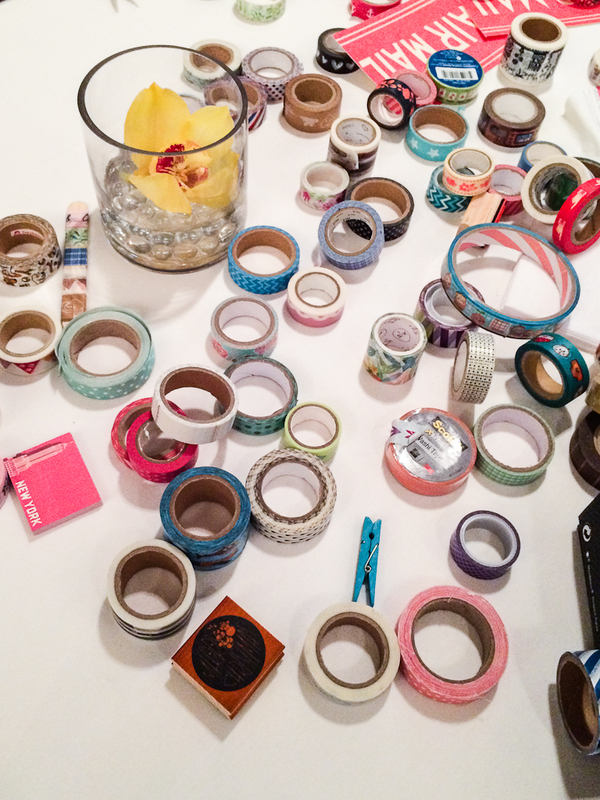 A pile of washi tape rolls. 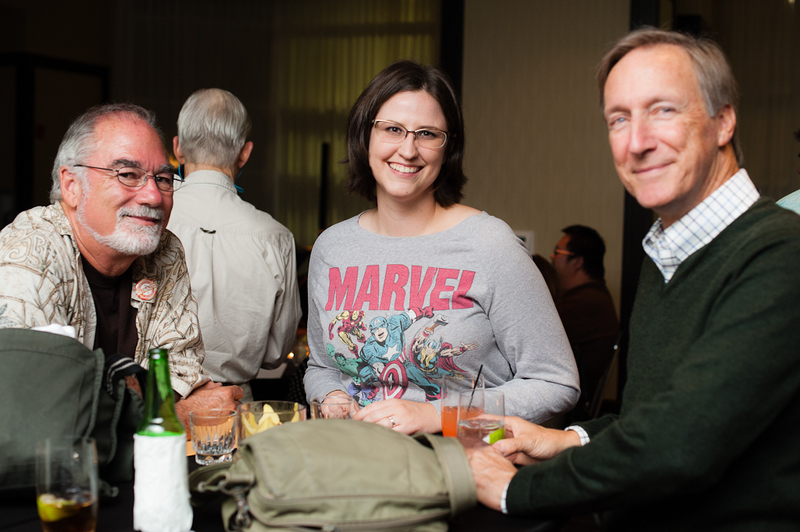 Ana Reinert got to take some time off the Andersons table to see what’s going on at the meetup. 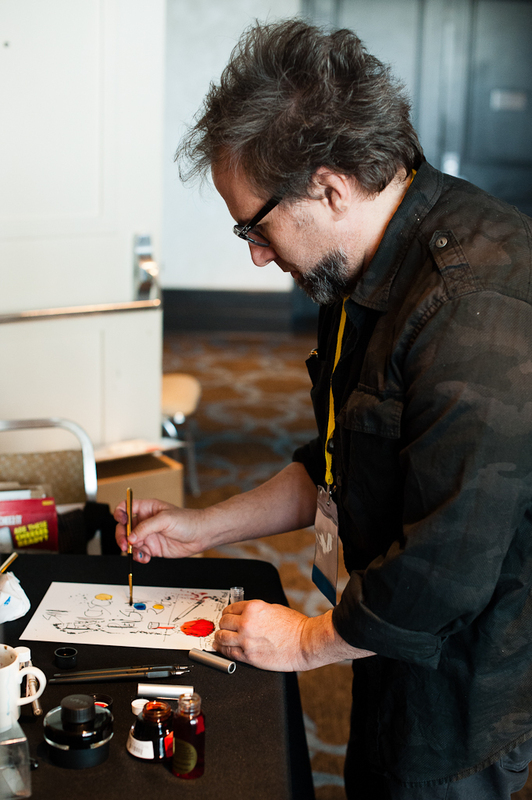 Quickly scoped out Joey Feldman as he was painting his poster artwork for people who bought at the Vanness table. 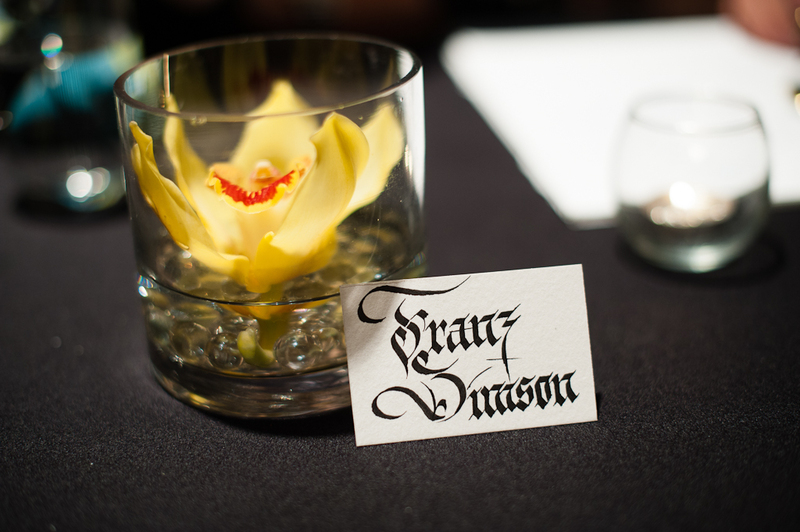 A promotional sign at the Vanness table. Joey’s workspace behind the Vanness table. Should we call this the Purple Pen Posse? 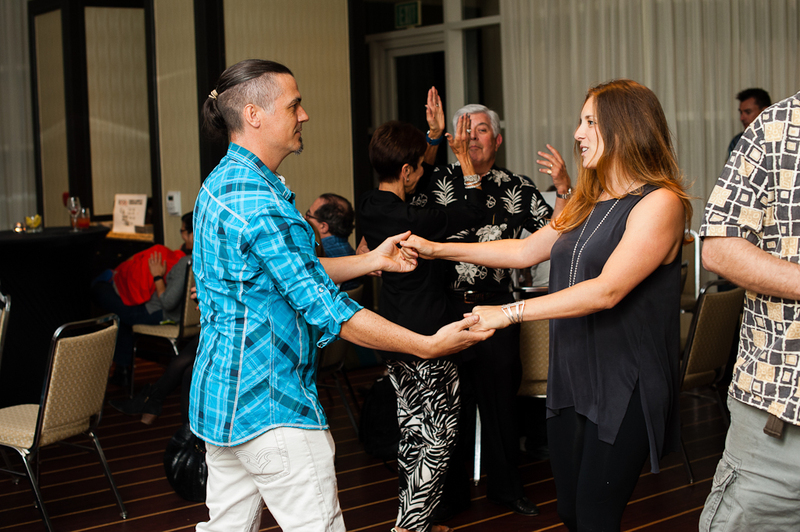 Back in the ballroom, door prizes were being raffled off. 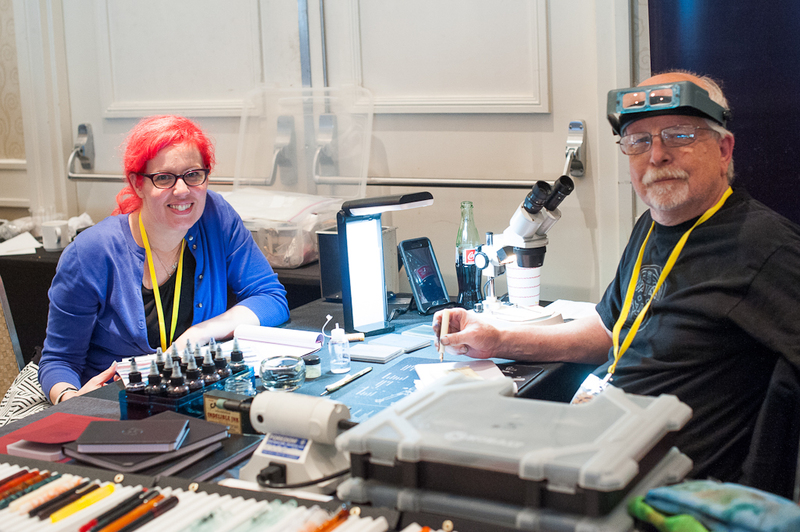 Including a very nice Pelikan M205 in Transparent Blue sponsored by Dan Smith, The Nibsmith. Syd and Judi raffling off door prizes. 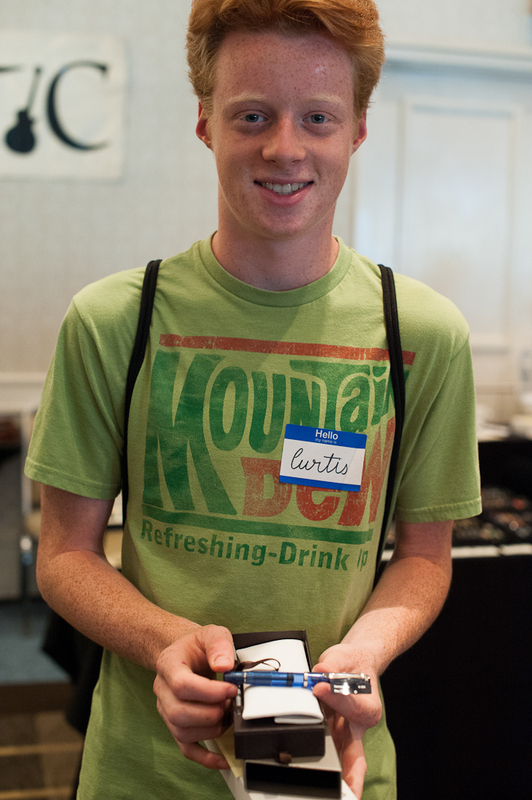 Curtis was the lucky person to win the Pelikan pen from Dan Smith. Curtis brought his family to the show. 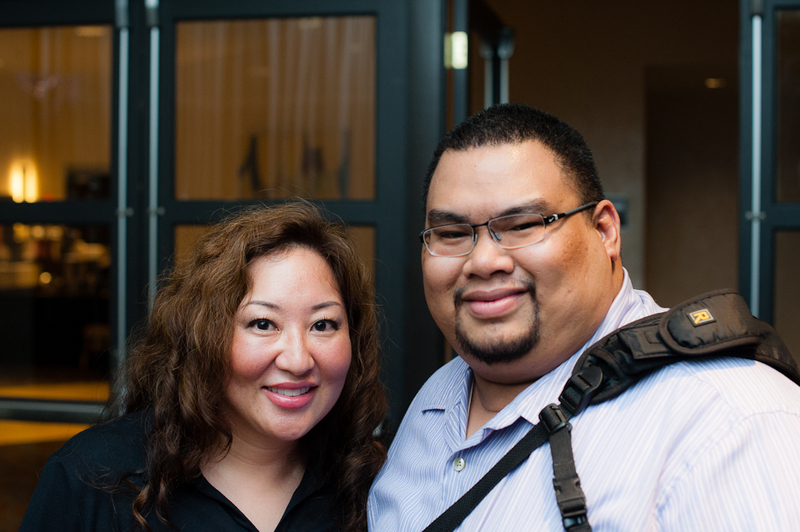 Actually, I met his Mom and Dad earlier at the Planner meetup. What a cool win! Curtis, and Dan. Congrats on that pen! Curtis at Dan’s table. 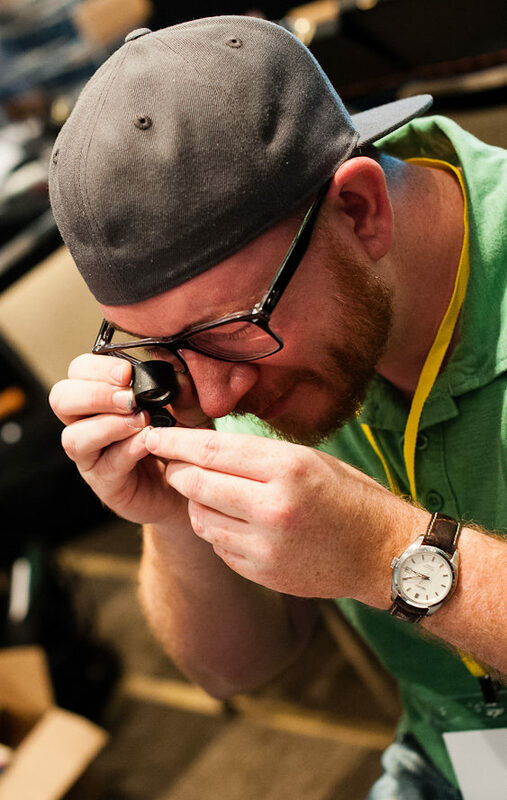 Along with winning the pen, Dan included a free nib tuning, or a grind of choice. On Saturday, the show ended at 7:00pm. I had the pleasure of having dinner with my Mom, Andy Lambrou, and his associate Margie. We immediately left the hotel and proceeded to the city of San Mateo where the Vietnamese restaurant named Ben Tre was located. I brought Andy to this place last year and he wanted to come back. Needless to say, we had an enjoyable and relaxed dinner. 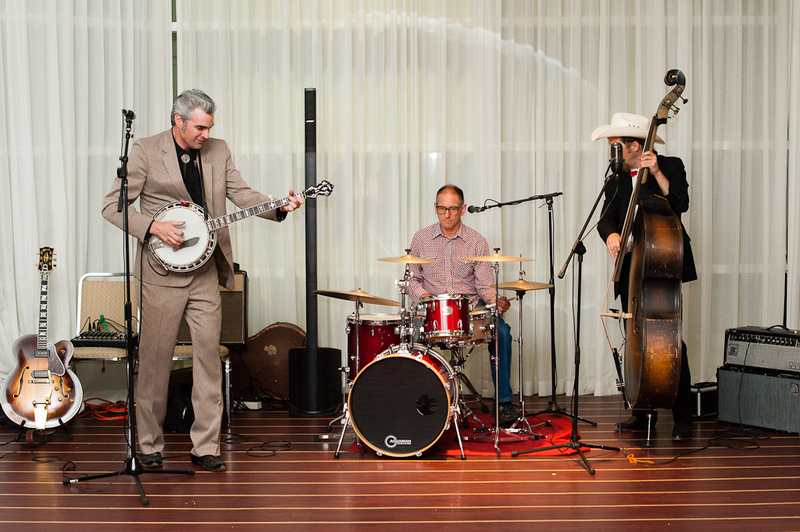 From the restaurant, we went back to the hotel and enjoyed the music of the Royal Deuces band. 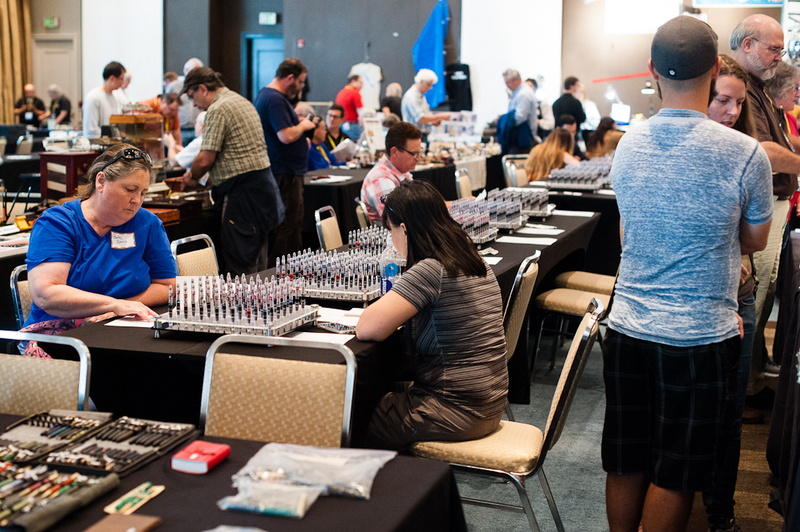 This is their third time to perform at the SF Pen Show. 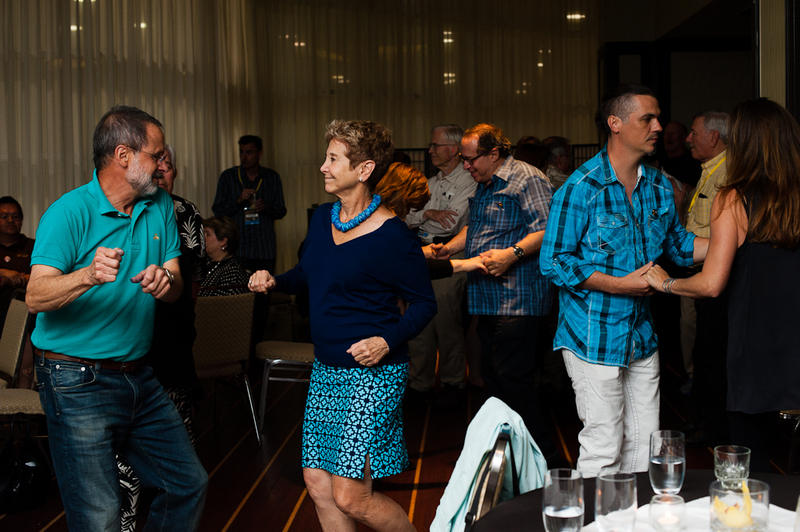 A lot of fun was had at this after-show event! When the band was done, conversations still went on. 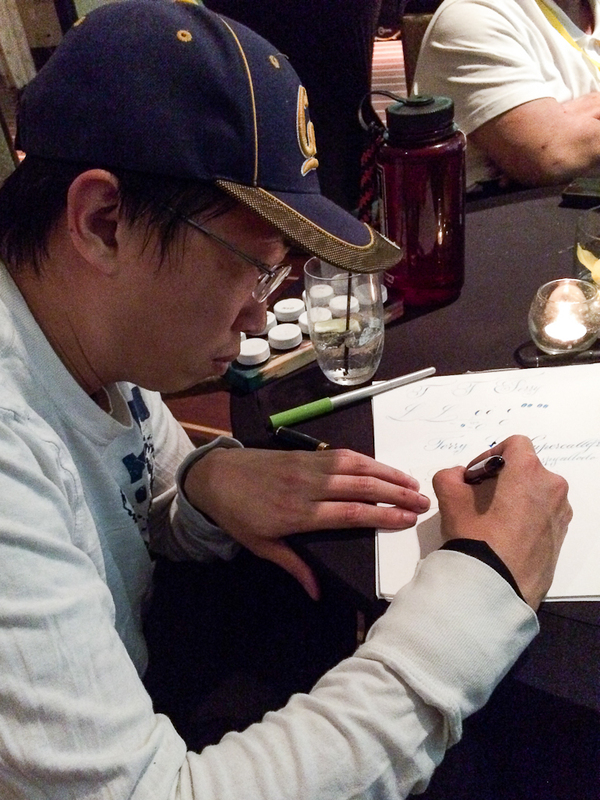 Nikola Pang was there and was writing people’s names to give out. He wrote my name down and gave the card to me. Thanks Nik! After some time, the room slowly emptied out and I went home. Nikola Pang. 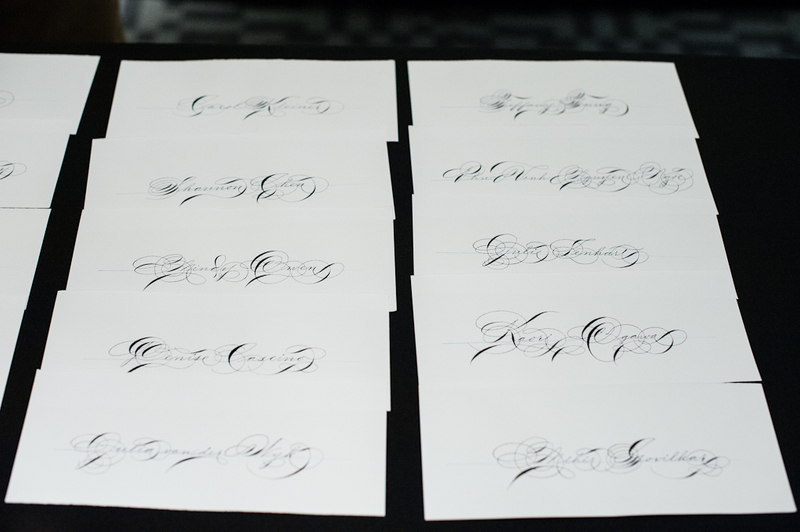 He taught a seminar on Copperplate on Saturday. My name never looked better! Time flew by quick! There was an overall feeling of happiness and a bit of sadness because we knew that this special event would be coming to an end. I arrived right before 10:00am when the show opened to the general public. After helping out at the registration desk for a bit, I did my rounds of the show once again. I bid my friends Mary and Jon goodbye as they had a long drive to Southern California. 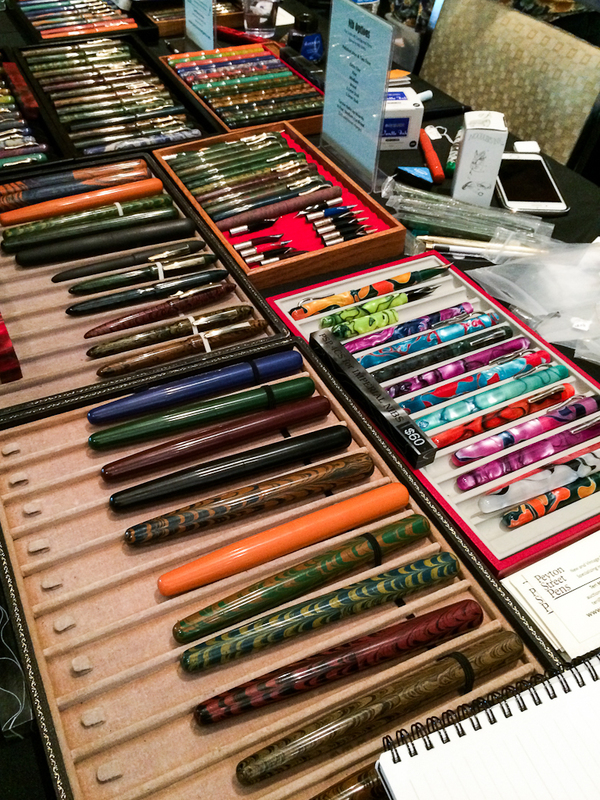 It’s always a delight to see them at the LA and SF pen show. Me with Mary and Jon. Photo by Ricky Chau. The traditional selfie with Sam Fiorella finally happened and Frank joined in! 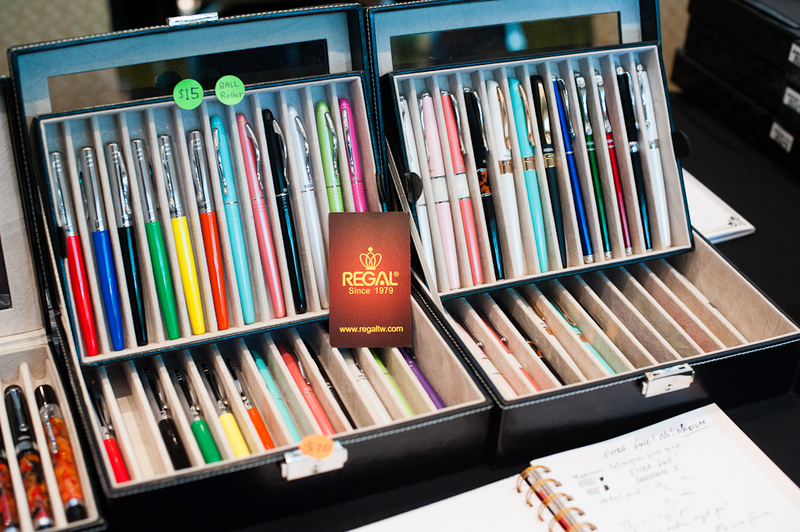 Rick Propas, The PENguin, always brings a beautiful array of german pens. Namely Pelikan and Montblanc. 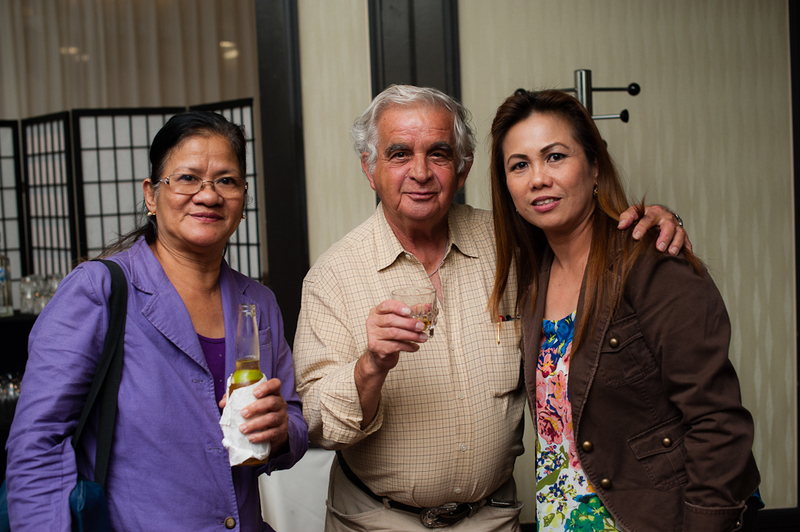 Rick Propas with customers. 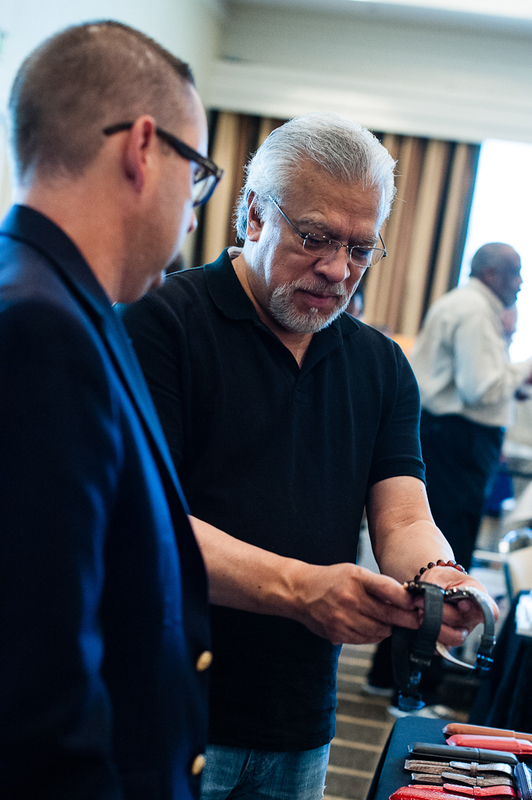 Phillip always helps him out at his table. 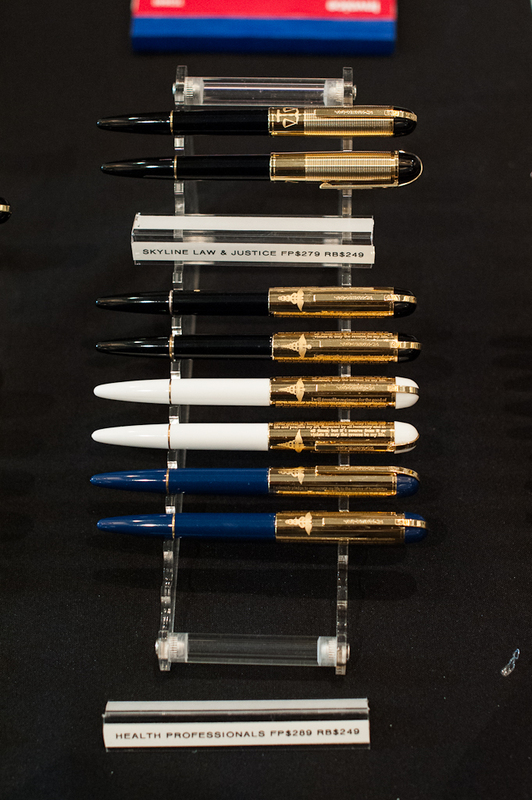 A beautiful flock of vintage and modern Pelikan pens at Rick’s table. 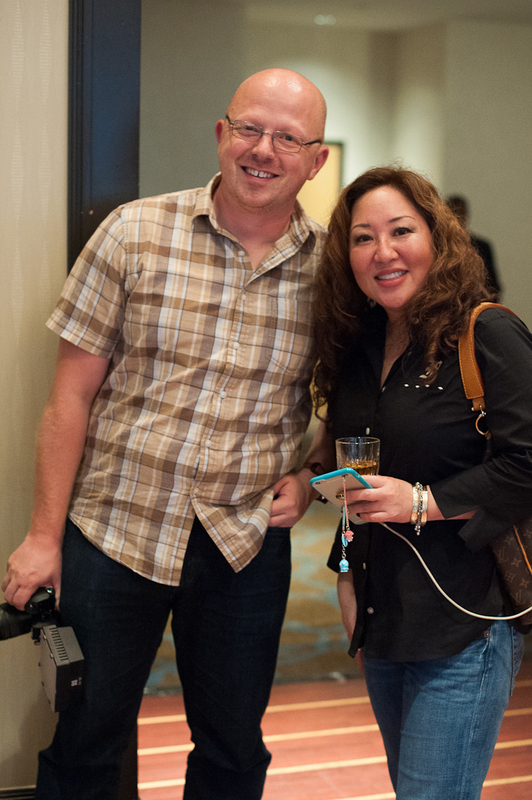 John Corwin of Flexinibs was talking with Julie who flew in from New York just for the show. 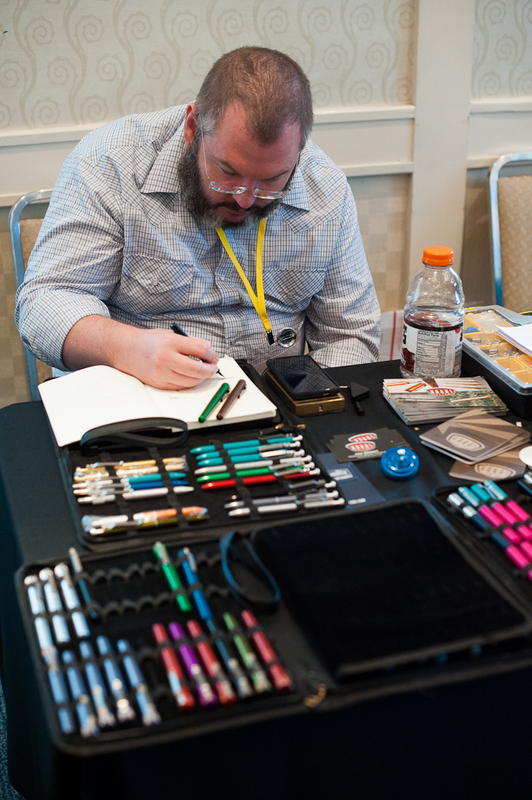 Dan of Karas Kustoms testing out some of the pens they brought to the show. My friend Frank came to the pen show to check it out. I think some watches found him. 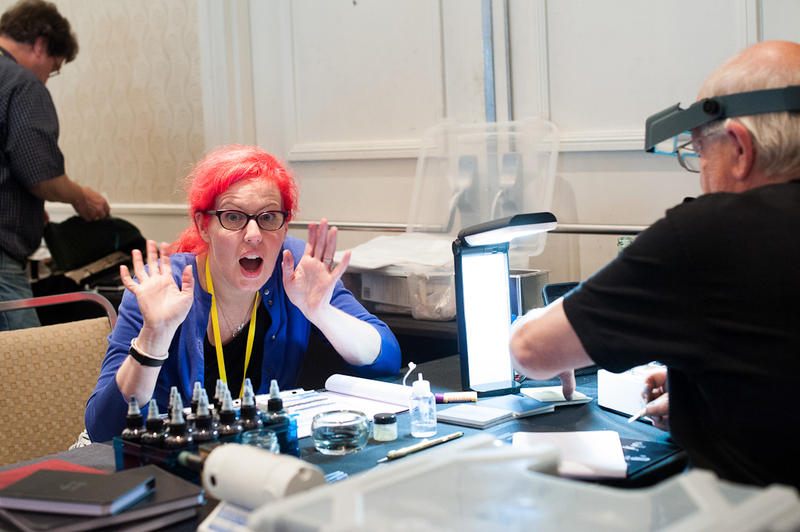 The ink testing stations are still popular even on the last day. There were more door prizes raffled off. One of them was a TWSBI pen sponsored by Sunny Koh of Straits Pens. 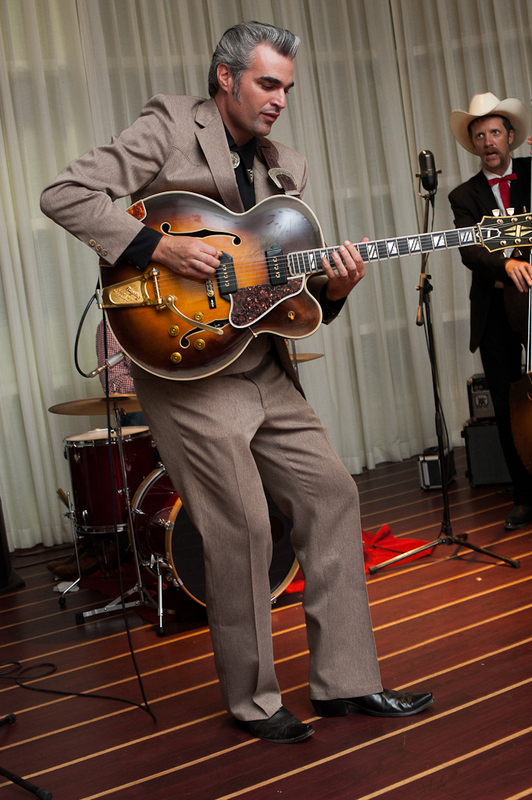 Mario of Toys From the Attic was the bullhorn on Sunday. This little girl was so cute and helped to pick the winning numbers. 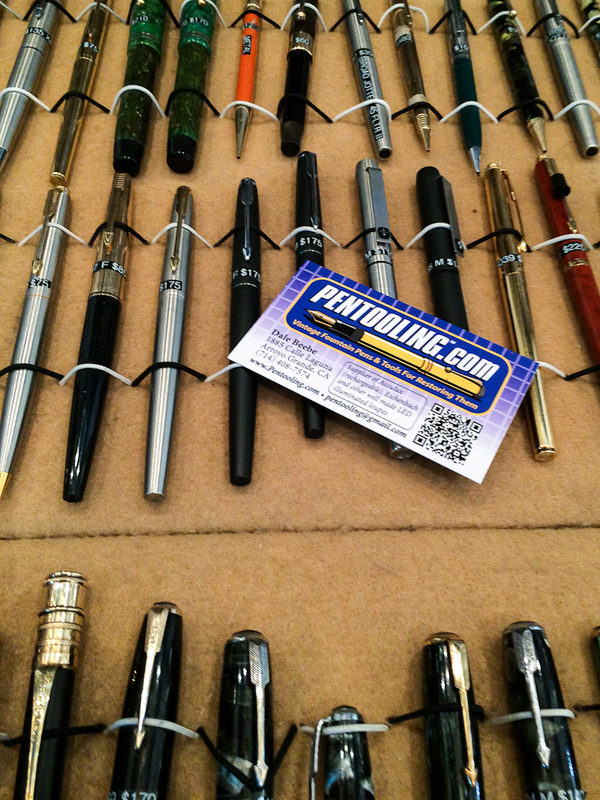 Wandering around the room, I found Dale Beebe’s table of Pentooling.com. 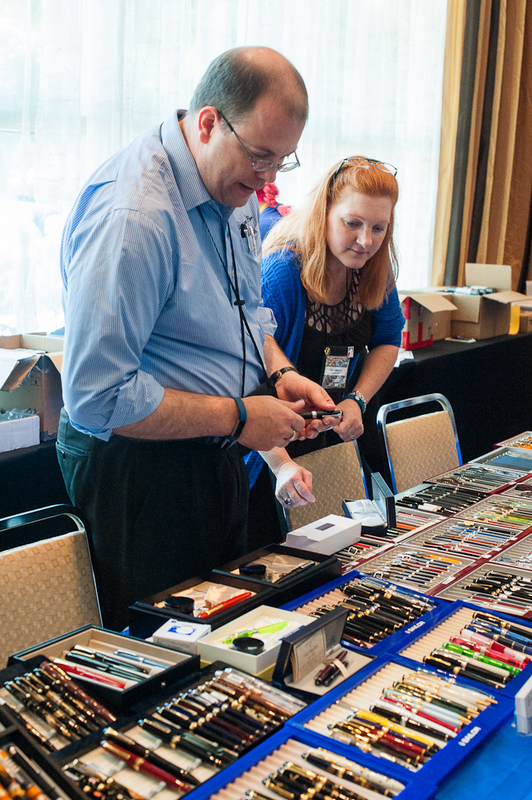 He had lots of pen repair tools and fully restored pens for sale. 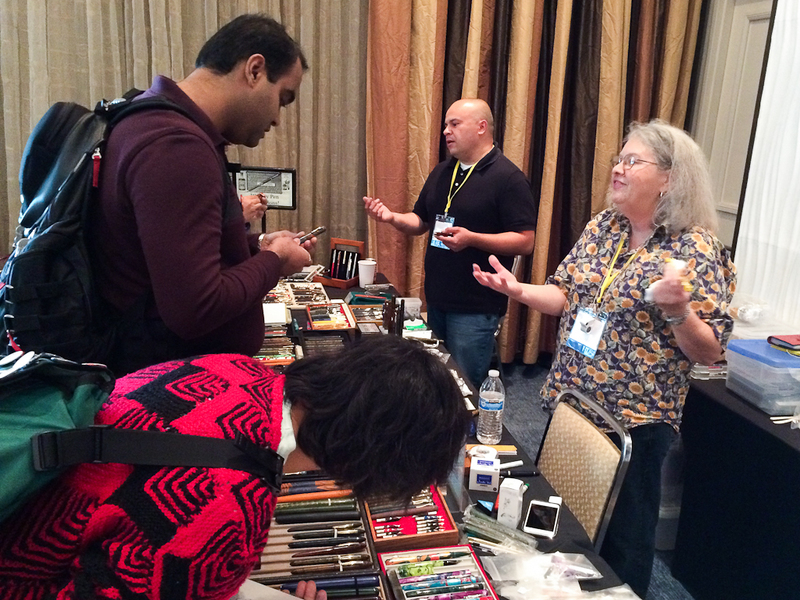 Right beside Dale Beebe was Teri Morris’ table, Peyton Street Pens. They’re located in Santa Cruz, California and is a part of the SF Pen Posse as well. 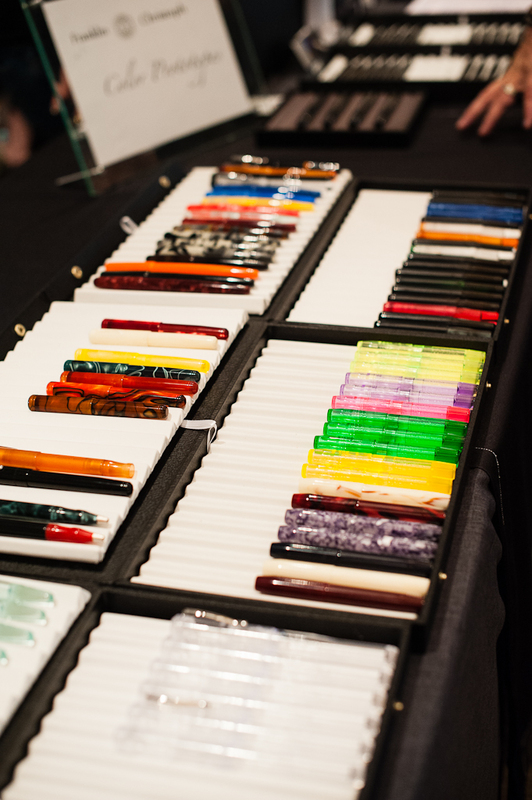 Peyton Street Pens display of ebonite pens. 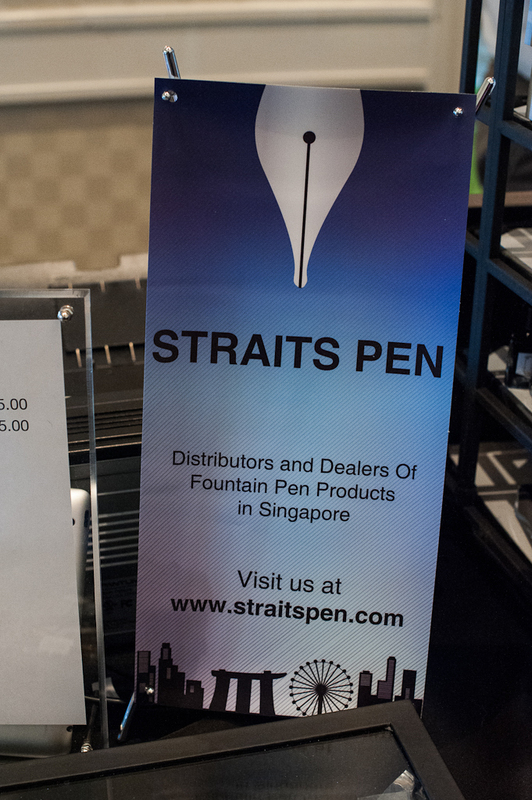 Sunny Koh of Straits Pens was a show sponsor and is also a frequent visitor of the SF Pen Posse. 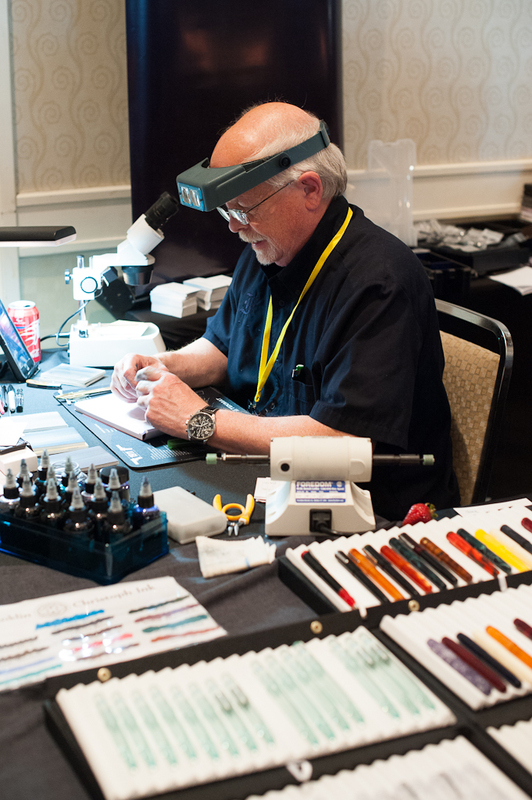 He brought pens , lots of Pelikan, Pilot, and limited edition inks from Japanese pen shops. Straits Pens also has an exclusive Noodlers ink called, Pacific Dawn at the Golden Gate which was launched at the SF pen show. Walked away from the show to have a cup of coffee at the hotel bar with my friend Frank before he left. Ana and Jim. I finally got a photo of Jim smiling at the camera. And that’s the last day of the pen show folks. It’s 4:47pm and the doors close at 5:00pm. 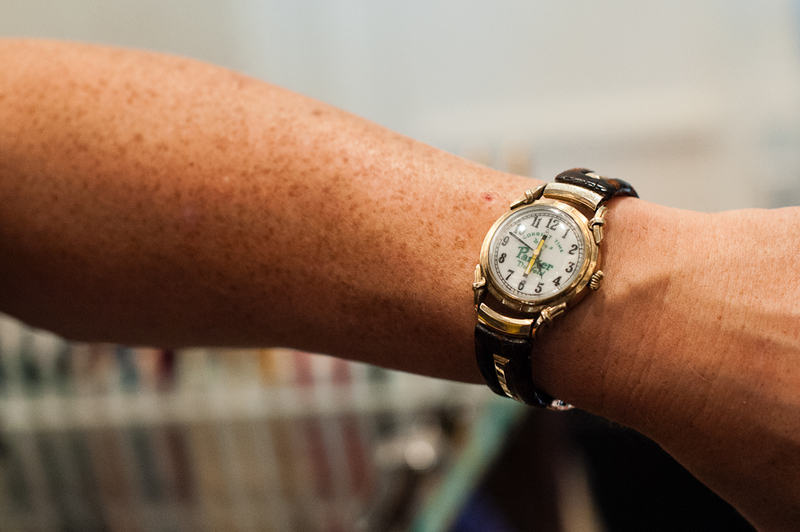 The watch face says, “Correct Time to buy a Parker Duofold”. So true especially when you’re in “Pen Show Time Zone”. We met up at Amici’s Pizzeria once again for dinner and discussed the events of the show including details for next year. 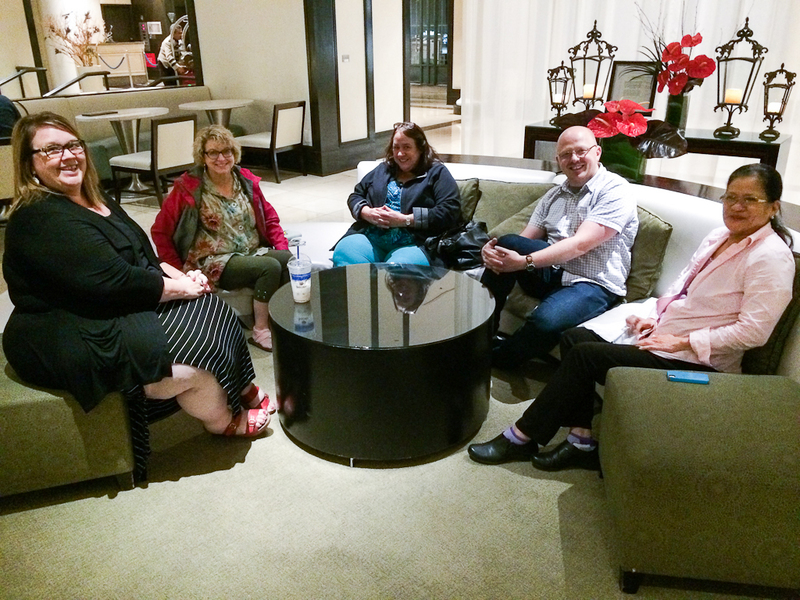 Back at the Sofitel hotel after dinner and just hung out with pen-minded folks. Terrific time to keep on having conversations and do some show-and-tell of what they acquired from the show. 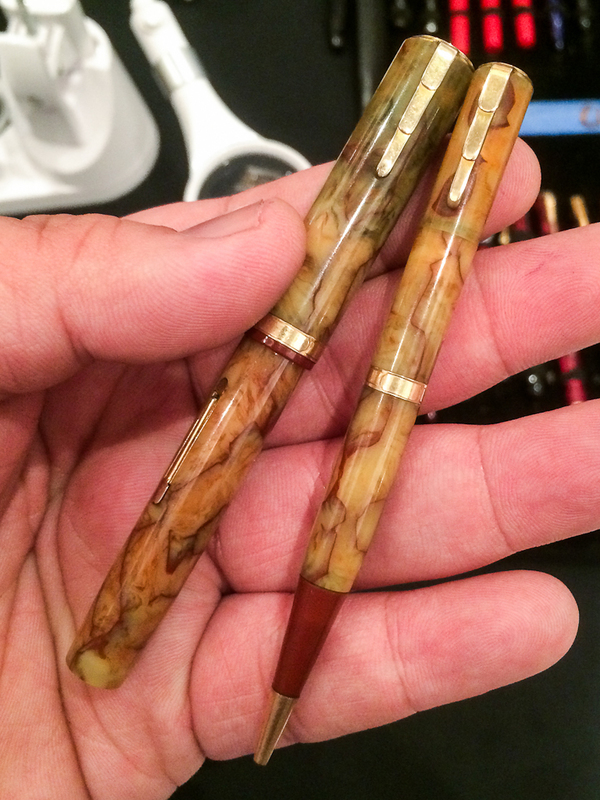 Show and Tell: Another friend from Southern California bought a Visconti Homosapiens London Fog. Man, this pen is beautiful! 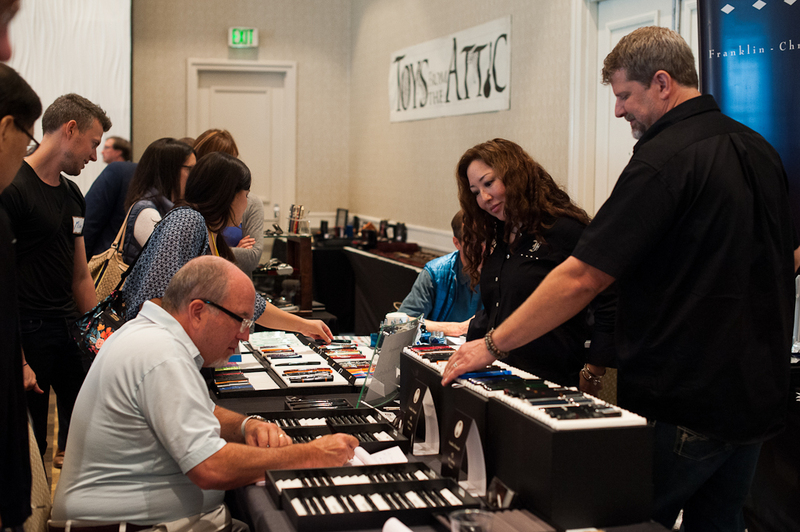 Pen shows are such a fun event to attend. Most especially when it’s local in your area. 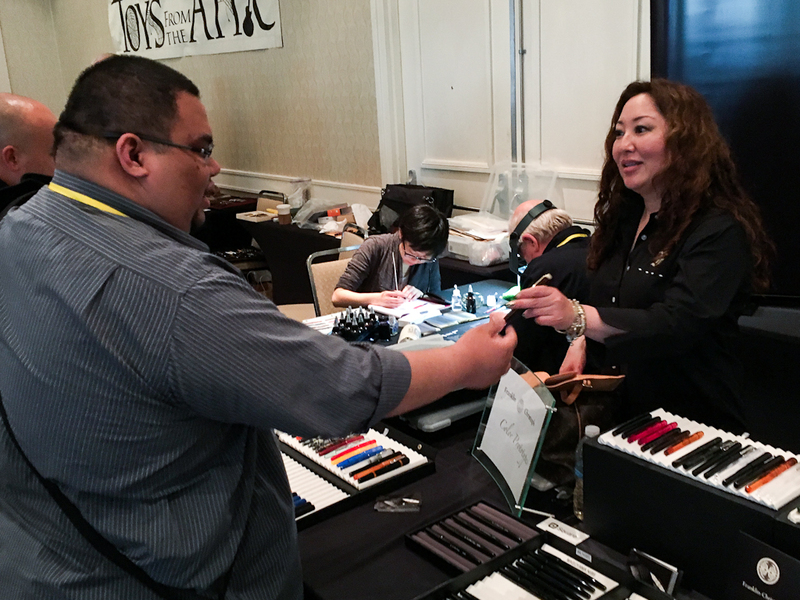 The 2016 San Francisco Pen Show was such an enjoyable weekend filled with beautiful pens, lovely inks, terrific special events, and most especially, generous and kind people. It was magnificent to see old friends get-together and see each other once again and I appreciate the chance to form new friendships. I look forward to this show every year. A HUGE Thank You to Ricky, Todd, and Syd for continuing to organize this show. In addition, to all of the people who have contributed to its success, I thank you as well. 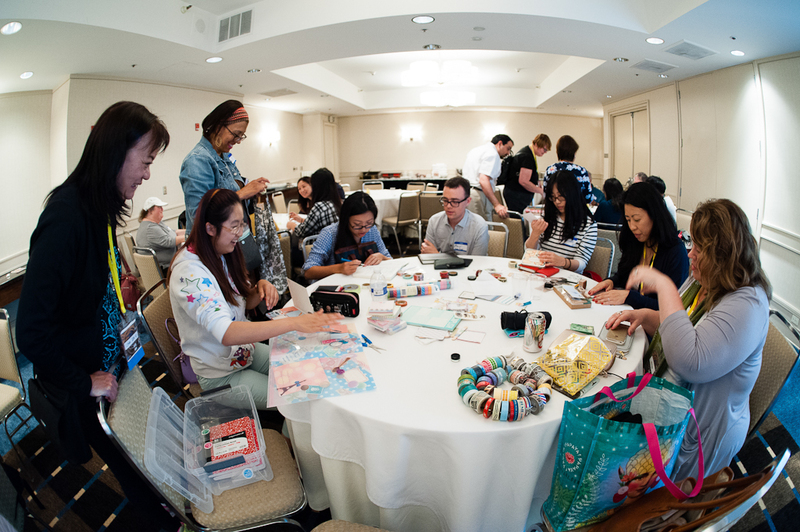 To the awesome SF Pen Posse, thank you for all the effort and the volunteer work. Without you guys and gals, well, it wouldn’t have been as fun. Well, until next time. Thank you for sticking to the end of this long report. I hope it wasn’t dragging and also that your snack was enough. 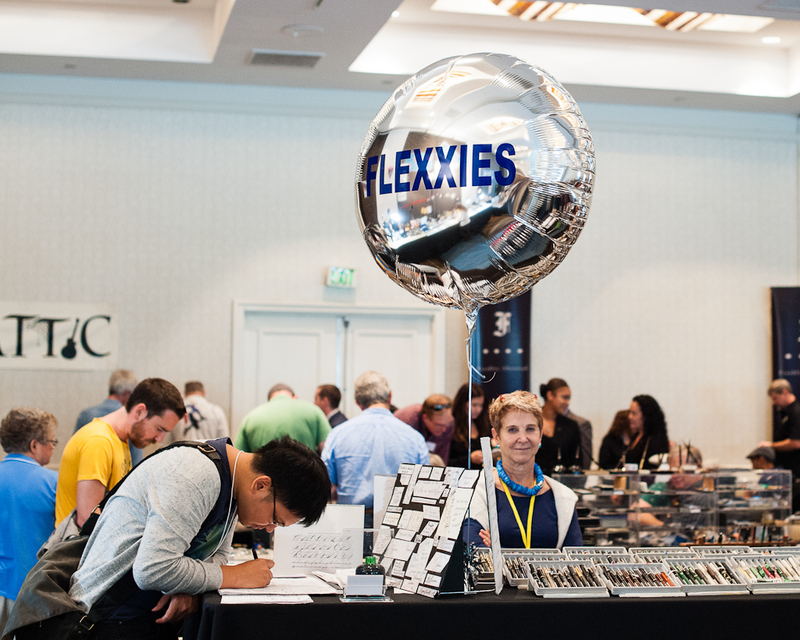 If you attended the SF Pen Show, feel free to leave a comment for any of your thoughts about the show and also what you bought! Sunset sky for August 28, 2016. A lovely way to end a superb weekend. Whoa. It’s been a couple days now, and I’m already excited for 2017 — August 25 to 27! Mark your calendars! Here’s my entire haul. Yep, that’s it. Just three things. I’m very proud of coming out of the show UNDER budget. I woke up on Friday at 5:45am to pick up a friend at 6:15, despite flying in from Hawaii the night before. I thought I’d be super sleepy (~8 hours of sleep in the two nights before) but I wasn’t. I guess pen show excitement does that! 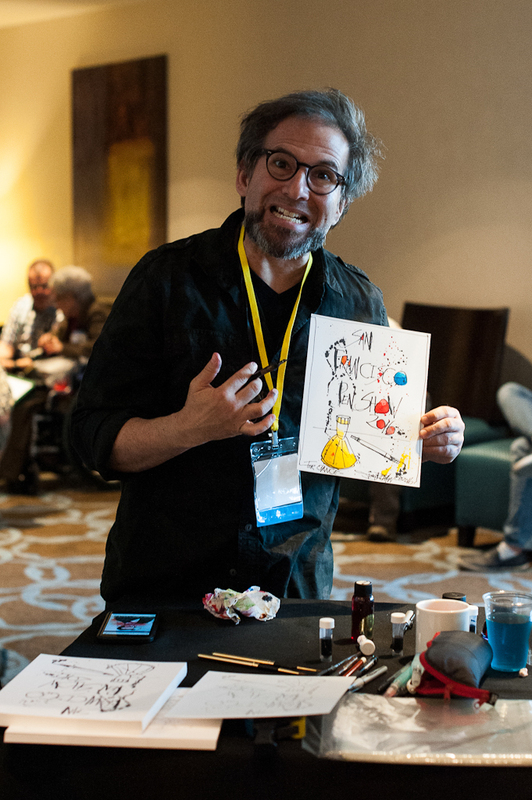 I ran a little bit late (got distracted posting about the new Noodler’s ink to Reddit) but made it to the show in good time. We arrived at around 7am, before most of the dealers had set up. 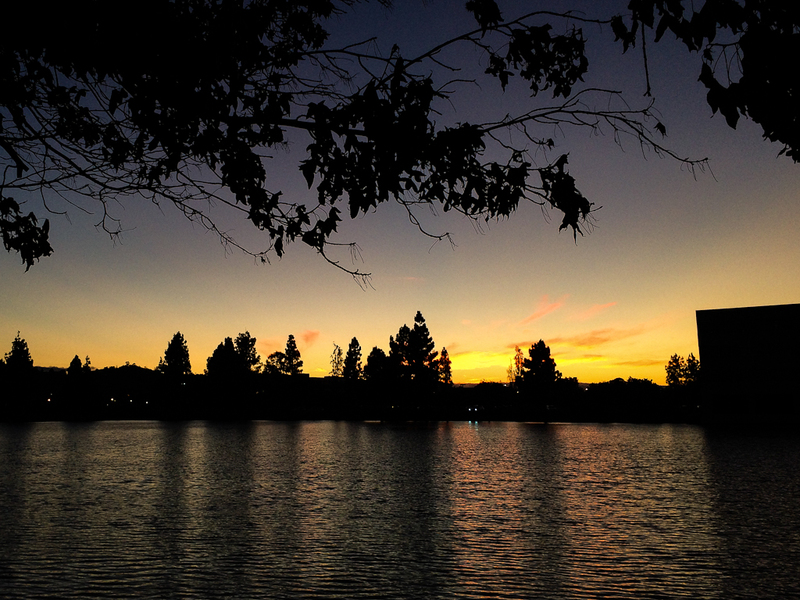 It was a nice time to walk around before everyone was set up since that was a lot less overwhelming. 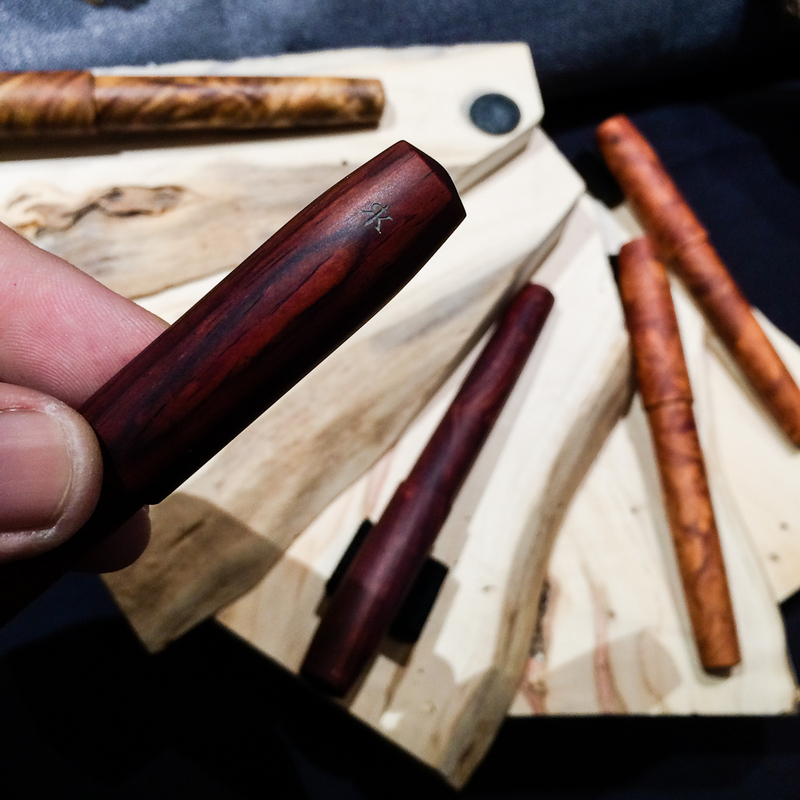 I met Troy from Brute Force Design and admired his pens (I love the look of all-copper pens, but unfortunately they’re just too heavy for me!) 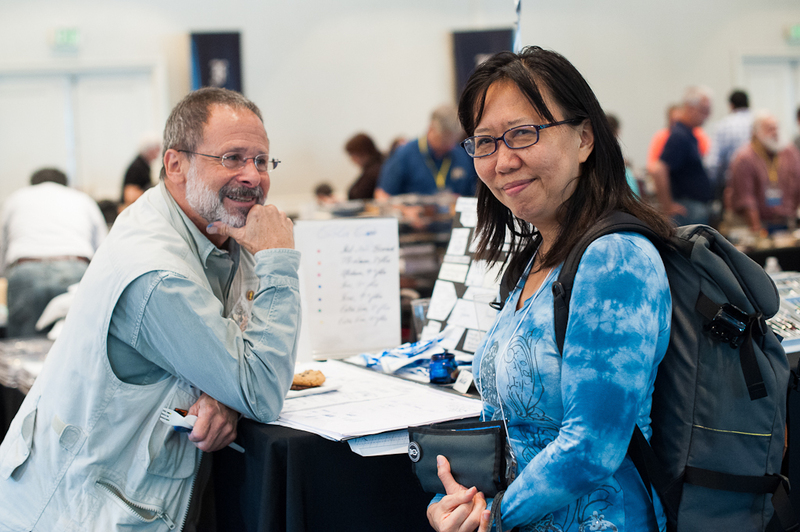 while we both kept an eye on the Franklin-Christoph booth and talked about pen turning (my lathe is showing up in the mail today…). 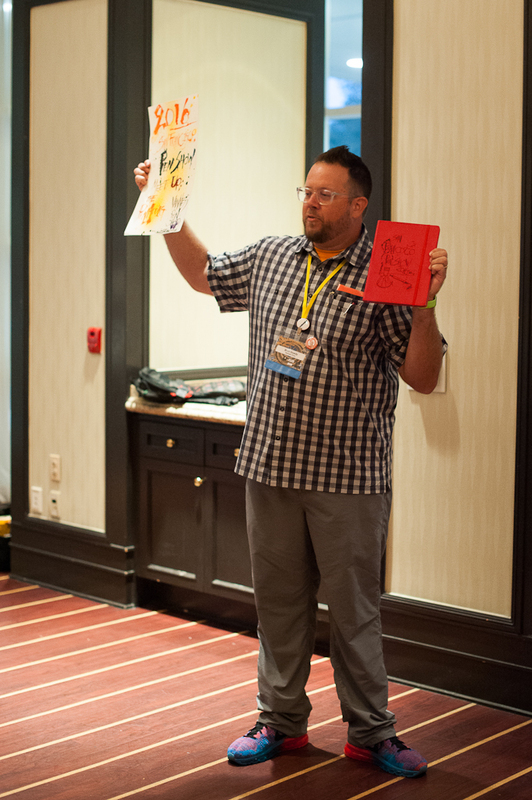 Scott (of FC) showed up sometime between 8 and 9am with the hand carry suitcase full of prototypes and I pounced. I picked out a lovely “prototype” in a unique orange-and-cream swirl material. FC never gave it a name since they only made 1-3 pens with it. 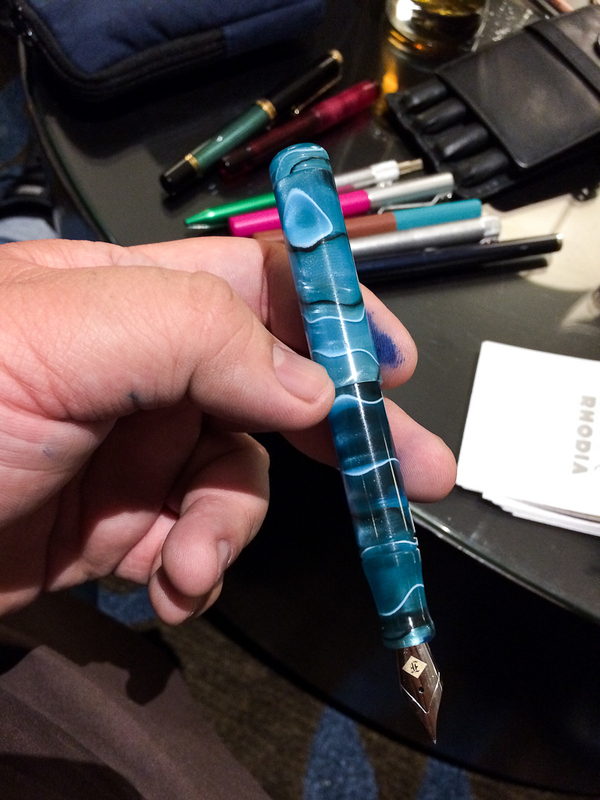 This is my first time buying a pen from FC at a show — and getting the nib tuned with Jim was fantastic! I had opted for the Masuyama needlepoint and he asked if I preferred fineness or smoothness. I went for fineness, and the nib isn’t scratchy at all but has an enjoyable amount of feedback that I can best describe by calling it “pencil-like”. After this, I made my rounds taking a look at each booth, handling pens, and testing out inks. I had my eye on flex pens and Omas pens and Wahl Eversharp Dorics — I really like the 12-faceted shape. I found my second pen also on Friday morning with Cliff Harrington, who was very, very friendly, helpful, knowledable, and had a great selection of Dorics. But, it was only Friday morning — so I thanked Cliff and swore I’d think about it a little longer. By Saturday afternoon I was legitimately stressed that someone else might buy “my pen”, so I went back and bought it. It’s a second generation Doric in a striated black material with a #9 adjustable nib. It goes from a smooth medium stub to a a wet BB-BBB. I’m very happy with the pen and Cliff was great to work with! All in all, I had a great time and I managed to stay under budget*! 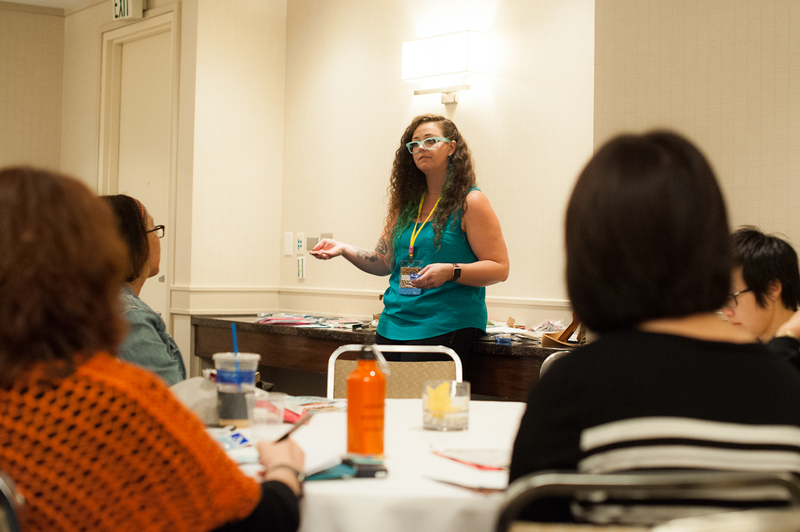 I’m very excited for next year and am full of ideas for new workshops and maybe even being a vendor! Did you find the pen of your dreams at the SF Show? 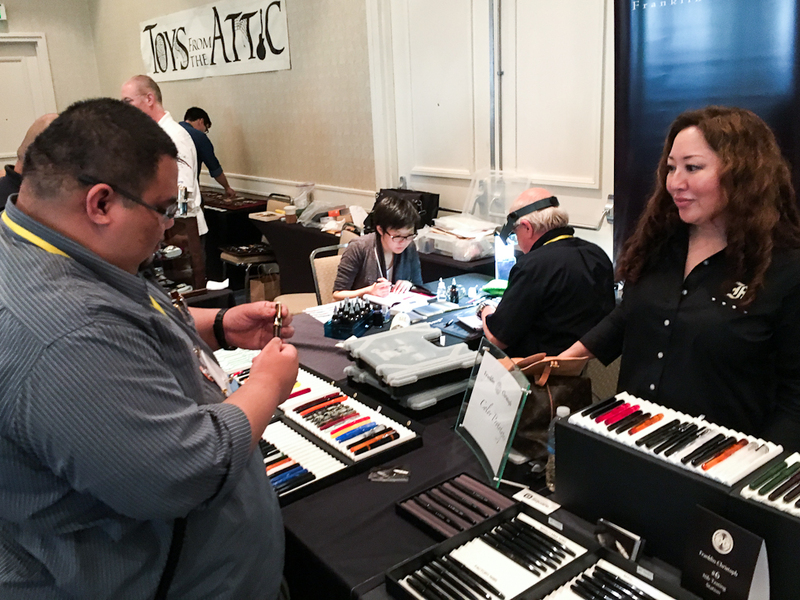 2016 San Francisco Pen Show: What are you looking for? 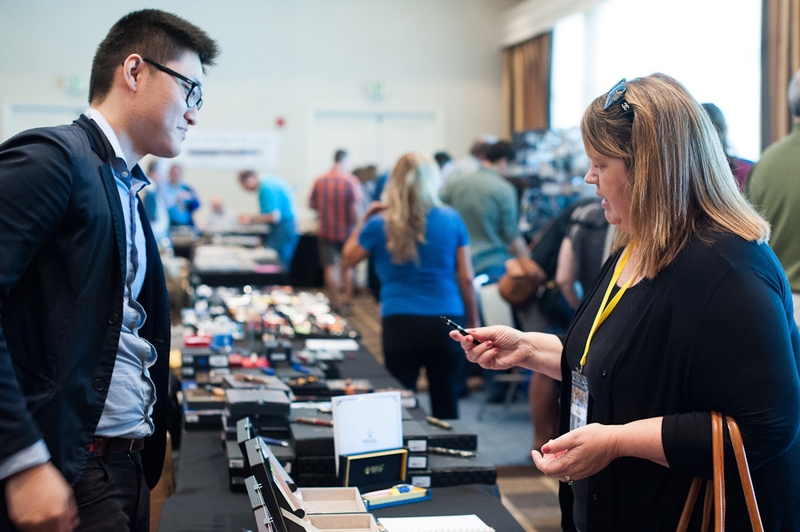 The SF Pen Show is less than a week away! 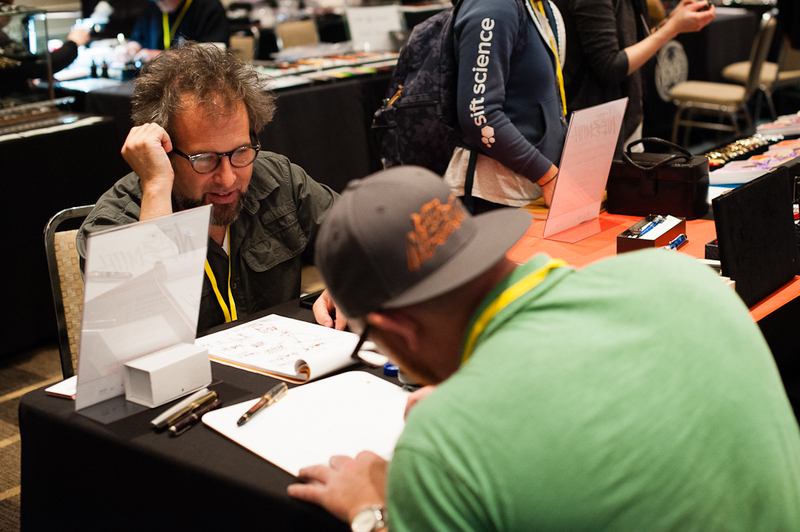 There will be dozens of vendors, ink stations with over 600 inks & classes and meet ups. What are you looking for at the show? 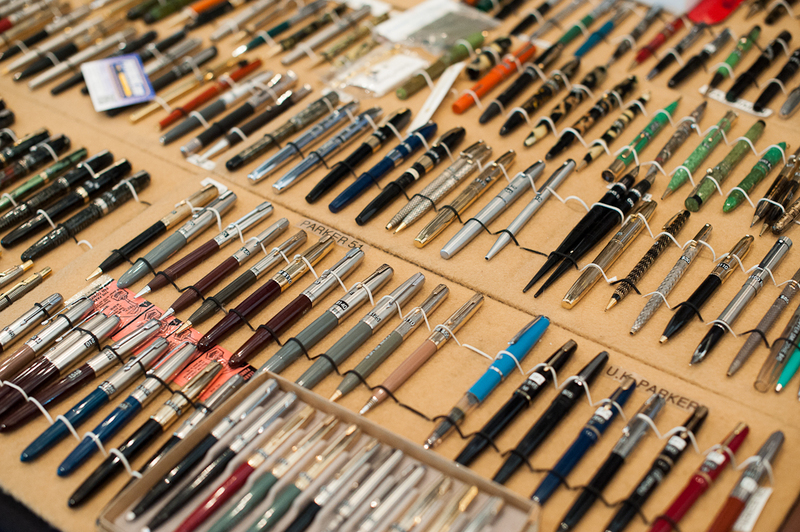 On the buying side — I’m primarily looking for interesting pens, but don’t have a well-defined wish list. My focus is going to be on picking up a reasonably priced Omas (fingers crossed), and perhaps a new flex pen or nib (I have one with a nib I like, but a body I hate. hah!). I’m also very much interested in pens made with interesting materials (I do love those vintage celluloid pens!) and nibs (I’ve recently been very curious about hooded and inlaid nibs). So we’ll see what turns up! I have a rough budget, and if I don’t use up all/most of it, I’m going to buy a Pilot Custom 823 with an FA nib after the show. I thought of buying it before the show and having the nib ground, but this will be an interesting way of judging whether or not I really want a pen at the show. 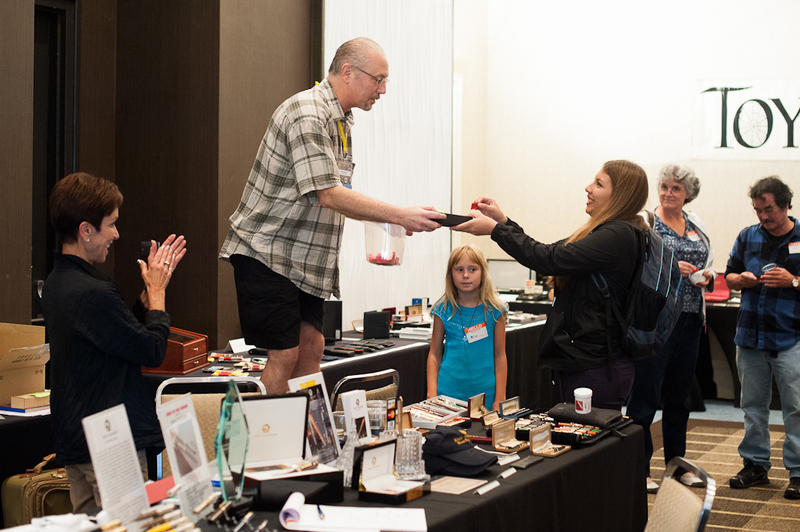 This is my second time at a pen show and I’m a little wary of getting carried away — my first show was a year ago and SF was just overwhelming! All I bought was a converter. 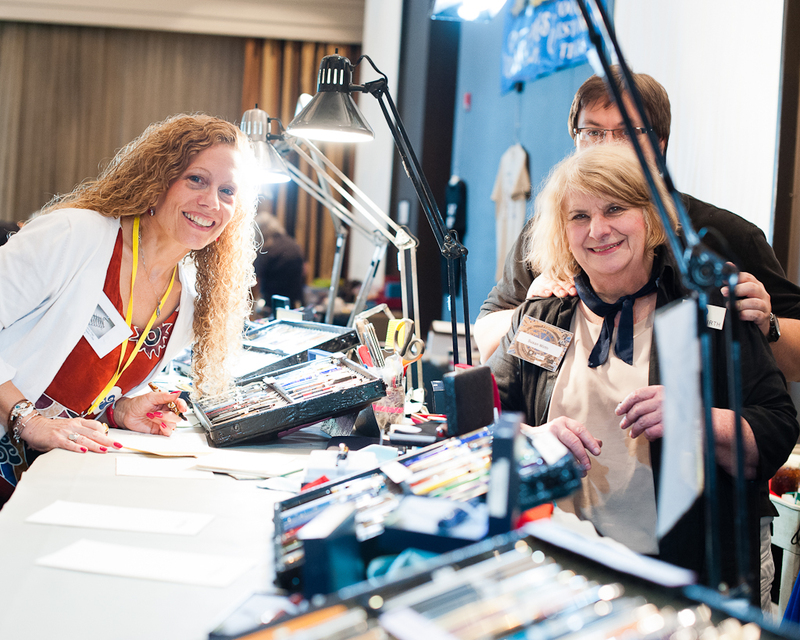 Pam: I am trying really hard to be disciplined at this year’s pen show after this past year of pen gluttony. Thank you for the strong work in pen-abling Franz and Katherine! Therefore, if all goes to plan, I will be purchasing more inks than pens. I am going to be making friends around the Franklin-Christoph table. Definitely looking to purchase a pocket 66 (in ice finish or a prototype material) and a Model 45 (in antique glass, if available at the show). My Inky wishlist includes Bungubox Omaezaki Sea, Pelikan Turquoise, J. Herbin 1670 Stormy Grey, and Sailor Yama-Dori. Additional pen lookout for a Pilot Capless with a special alloy nib, Pilot m90, Pilot myu. 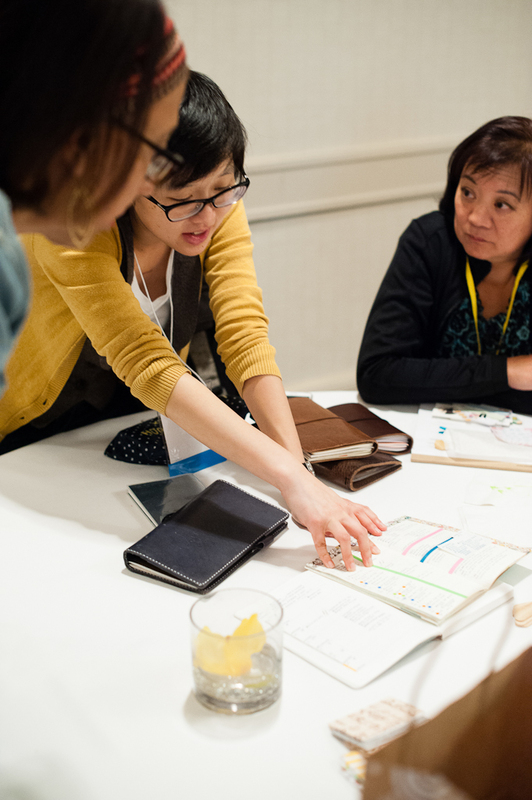 Lastly, but definitely not least, to meet planner/pen-minded people and make more planner/pen friends!! Especially at the planner meet up! Franz: Awww man! 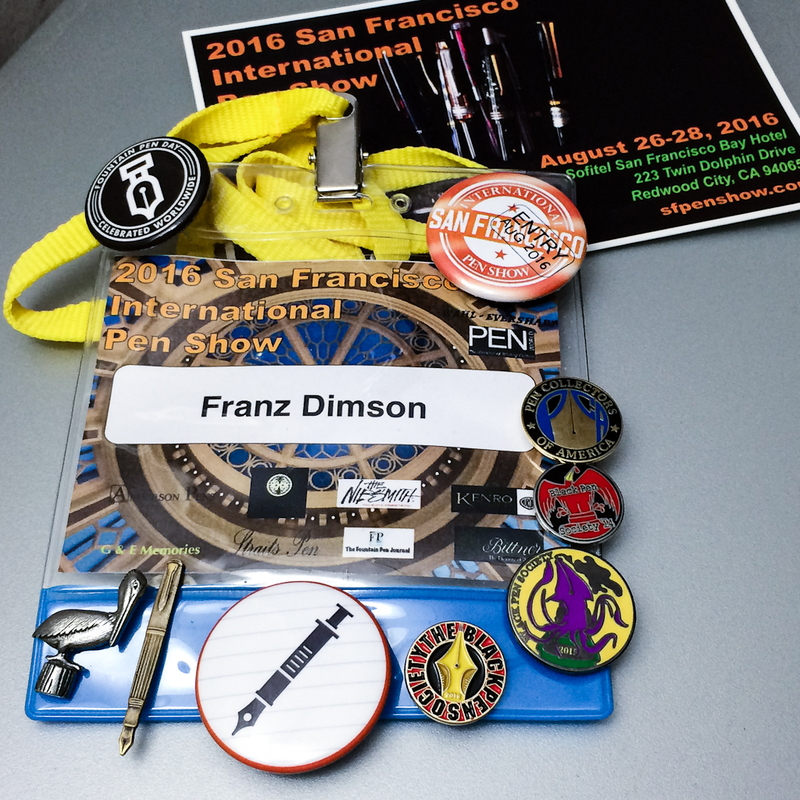 I’ve been so excited for the SF Pen Show ever since the 2015 show ended. On the final day of last year’s show, they already knew the 2016 show dates and I couldn’t wait. To answer the question of what I’m looking for at the show, I’m looking for a pen (or two) that will grab my attention and won’t let me go home without it. I don’t really have a specific list of pens to acquire but I do have a couple pens that I wanna see how it feels “in the hand”. For vintage pens, maybe a Wahl-Eversharp Doric or Gold Seal, or maybe a nice Parker Vacumatic, or a safety fountain pen. 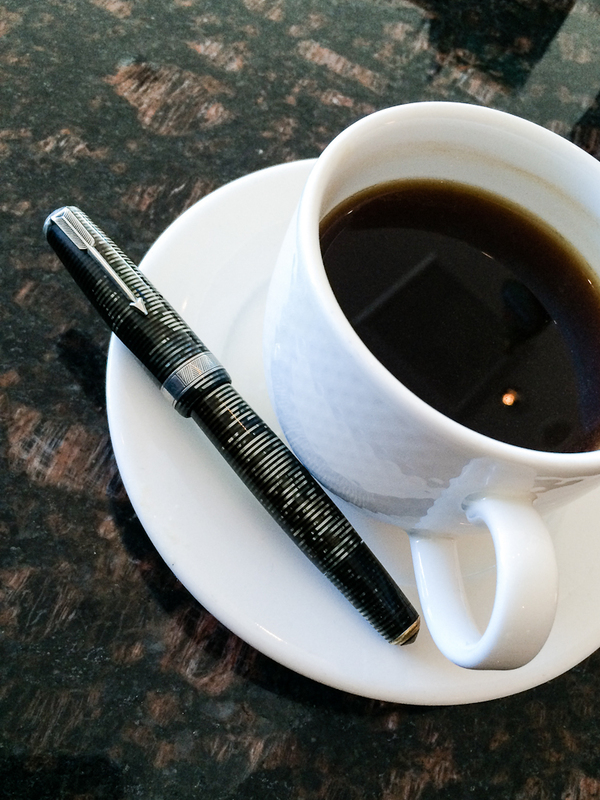 For modern pens, I want to hopefully see the Visconti London Fog in person. That pen has been popular among the online pen community for a couple of months now. Then perhaps a Pelikan pen I’ve never seen in person before. I’m also looking to sell a couple pens at the show. I haven’t decided which ones yet but maybe a couple vintage Parker pens, a couple Pelikan pens, and just other pens that other people will enjoy writing with and perhaps become part of their own collection. Hmm.. this is becoming a lengthy explanation of a very vague point. Sorry. Now onto what I’m REALLY looking for at the show. 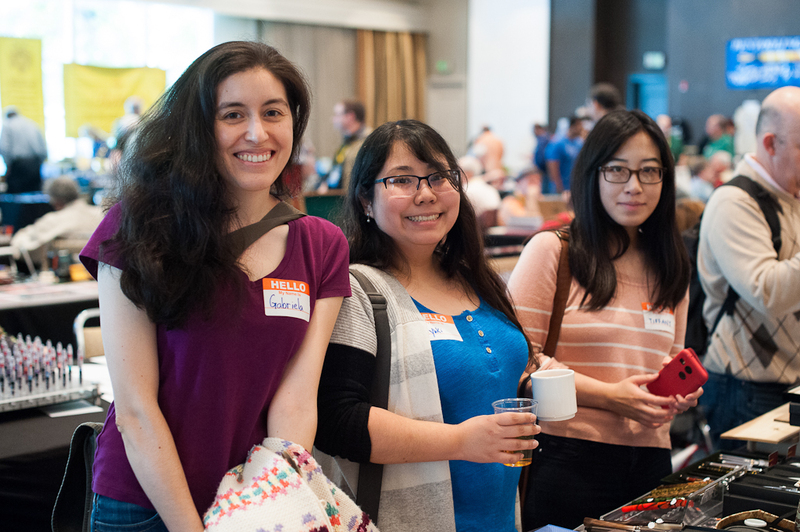 I’m looking to reconnect with old friends I’ve met from the past pen shows (SF and LA), and also to meet new friends either just from the pen show itself or meet a few Instagram (IG) friends in real life (IRL). 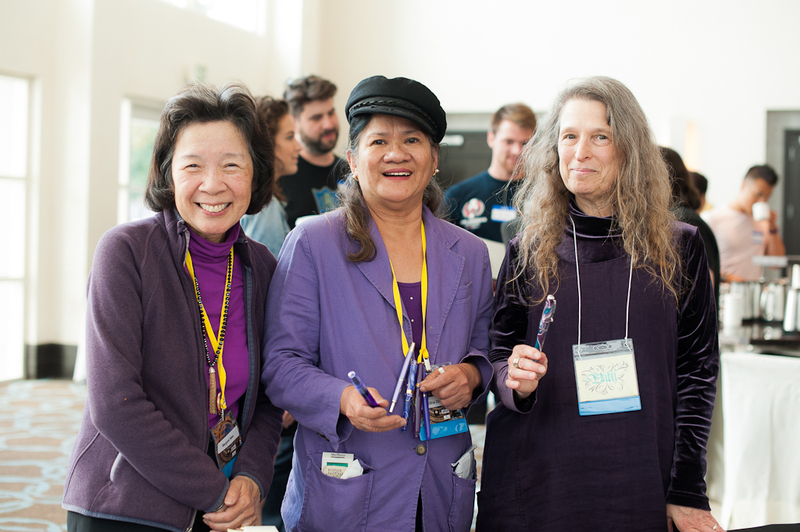 True story: I actually met Pam and her friends at the 2015 SF Pen Show while I was helping out at the registration desk. 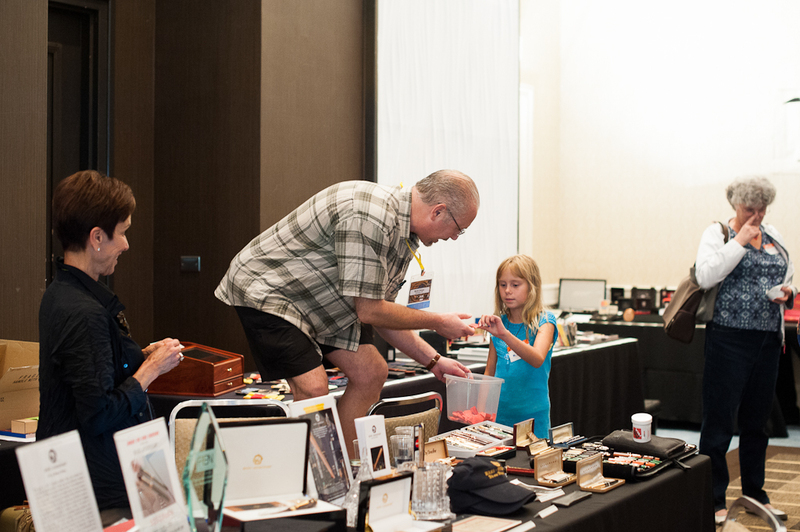 So there you go, with each pen show I attend, I am blessed to chat with people and gain more knowledge about this great hobby of ours. I will try my best to post photos on Instagram during the pen show. The Instagram tag used is #sfpenshow2016 and #sfpenshow as well. 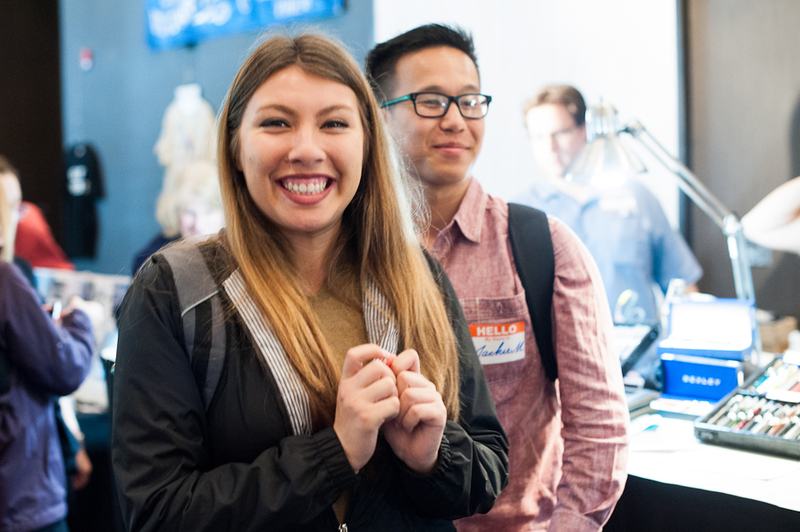 We’re looking forward to all the fun things planned like the free seminars, the planner meet up, the letter writing social, and many more. 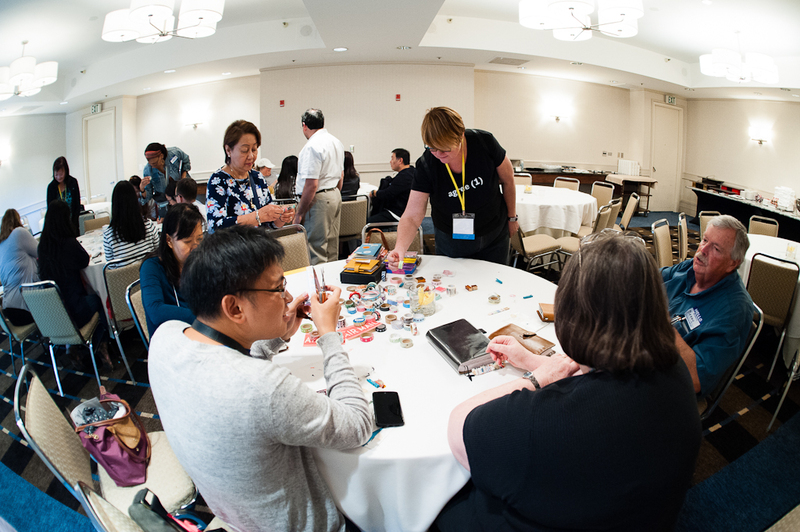 Even after the show closes, there is a Pen Addict meet up on Friday at 7pm. 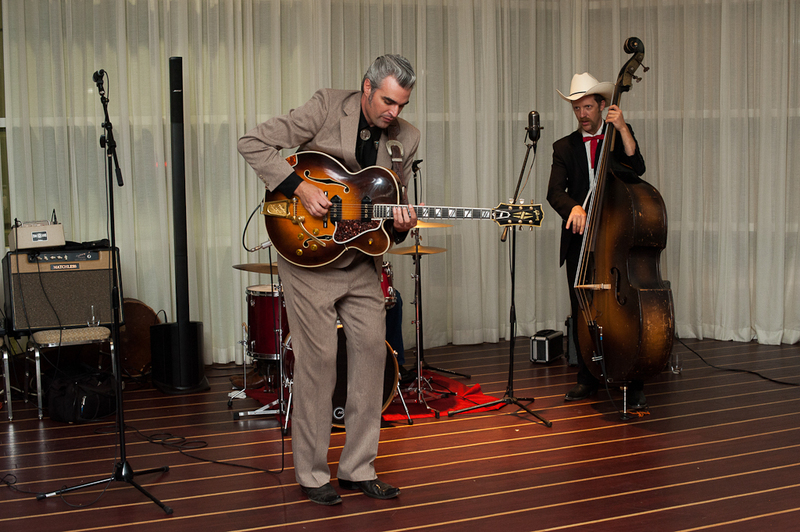 And then on Saturday night, the Royal Deuces band is performing live music at 8pm. 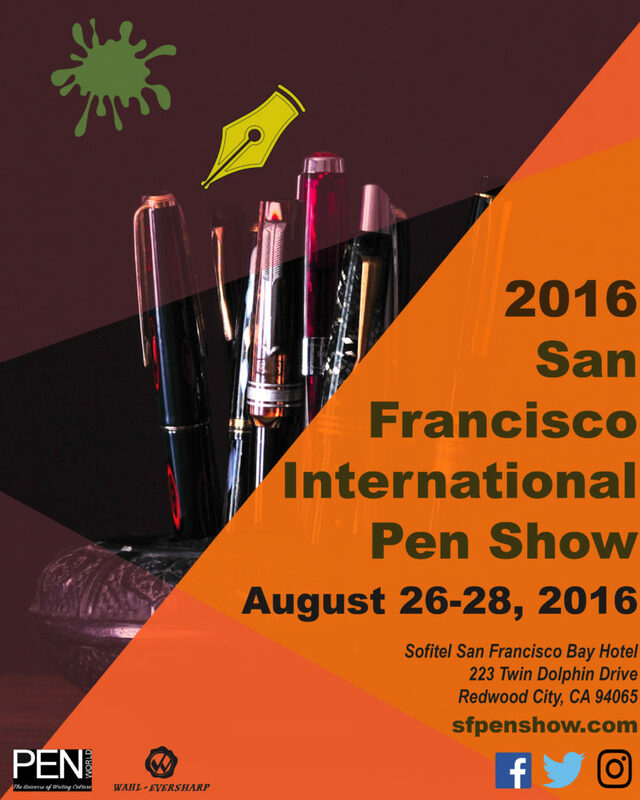 So if you’re able to attend the 2016 SF pen show on August 26, 27, and 28, please do and we hope to meet some of y’all! Thank you! P.S. 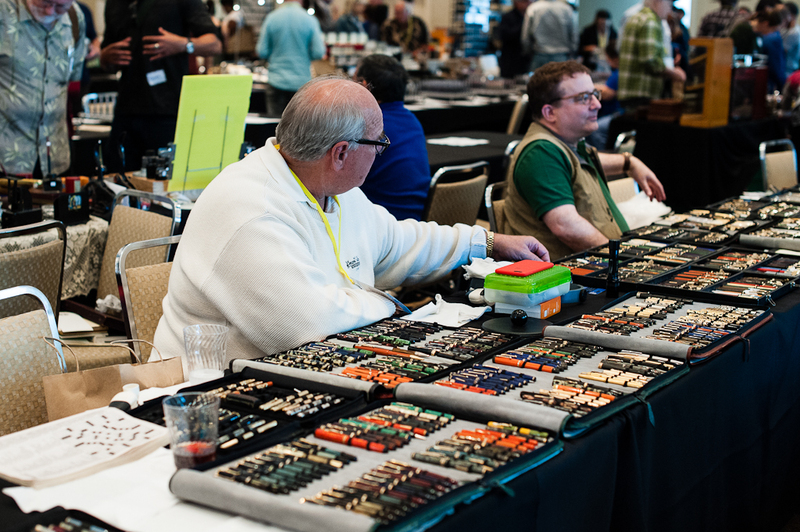 If you will be attending, what are you looking for at the San Francisco Pen Show?